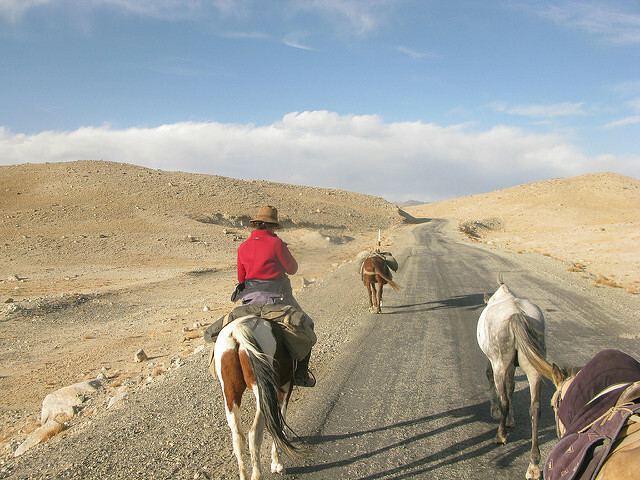 The journey is split up as follows. 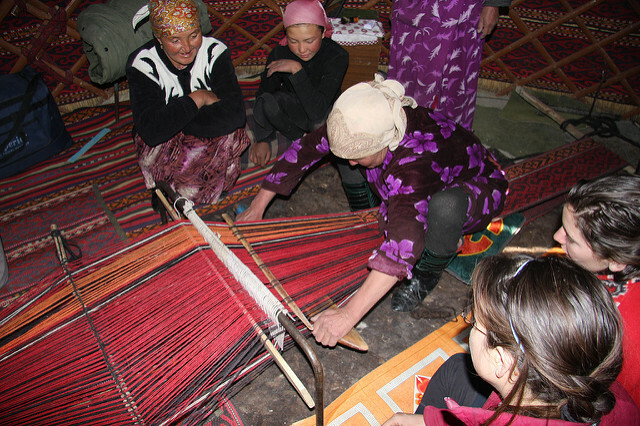 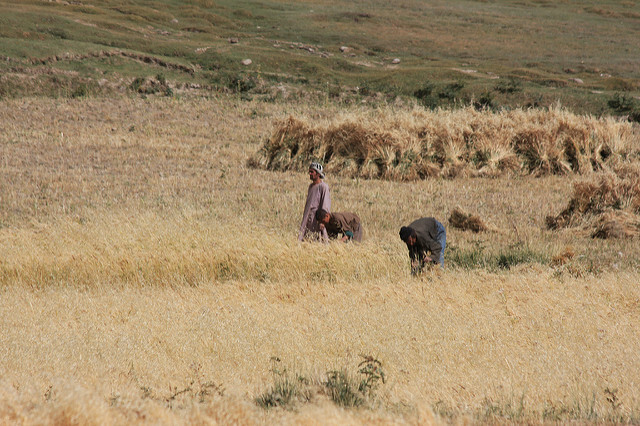 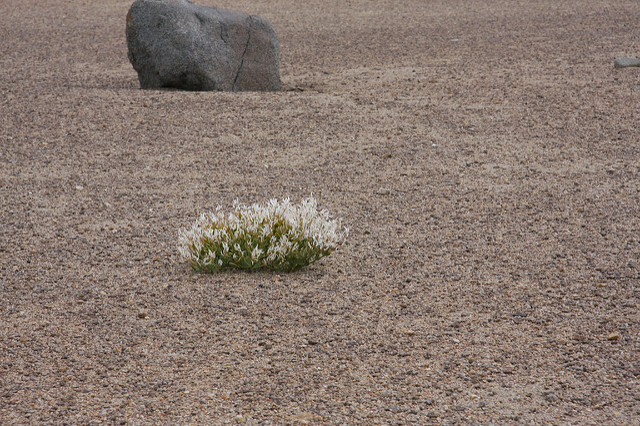 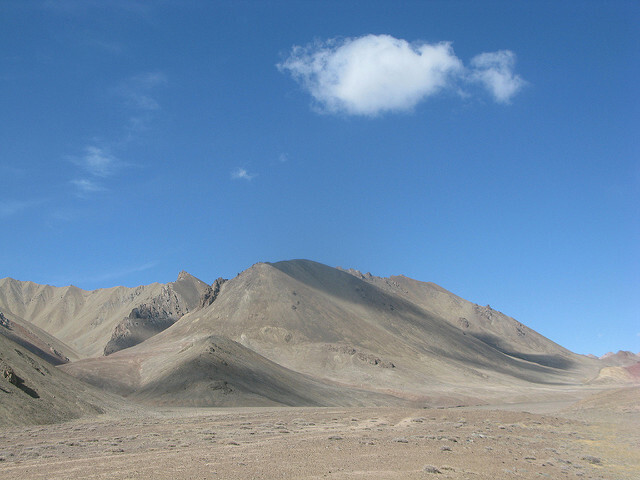 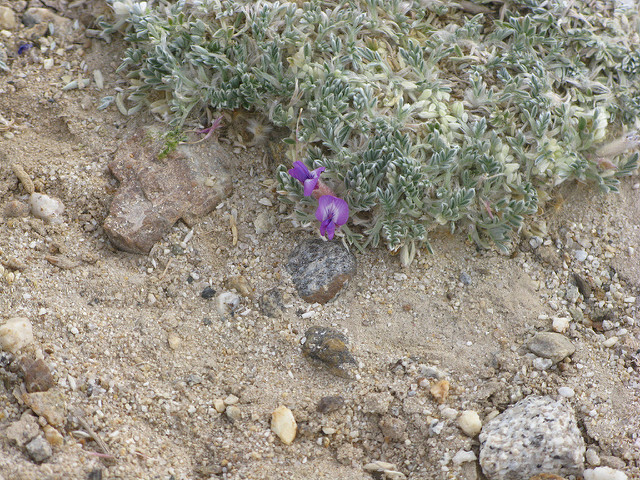 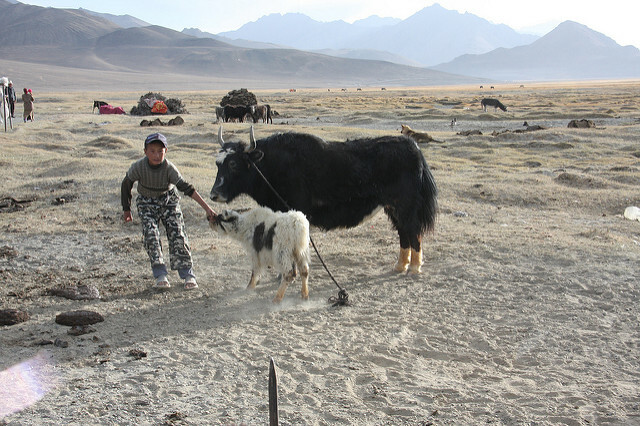 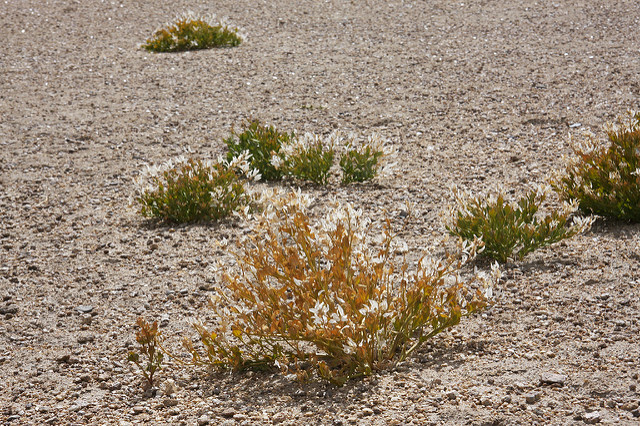 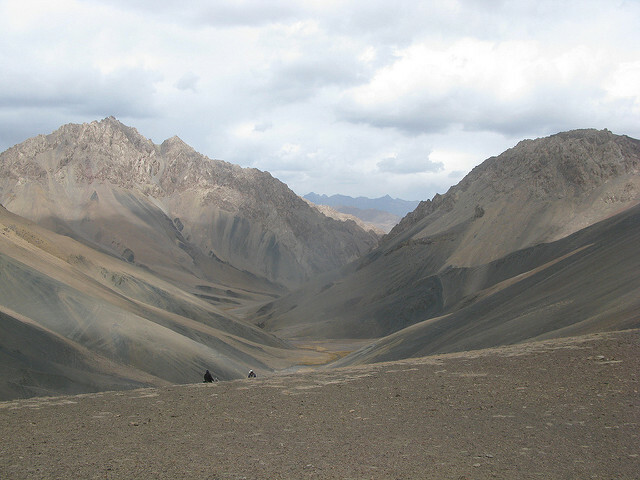 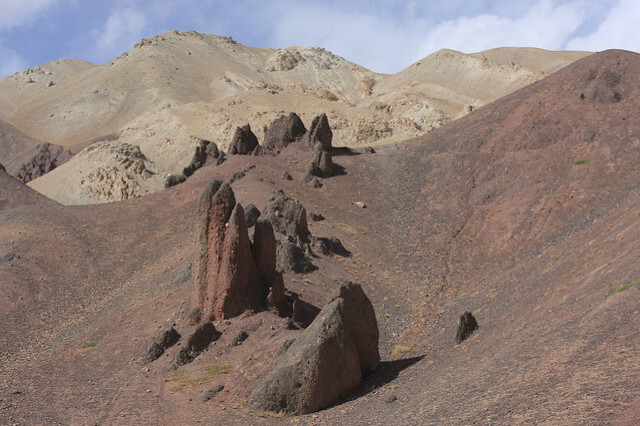 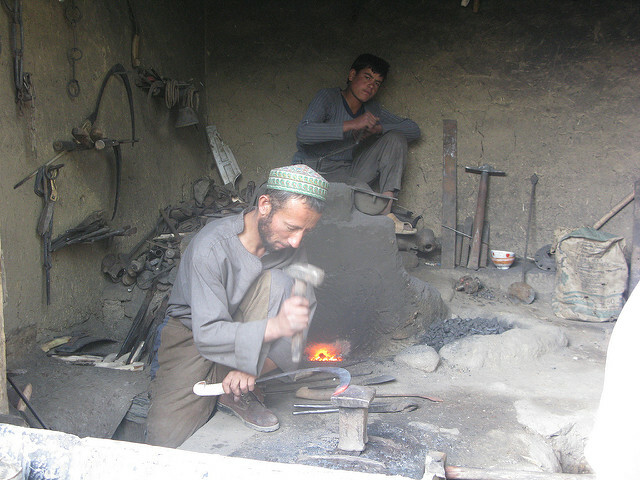 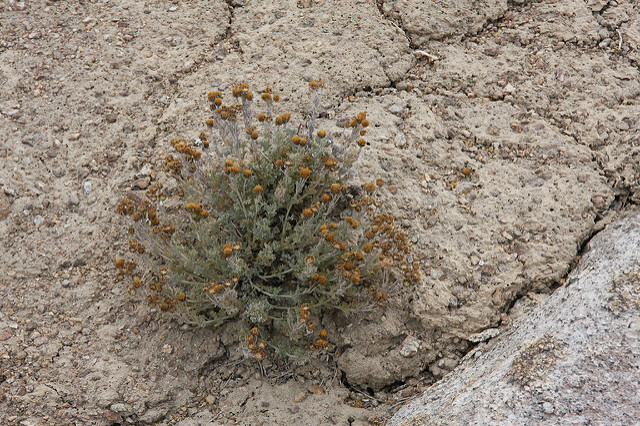 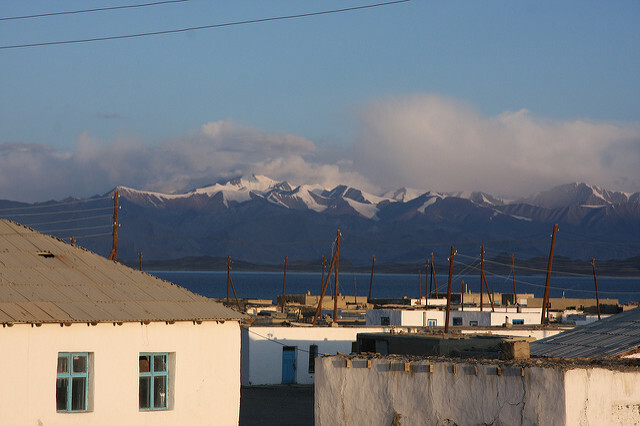 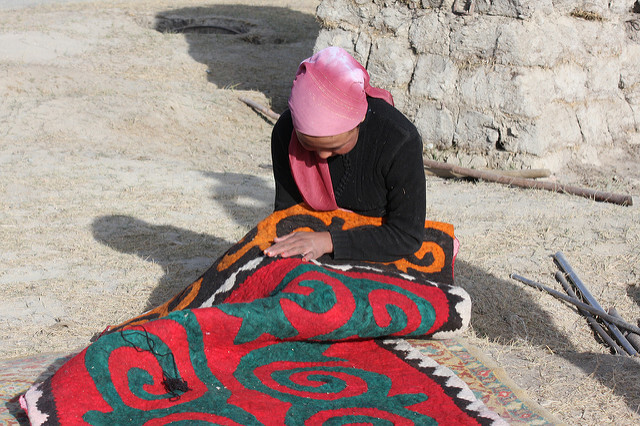 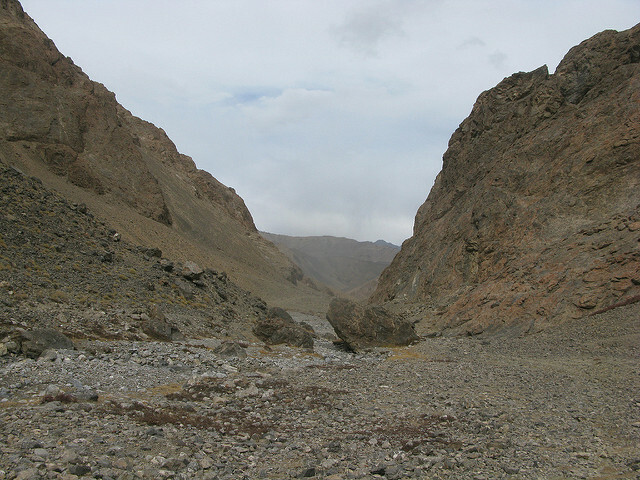 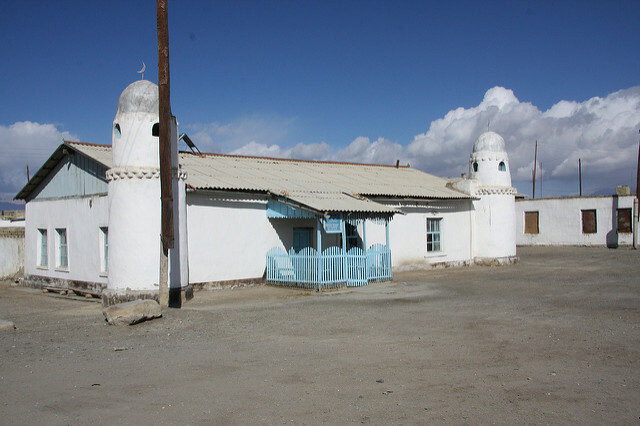 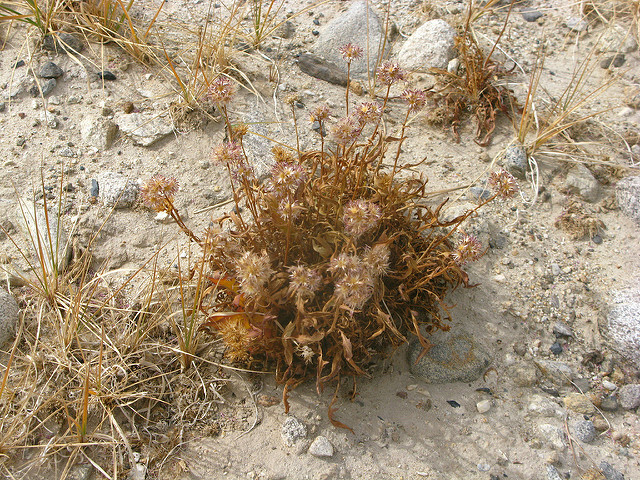 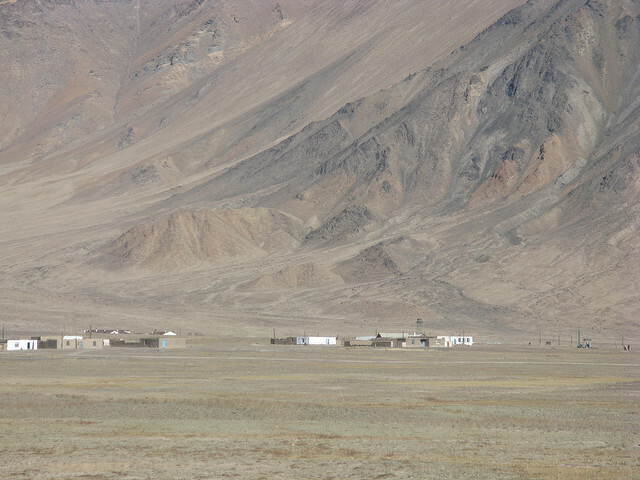 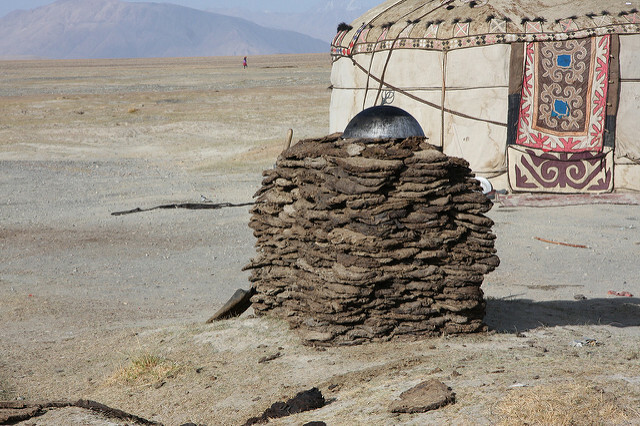 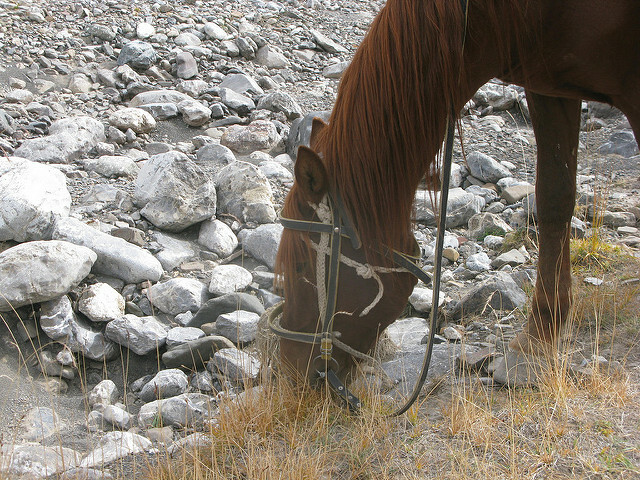 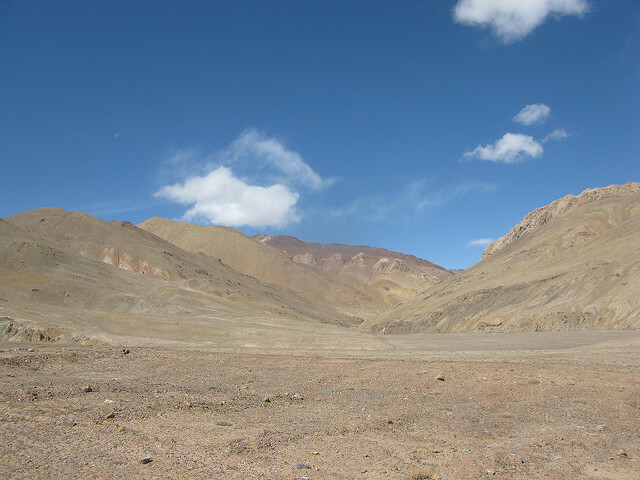 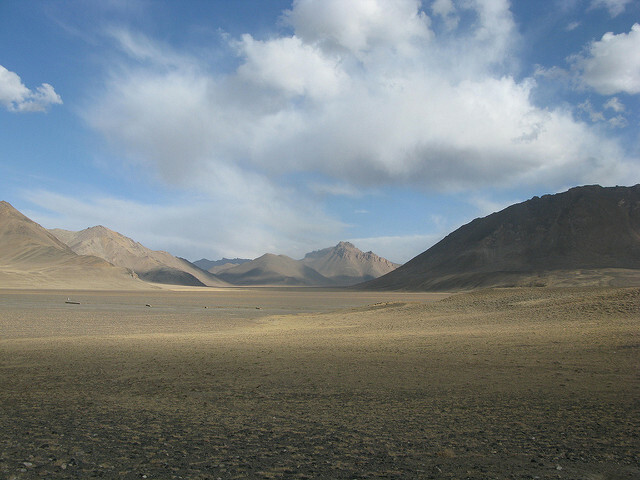 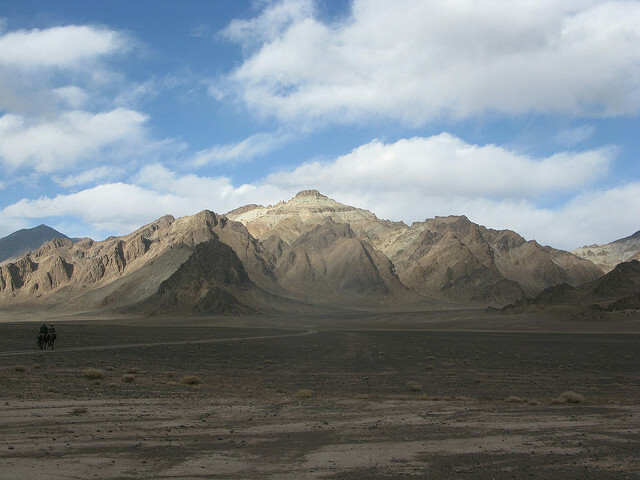 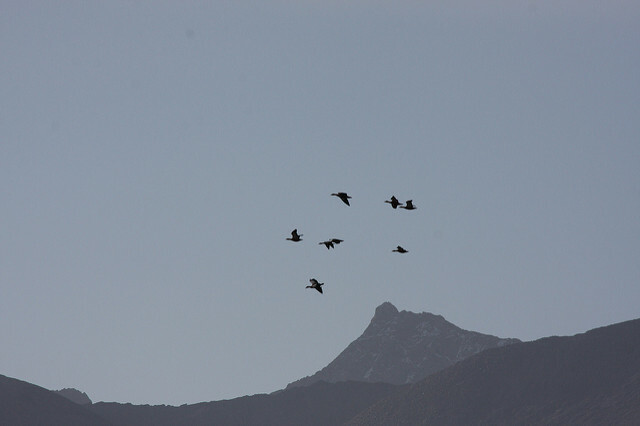 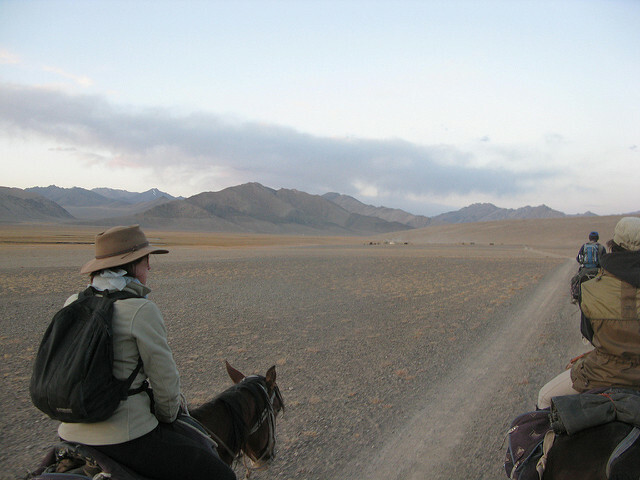 For the original Flikr page please link to Pamir Mountains 2008. 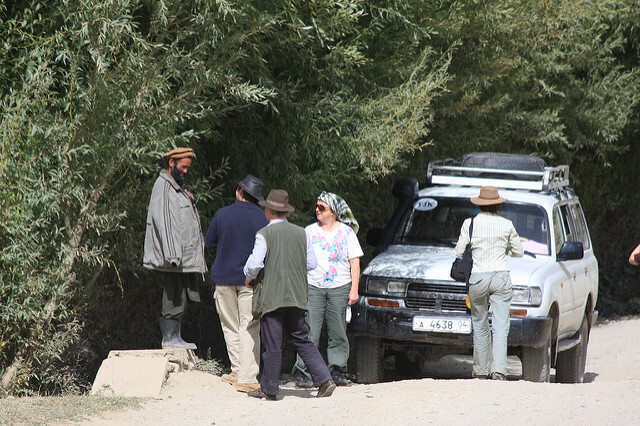 After a delayed start due to the late arrival of Ann's flight we were taken into the town where we visited several of the main sights and then spent several hours in a park as Ann's flight was now expected at midday. 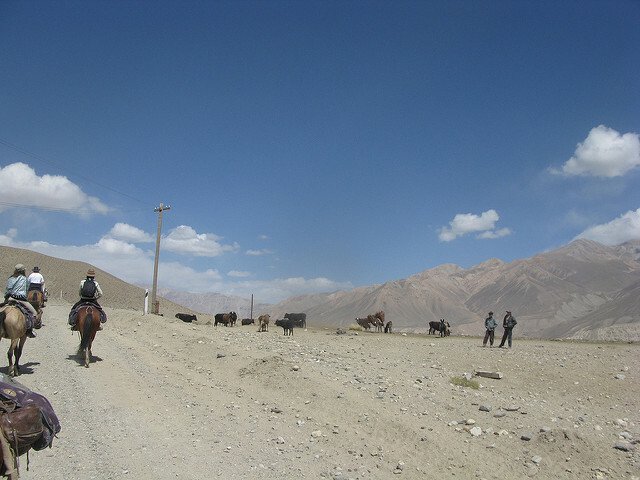 As Anne's bag did not arrive we did not start our road journey towards Khorog until 1330. 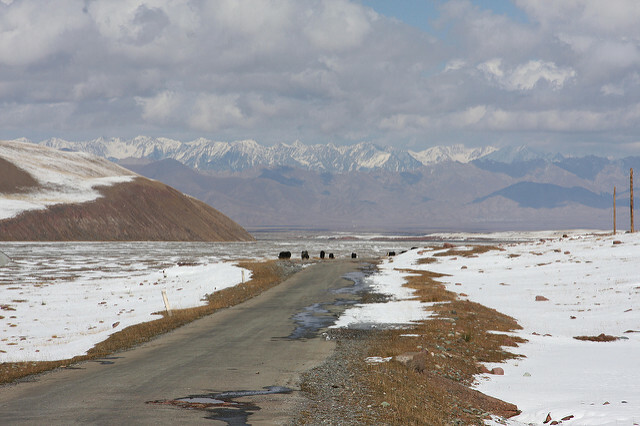 The road was mainly rough but the views were amazing. 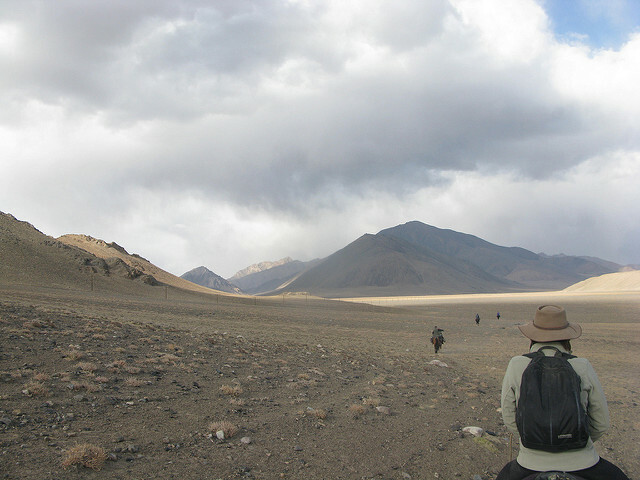 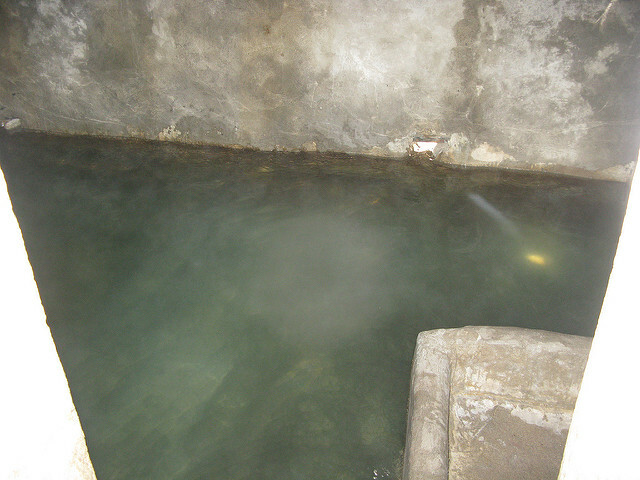 Leaving at 1330 meant that we have to stop at Kalaikhum for the night. 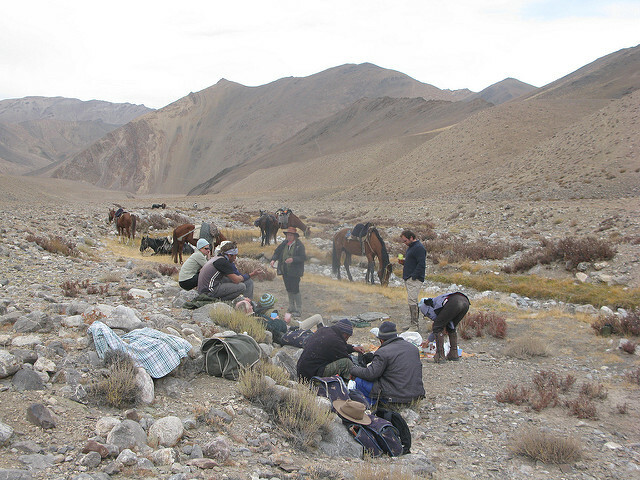 Stops for lunch and dinner meant that we arrived at 2345. 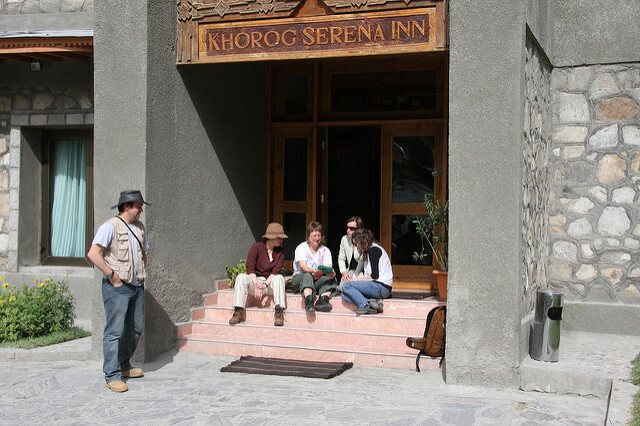 The next morning we left at 0800 for Khorog. 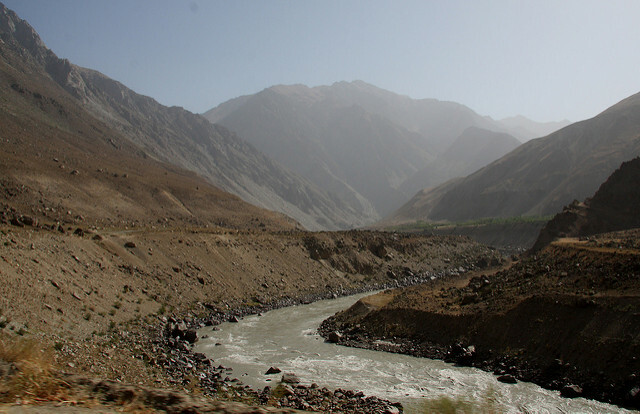 The views were again very dramatic as we drove alongside the Pyanj River looking across at Afghanistan. 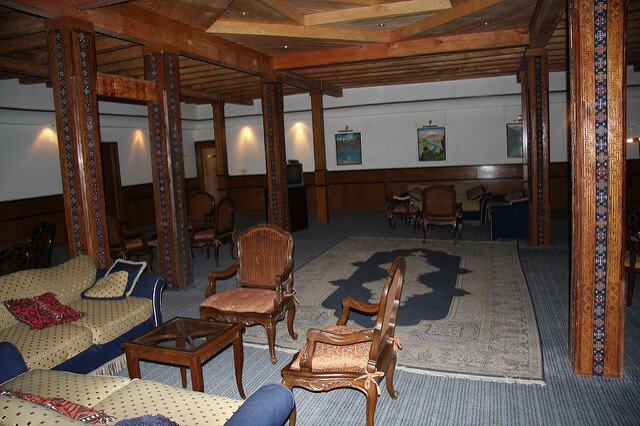 After several stops for Walnuts and Peaches we arrived at the Serena Hotel. 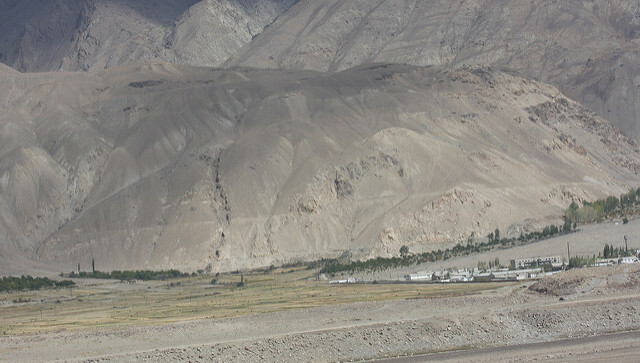 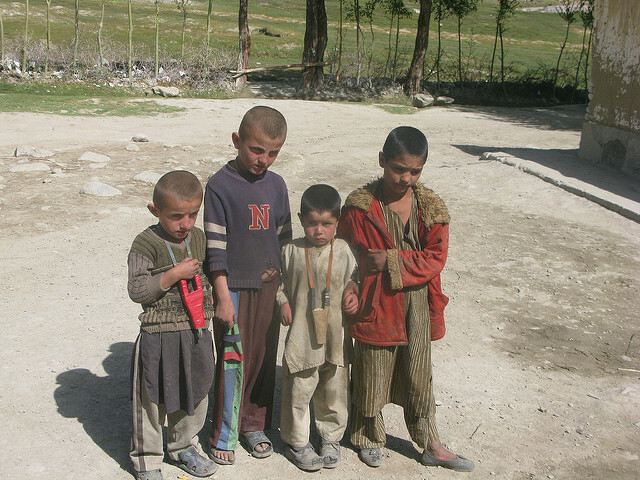 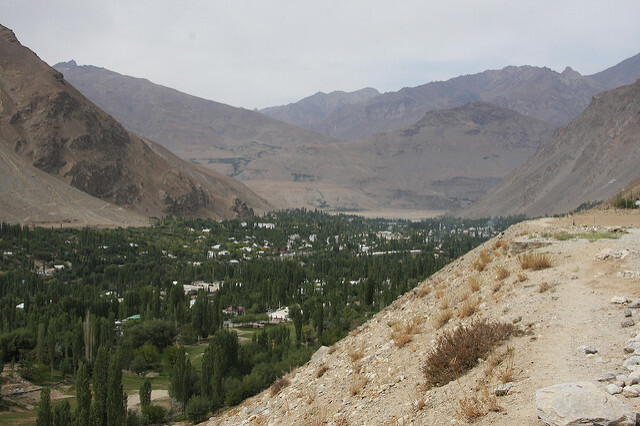 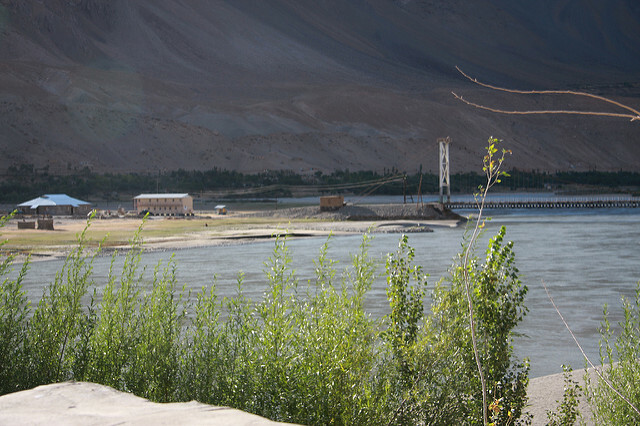 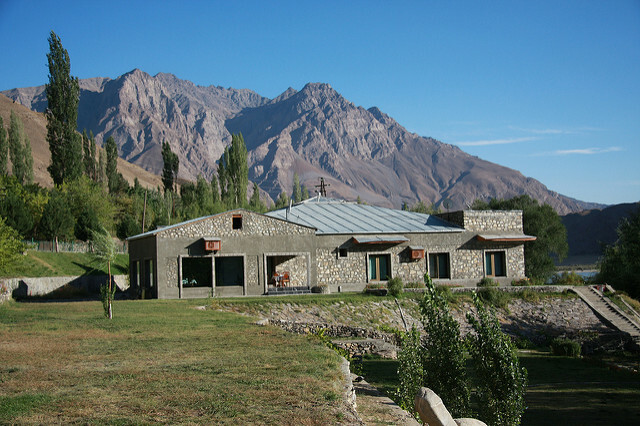 The five bedded hotel was of a very high standard overlooking the river and Afghanistan. 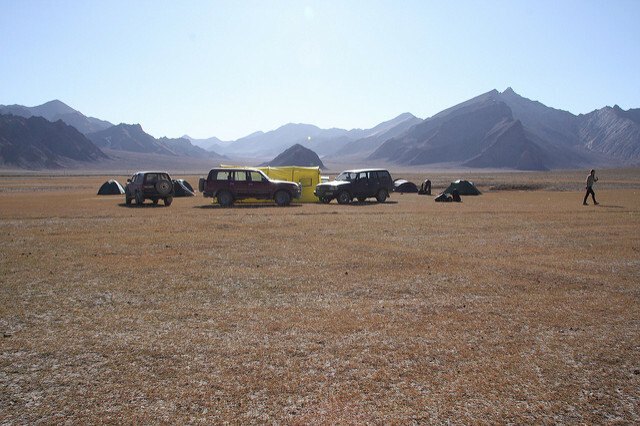 The next morning we drove into Khorog to the market and up to see the site for the new Central Asia University and to the museum where everyone wanted to see the Cross-bow Mouse Trap. 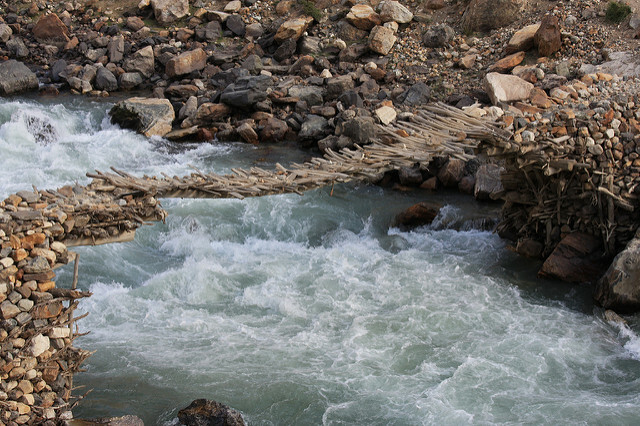 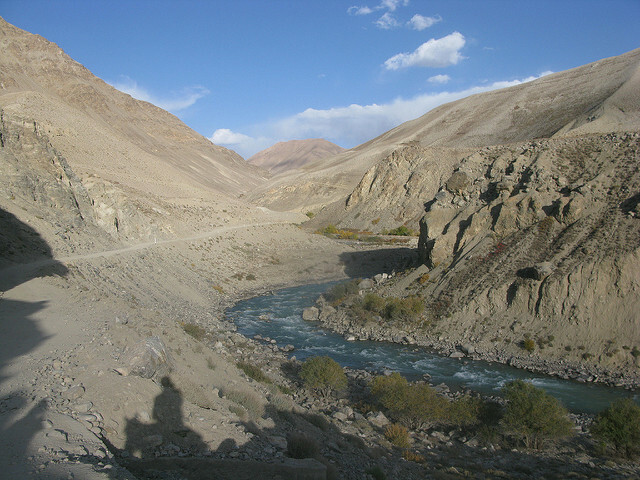 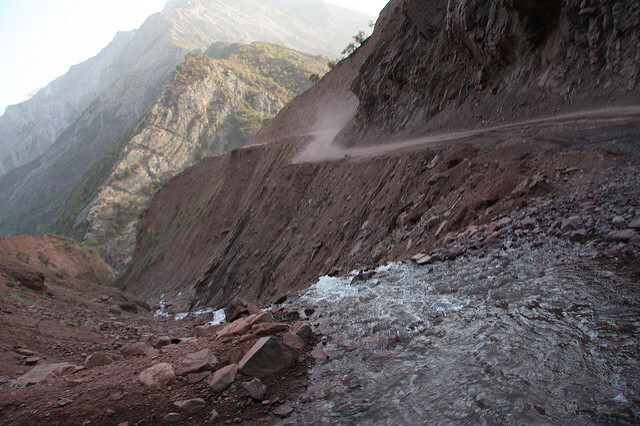 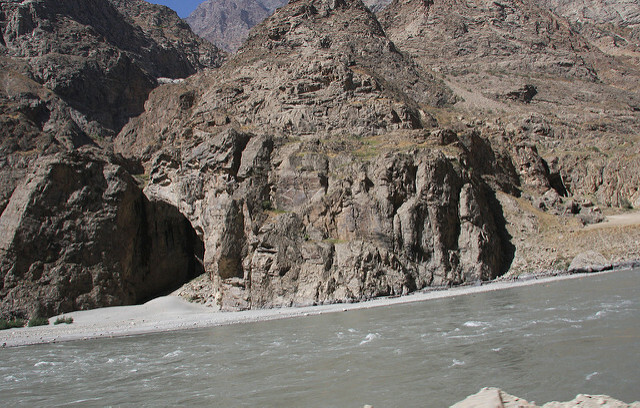 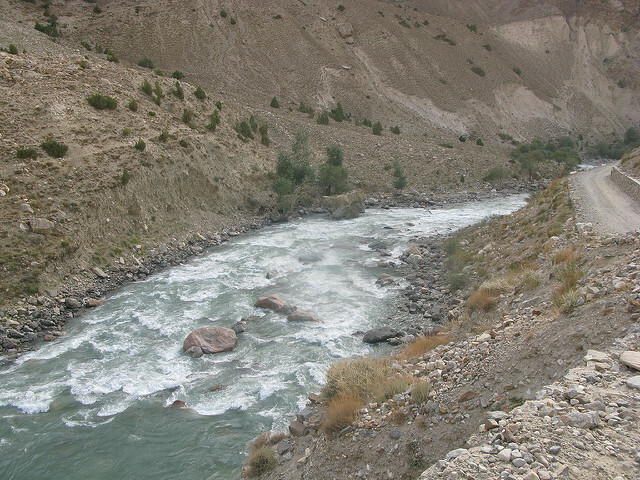 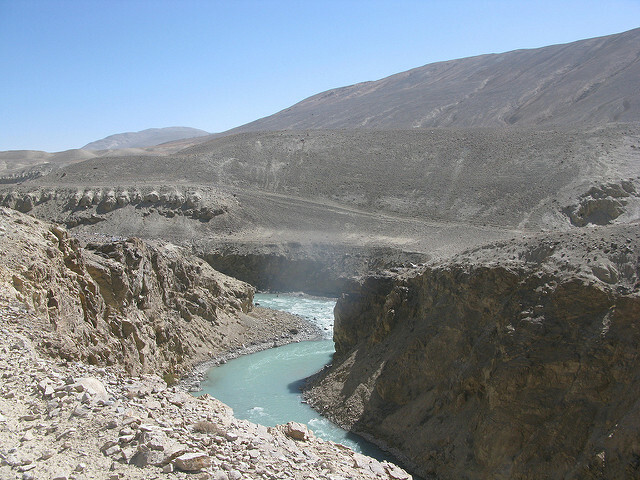 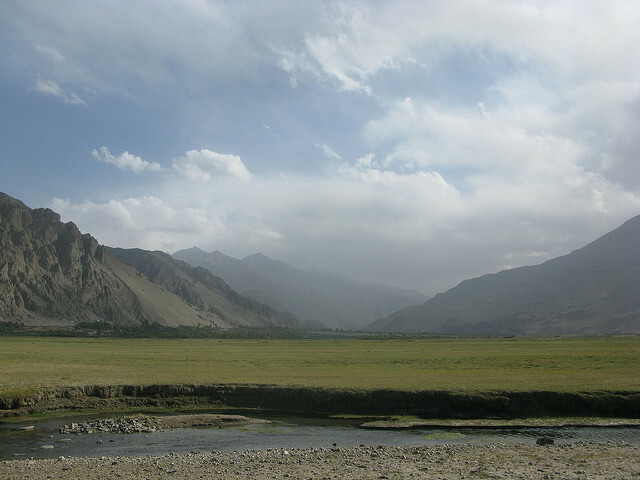 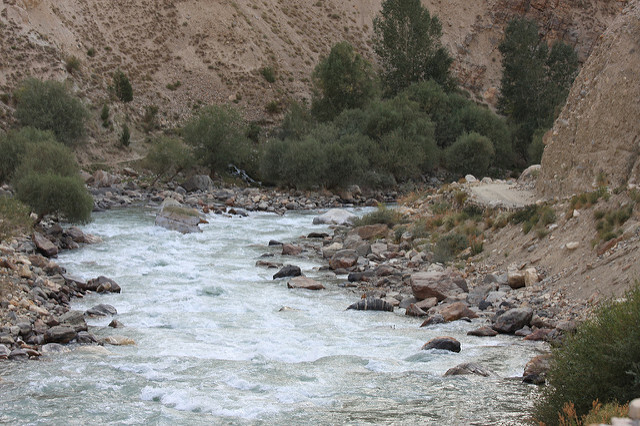 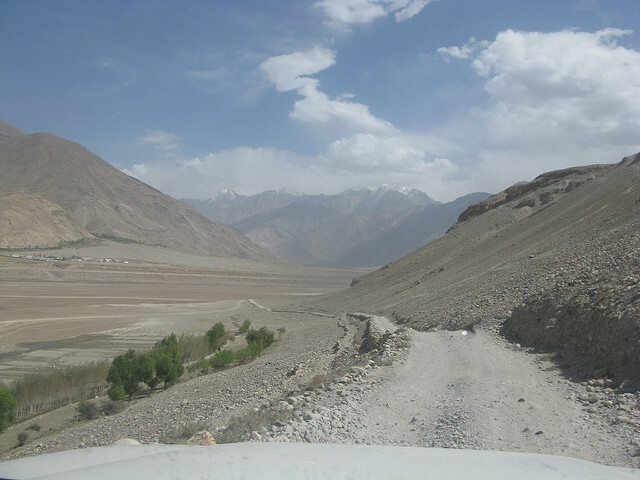 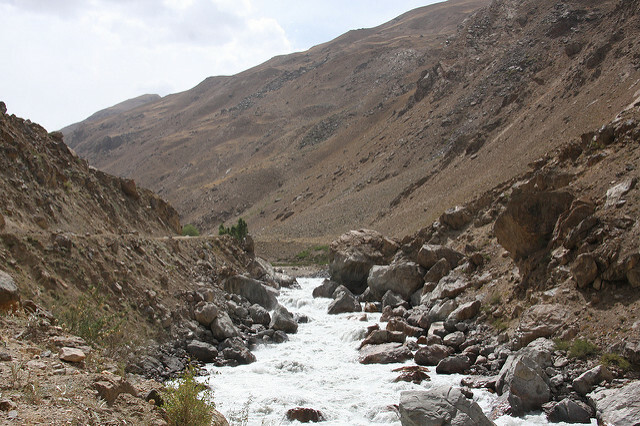 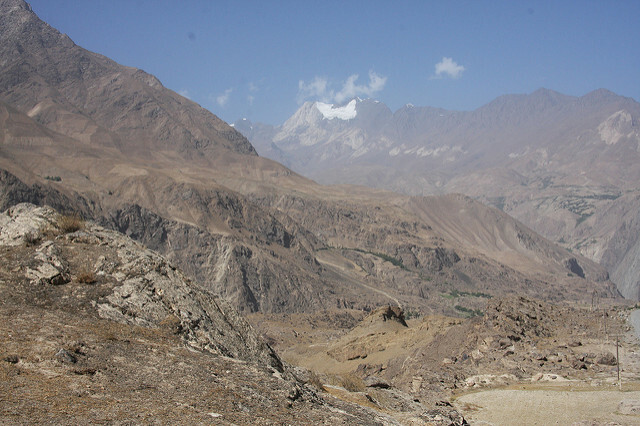 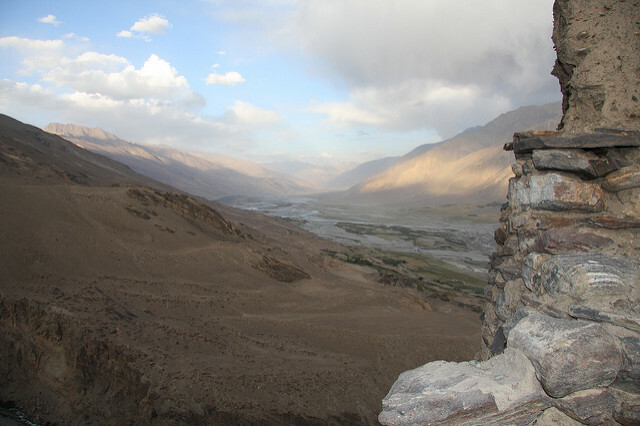 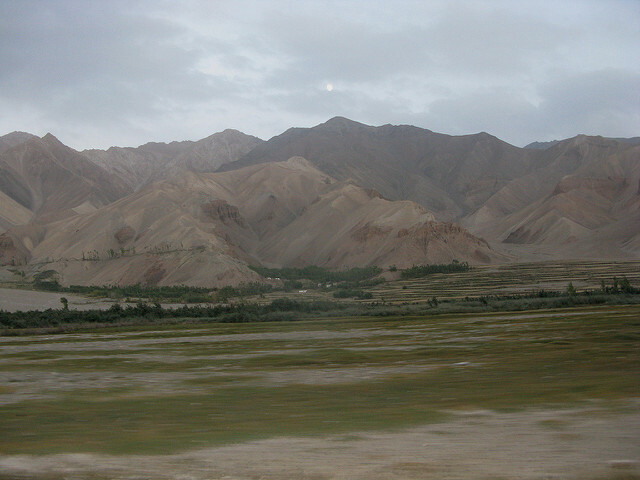 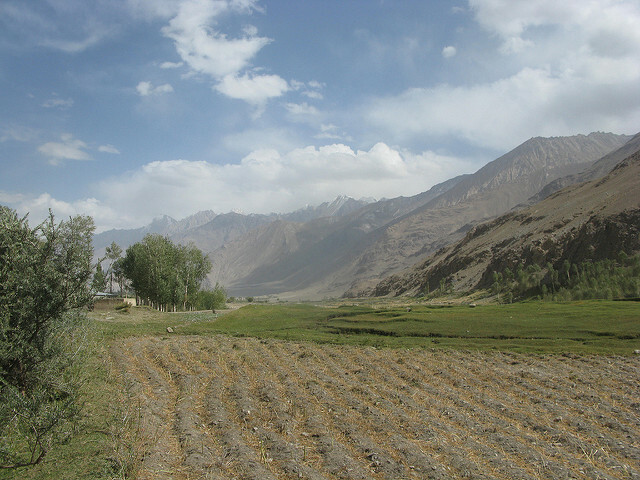 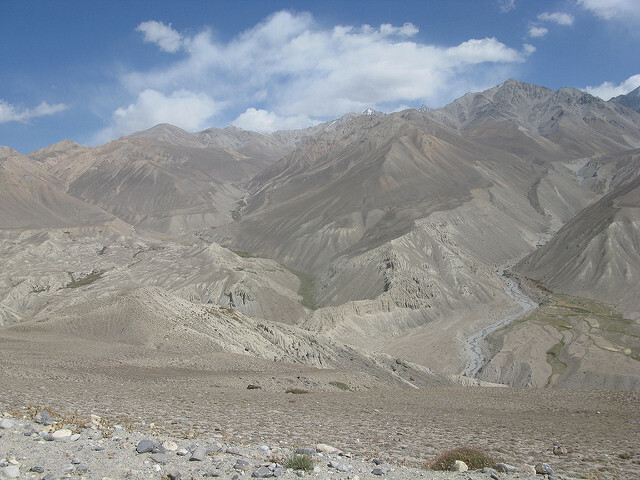 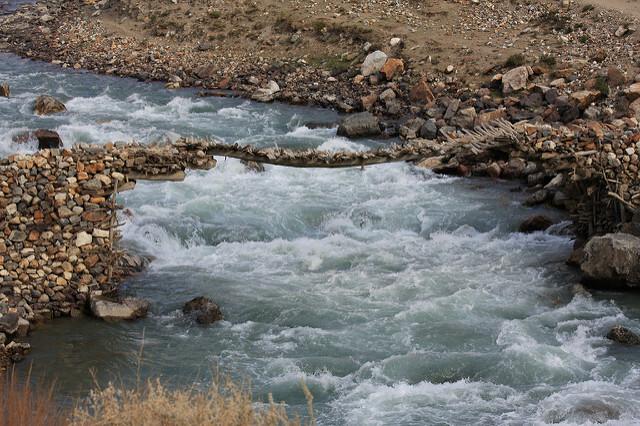 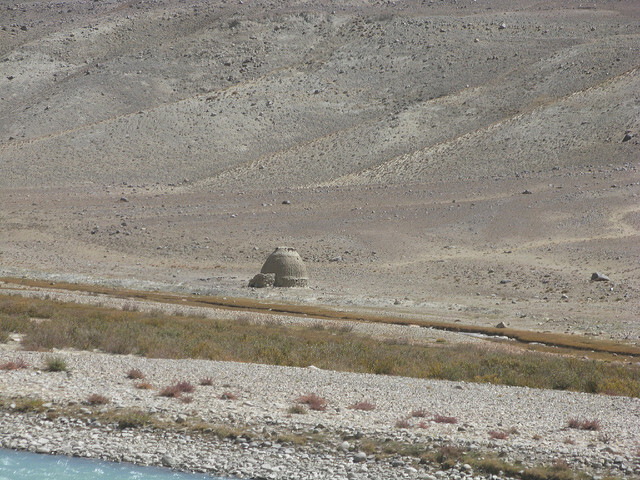 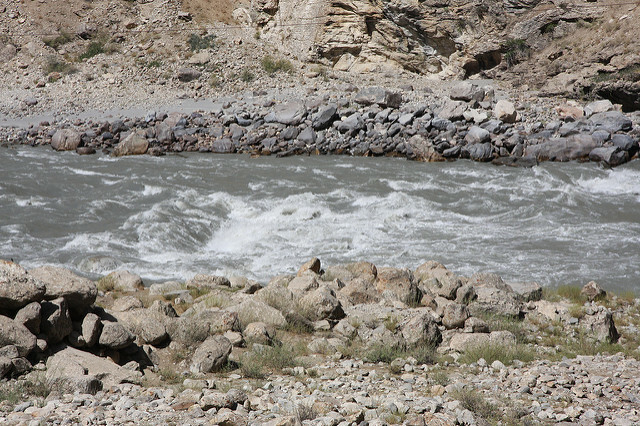 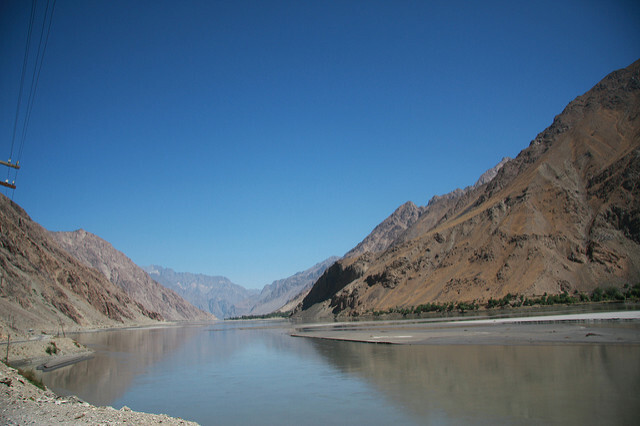 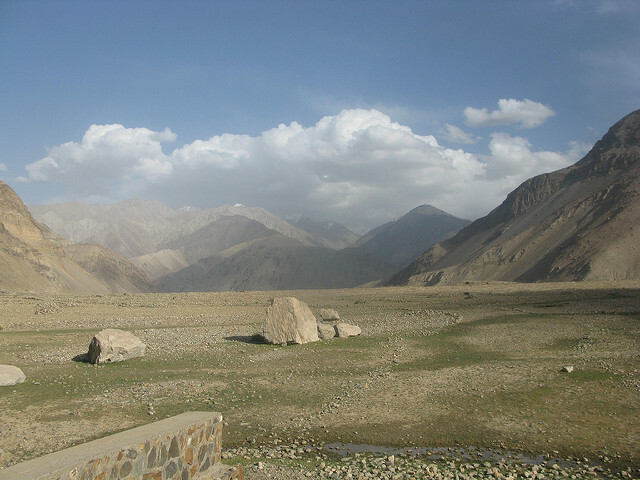 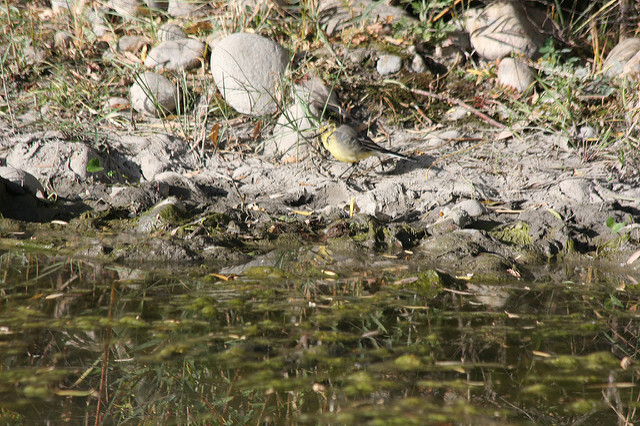 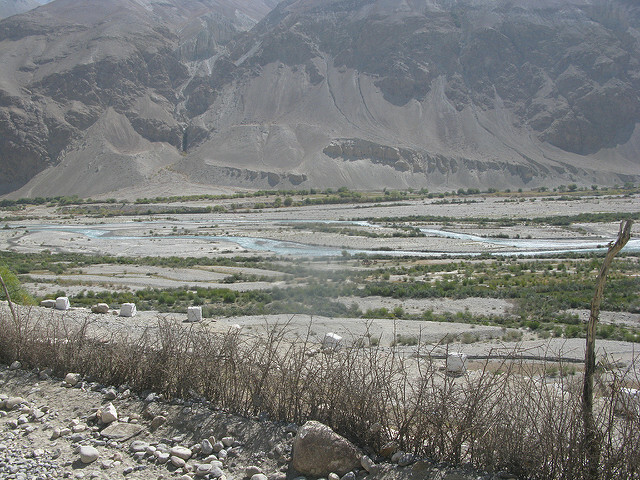 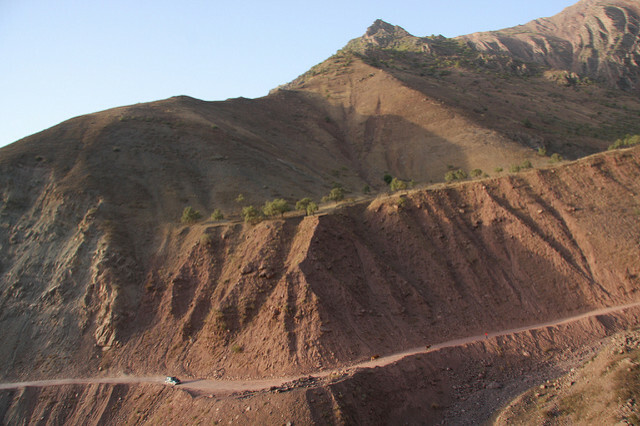 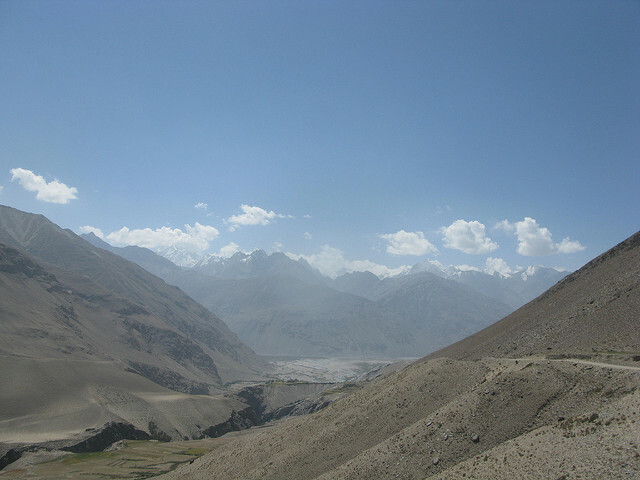 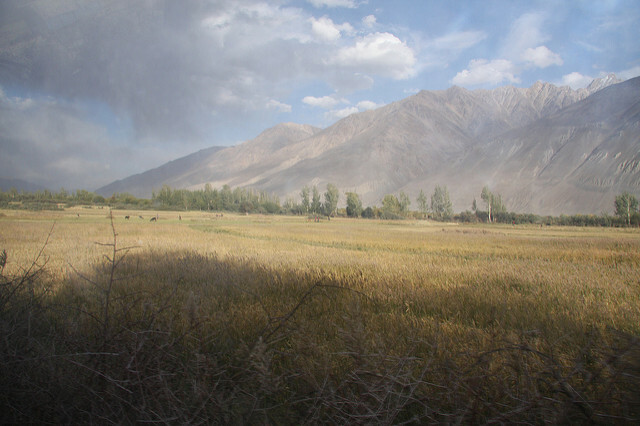 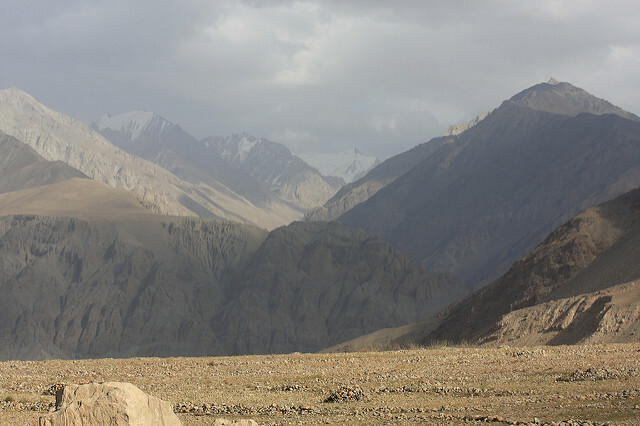 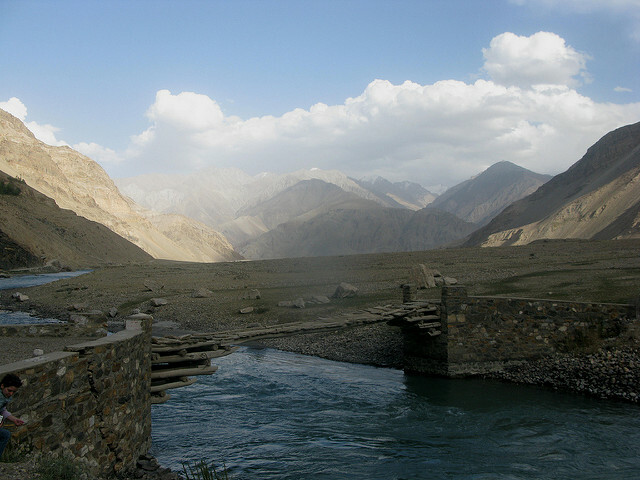 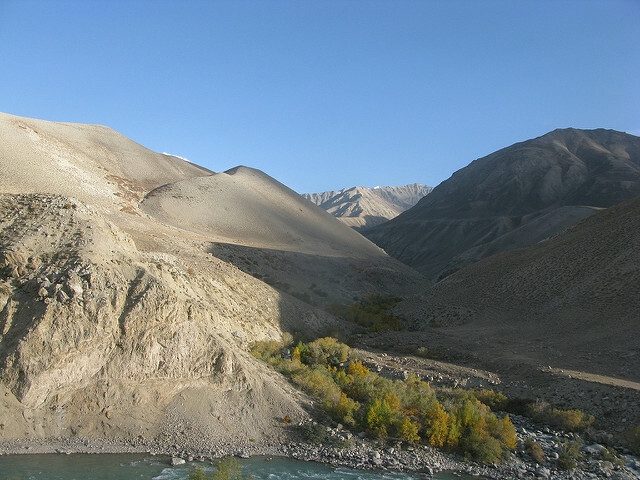 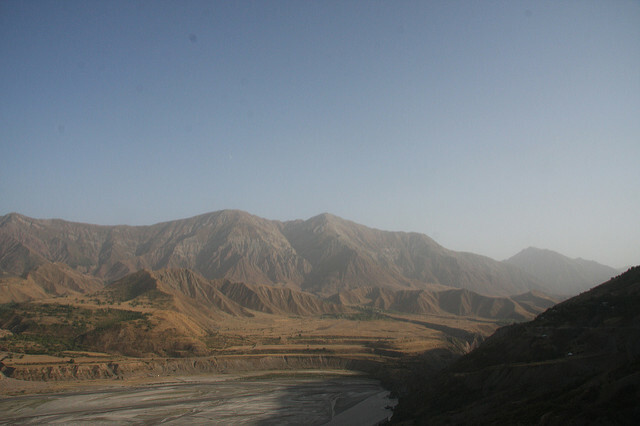 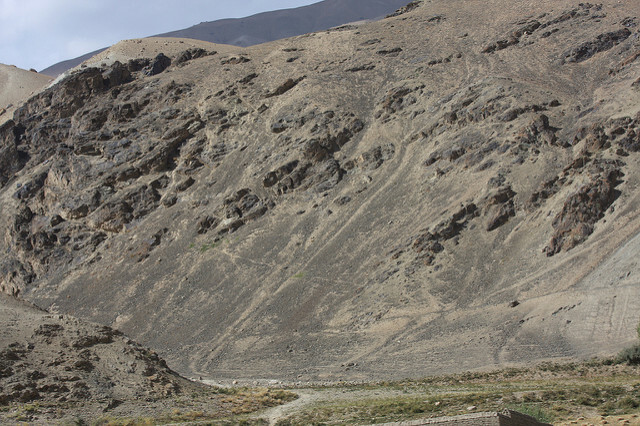 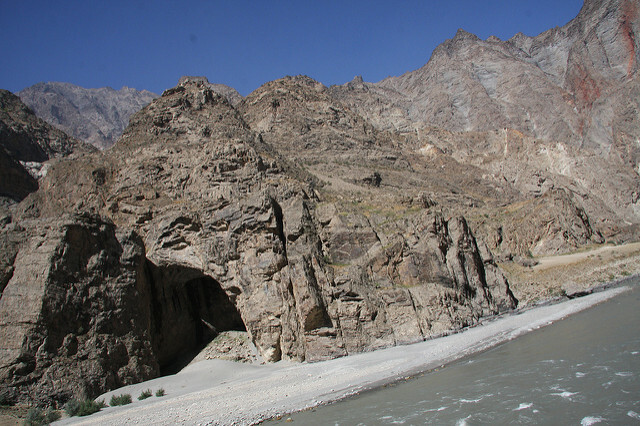 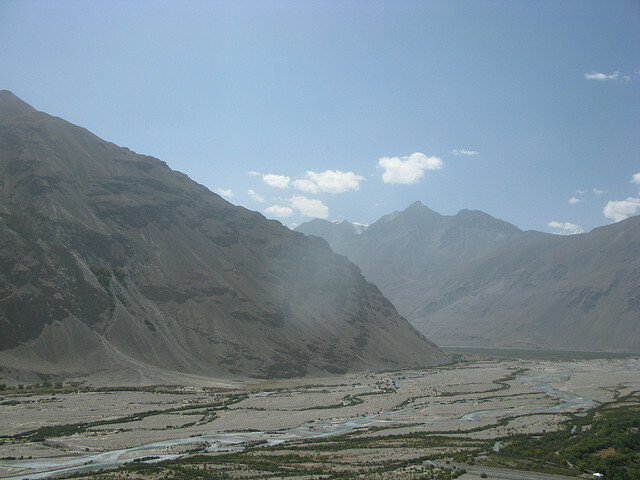 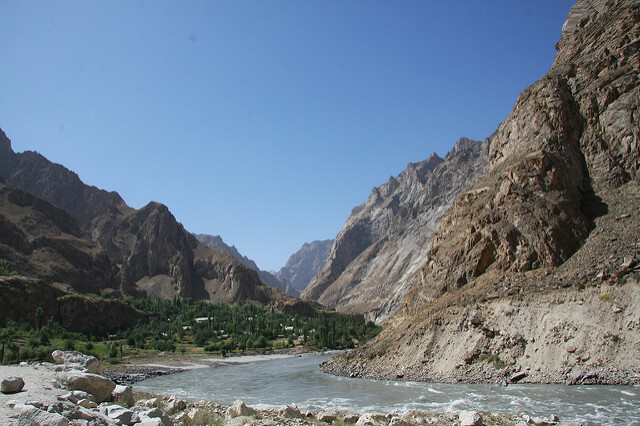 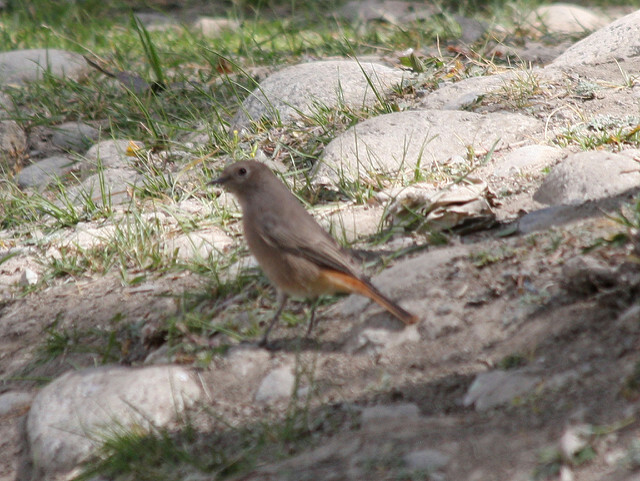 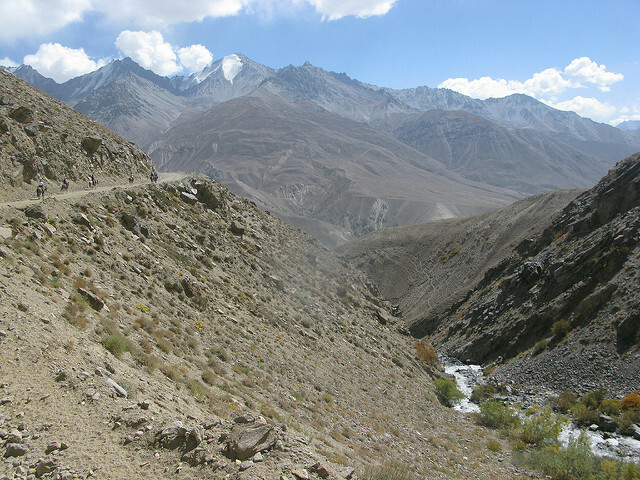 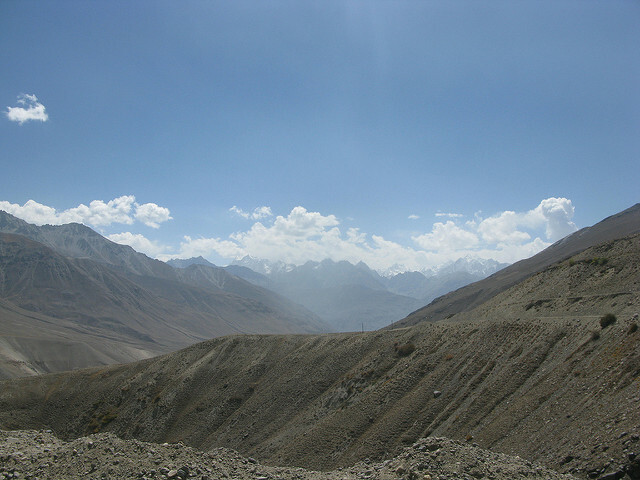 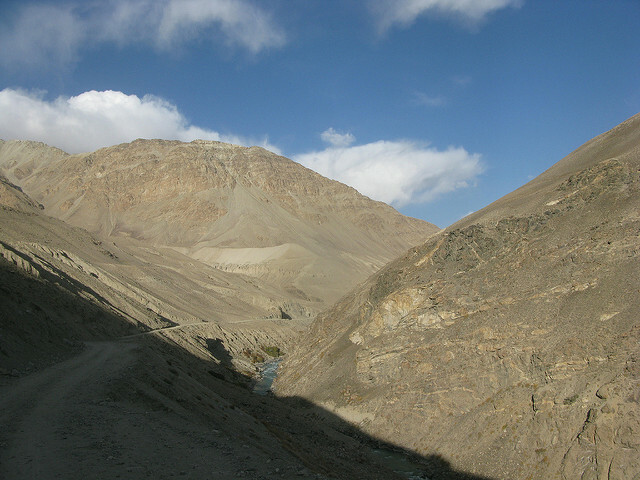 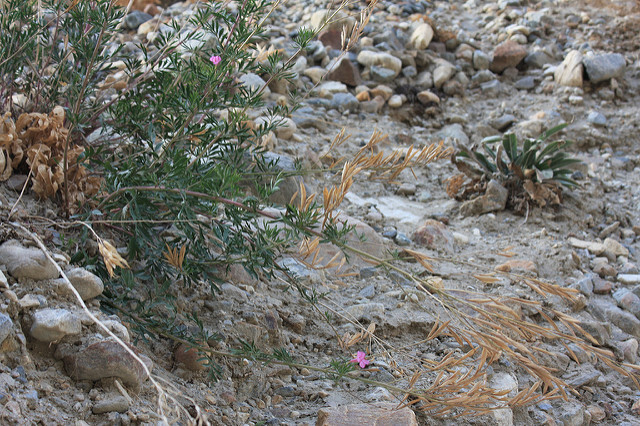 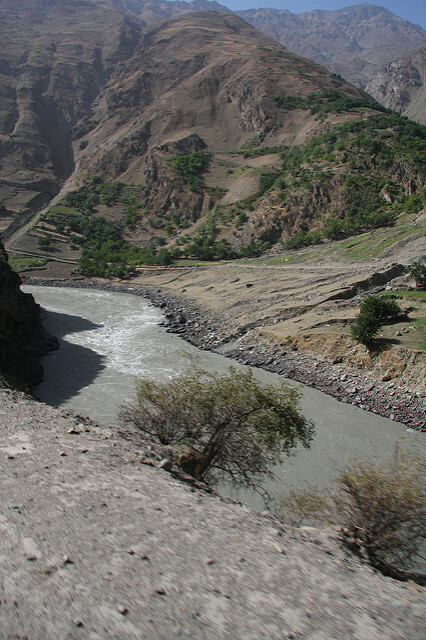 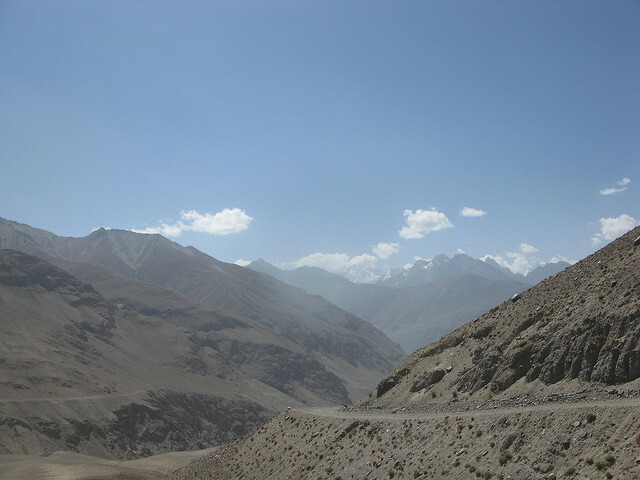 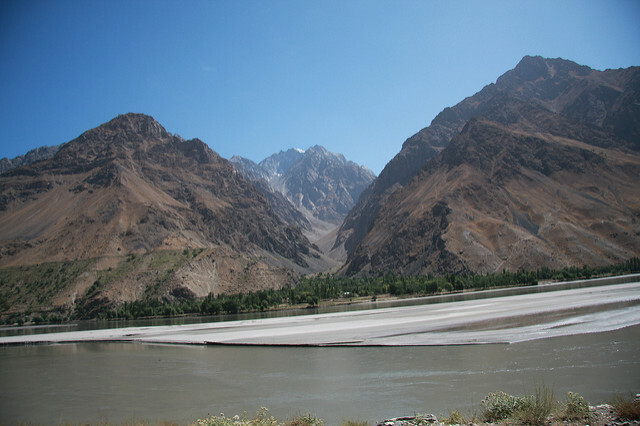 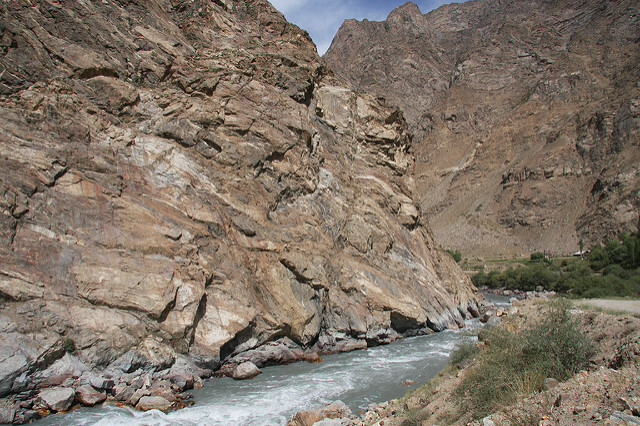 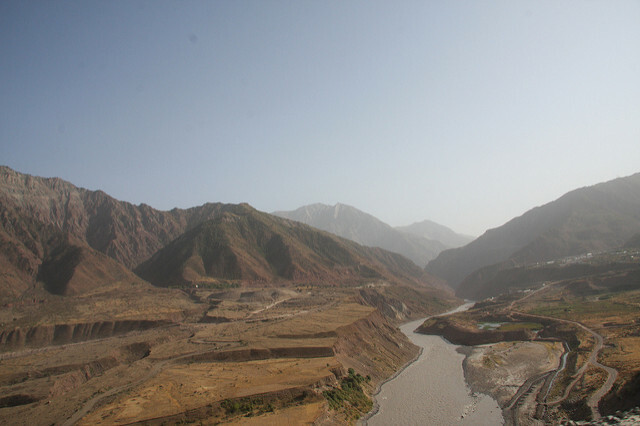 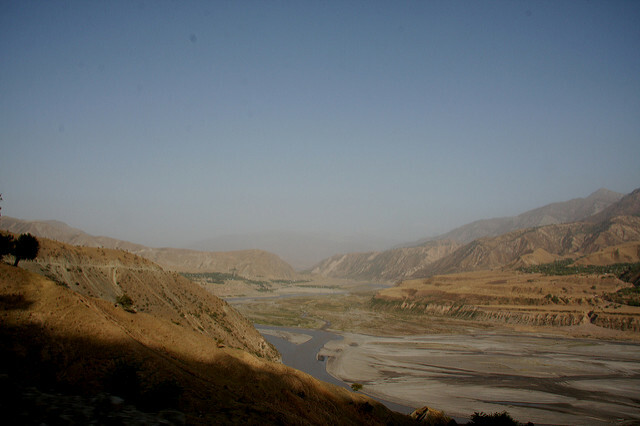 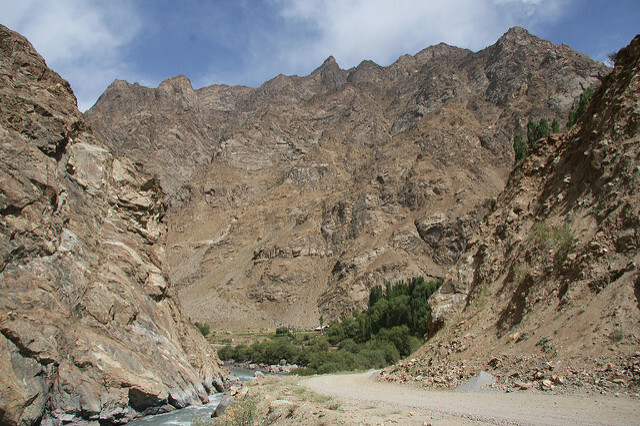 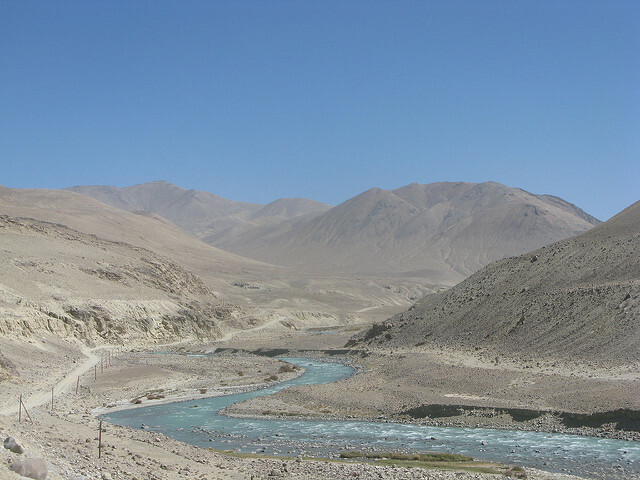 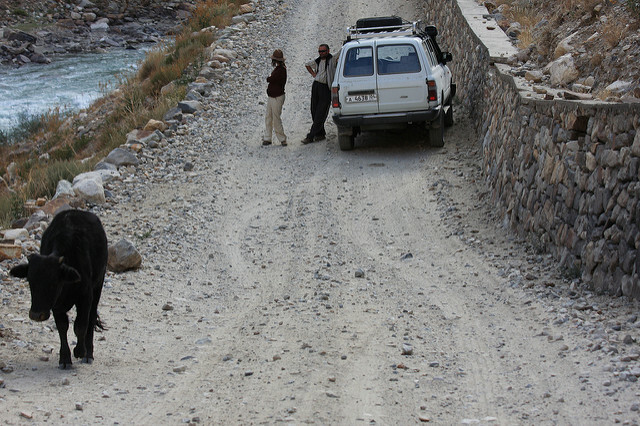 In the afternoon we continued our drive beside the Pyanj River to Ishkashim where we crossed over into Afghanistan. 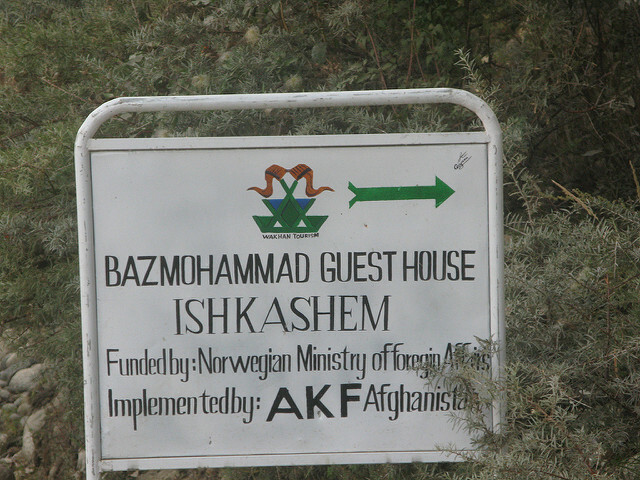 Our lodging for the following two nights was in a nice homestay in Eskashem. 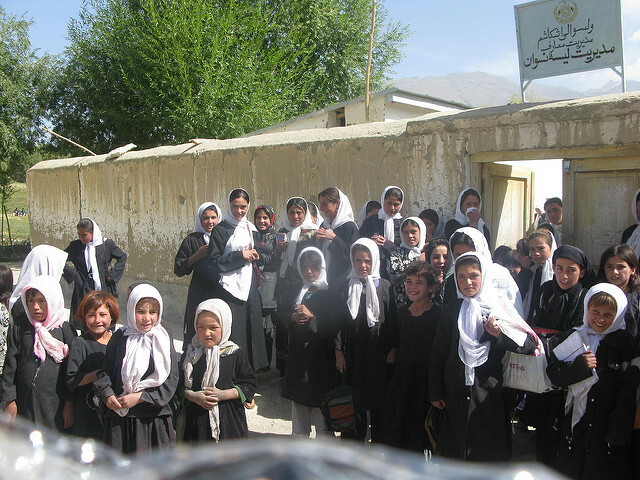 After visiting the town in the morning where we made several purchases in the market and then made a visit to the school. 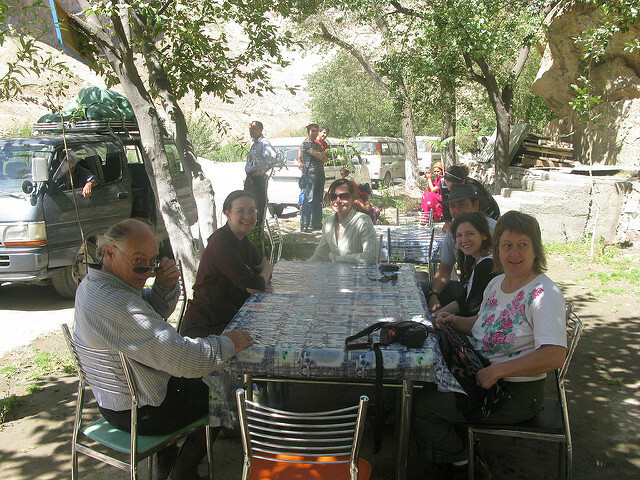 After lunch we drove up the Varduj valley to see the beautiful countryside and people. 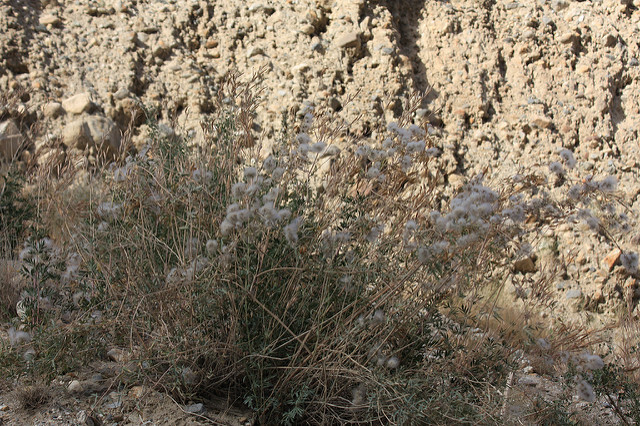 We ventured into the poppy growing area of Qazaleh. 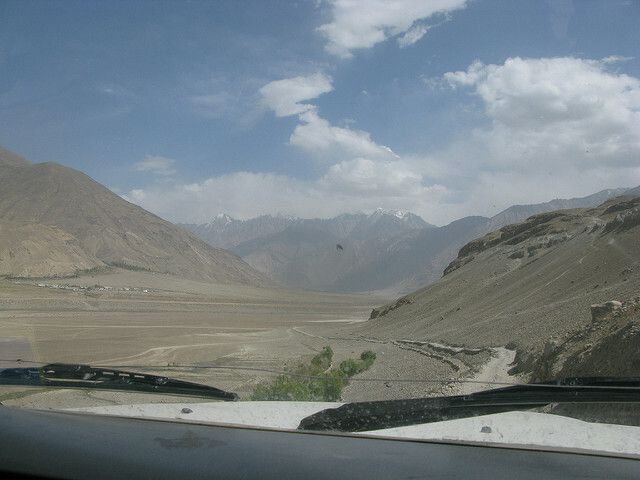 Here we were advised not stop and to avoid taking photos. 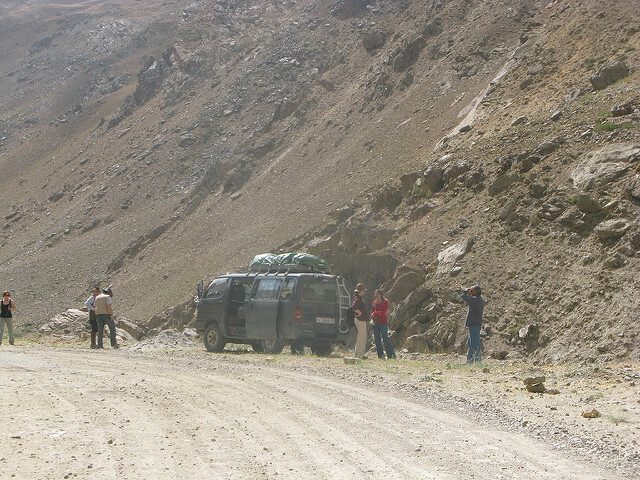 However as we were about to turn around we had a puncture and whilst changing the wheel were entertained by half the village! 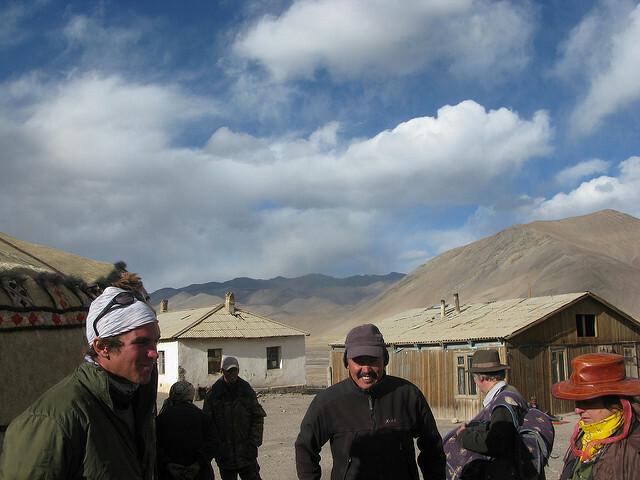 The next morning we visited the town again while our vehicle was being repaired. 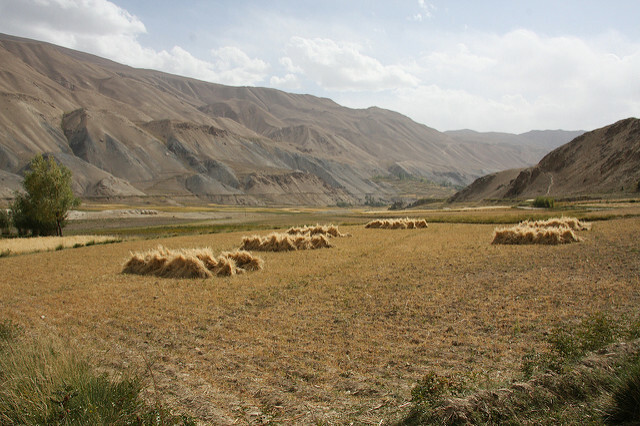 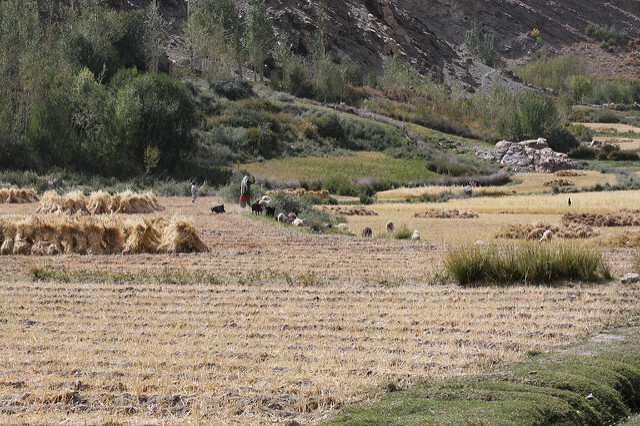 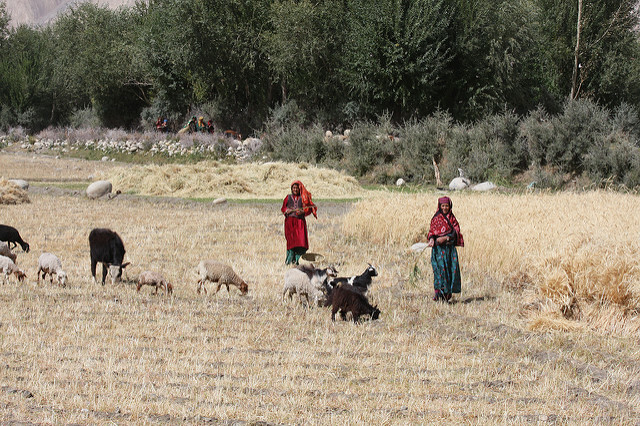 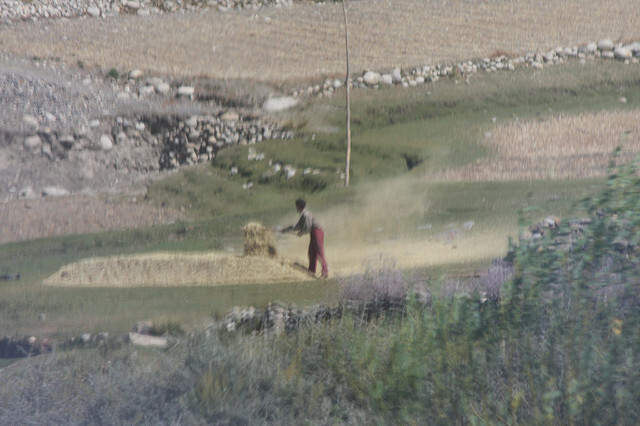 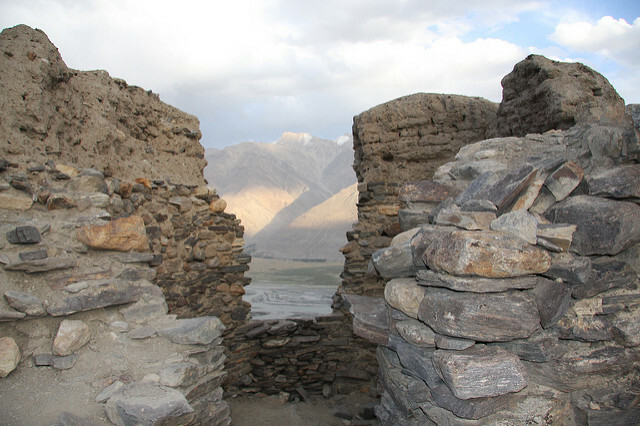 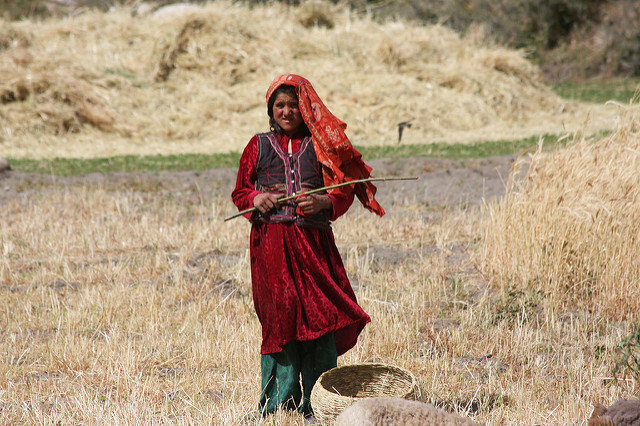 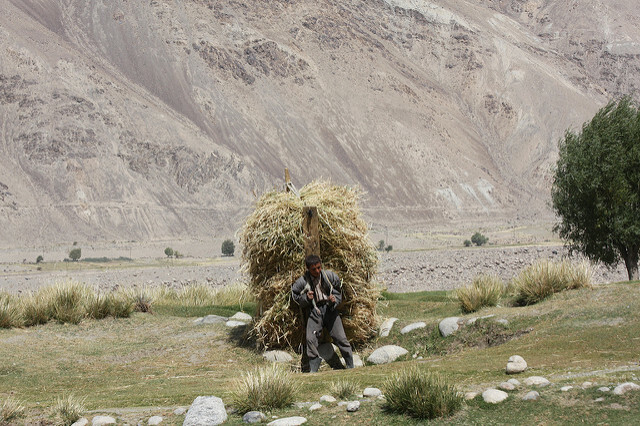 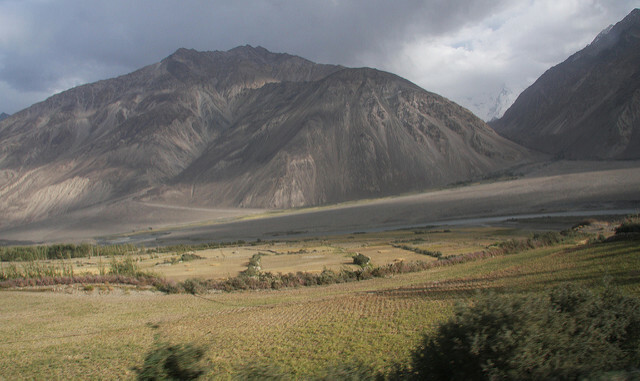 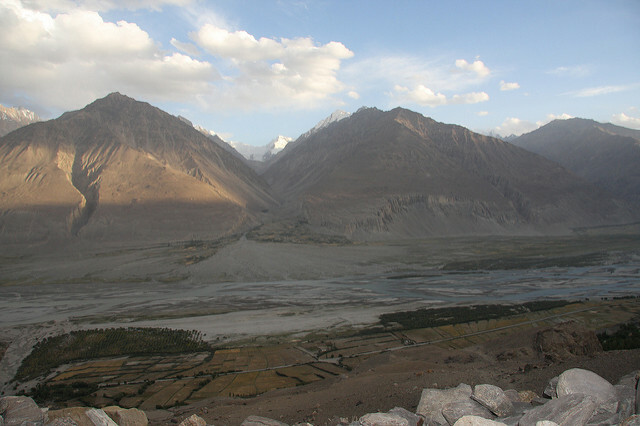 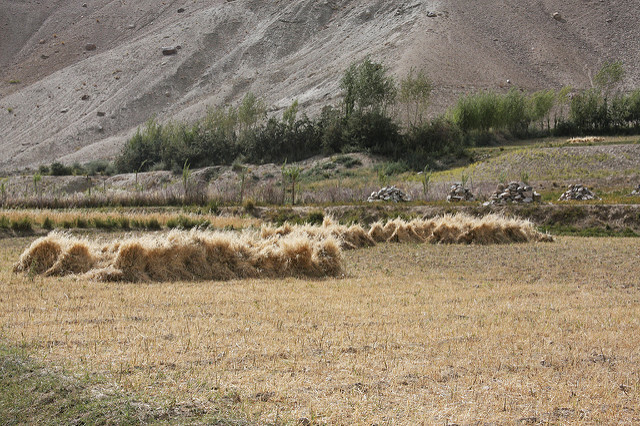 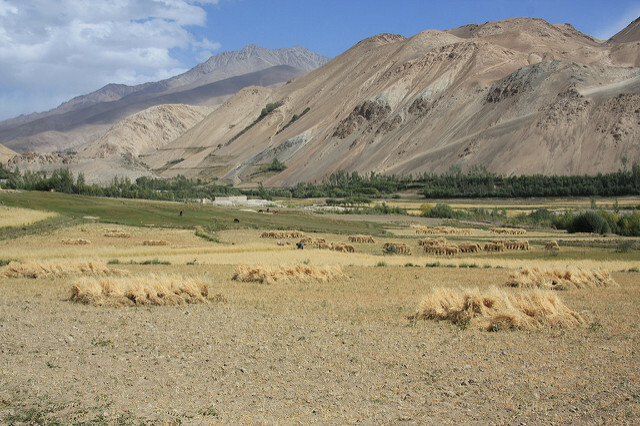 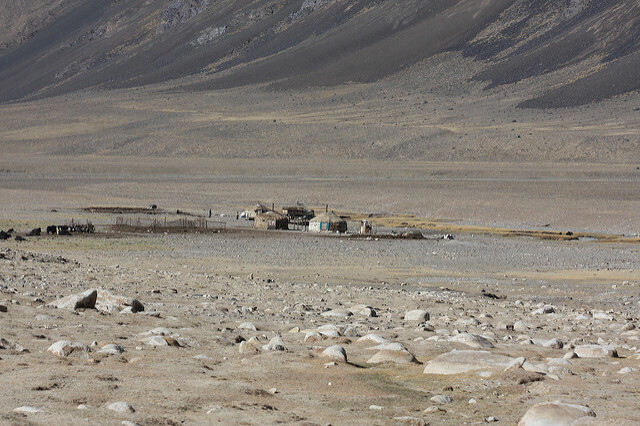 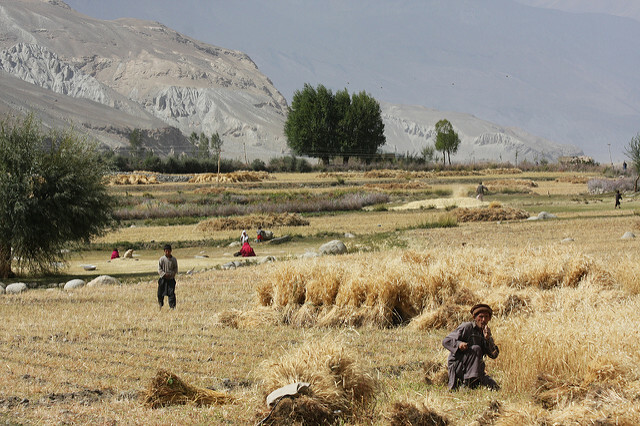 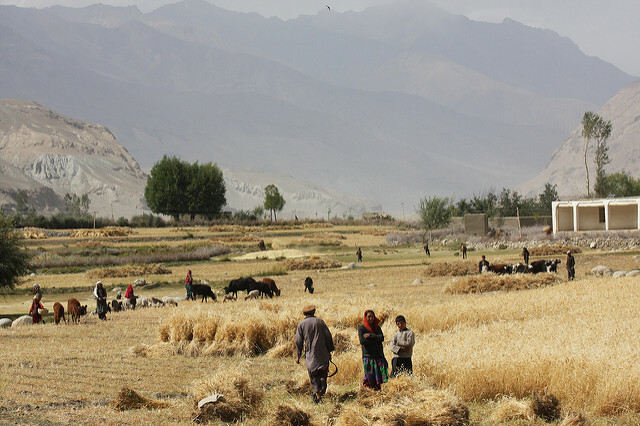 In the afternoon we drove up the Wakhan valley to see the Wakhi people bringing in the harvest before crossing the border. 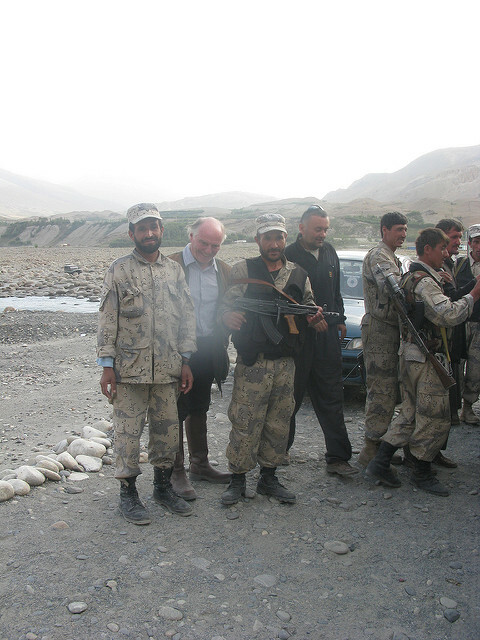 We arrived at the Afghan border to learn that they had decided to close it! 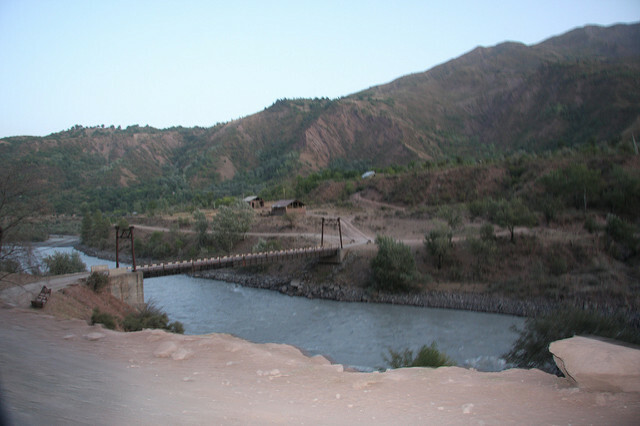 After lengthy discussions we were allowed to cross to the Tajikistan border on condition that our passports after being stamped by the Tajikistan authorities were held in Afghanistan until they could be stamped the next day! 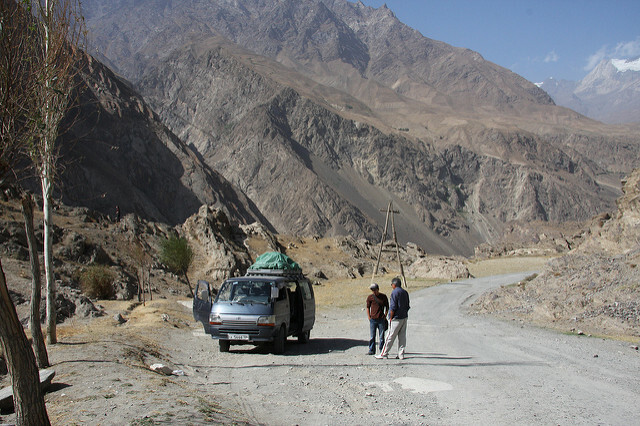 Hence we crossed into Tajikistan the day before we left Afghanistan. 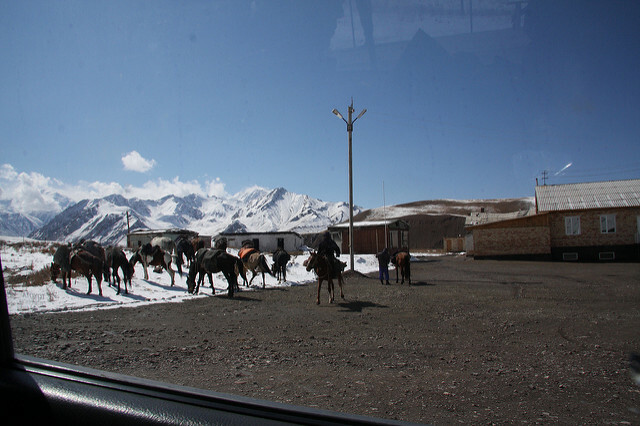 After a night in Ishkashim we visited the school and museum while we waited for our passports to be returned. 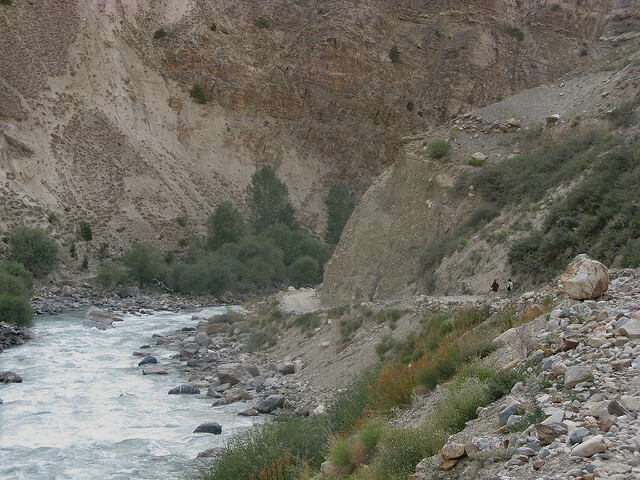 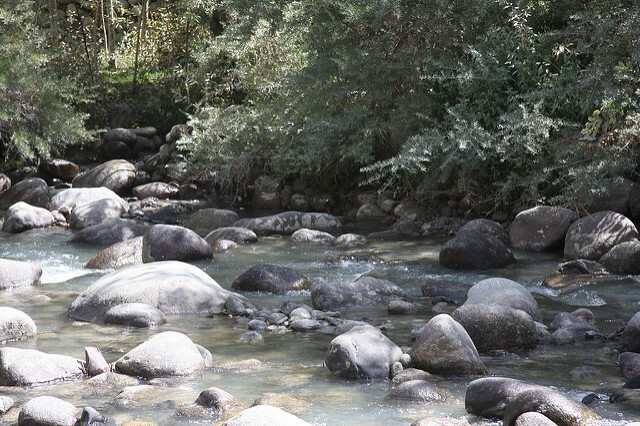 After lunch we finally started our drive alongside the Pyanj River to Langar. 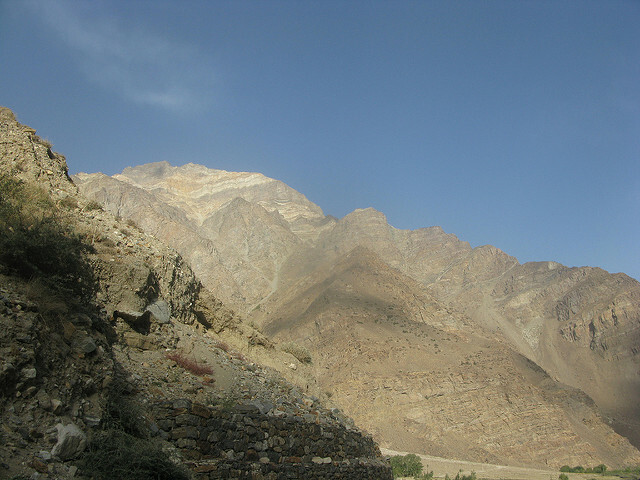 The views were again amazing and we stopped firstly at the ruined 12th century Yamchun Fort, a Zaroaskra fort, for some dramatic photos before making our way a little further up the hill to the hot springs of Babi Fatima. 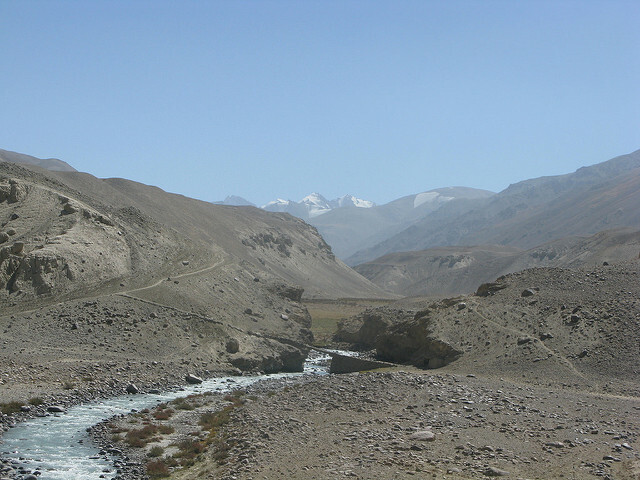 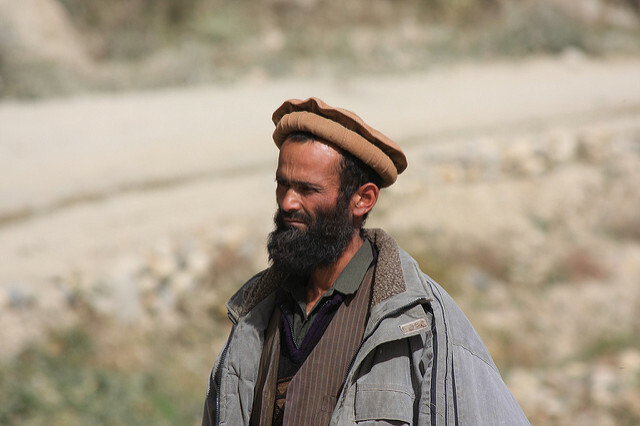 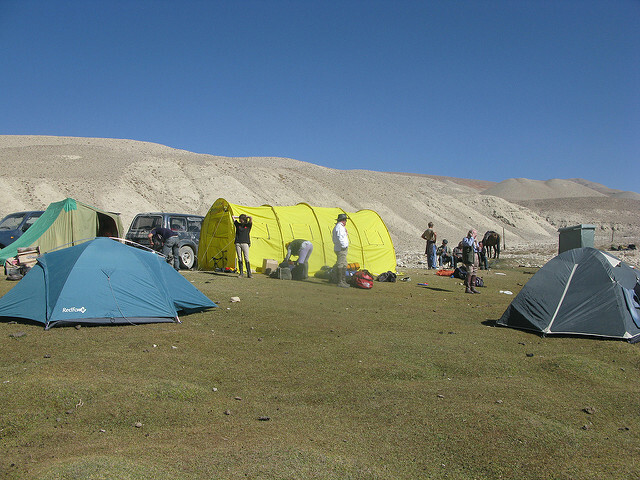 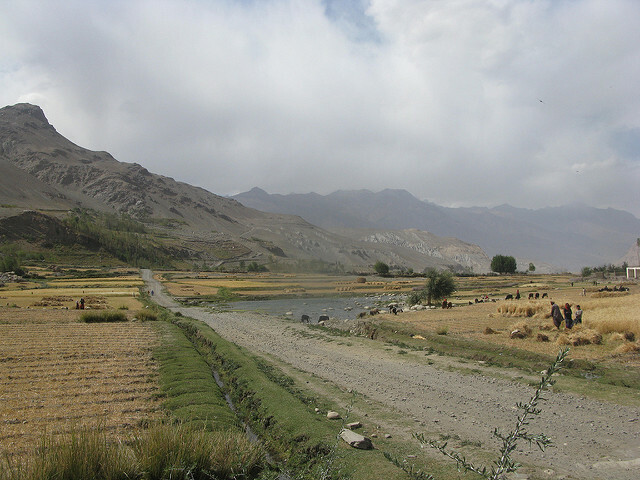 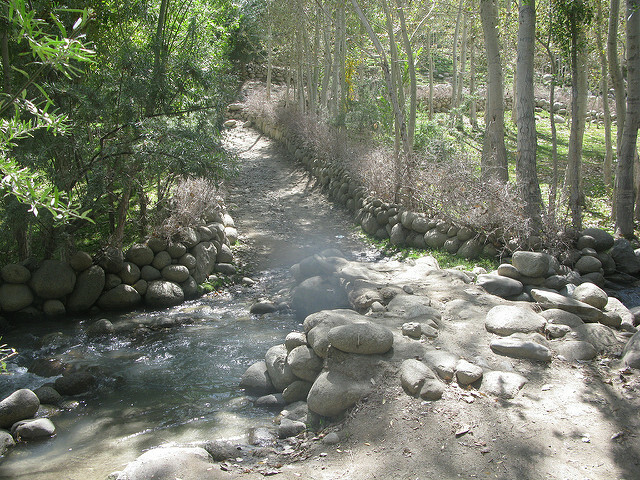 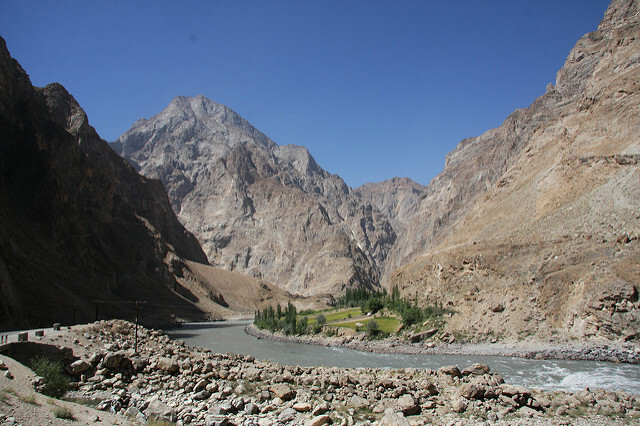 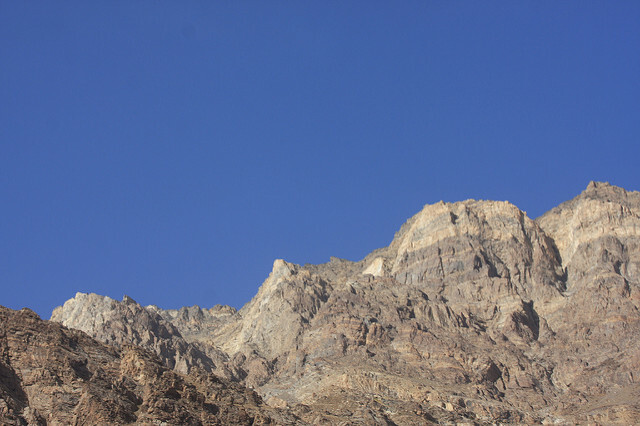 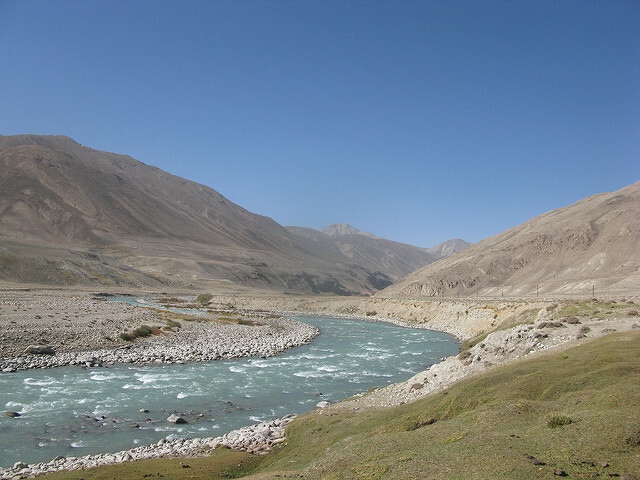 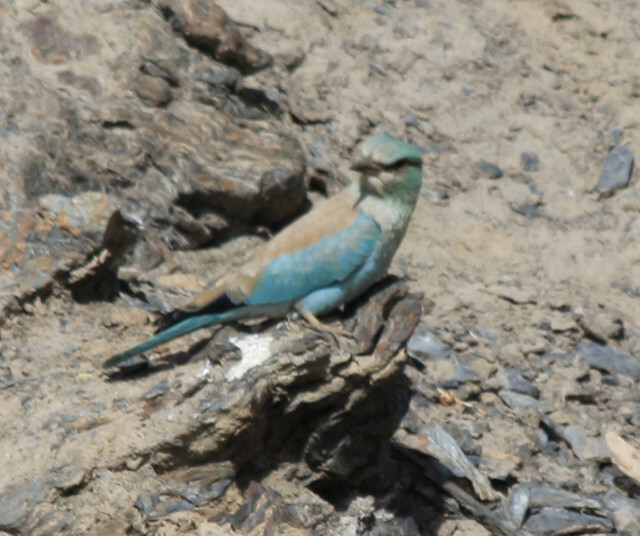 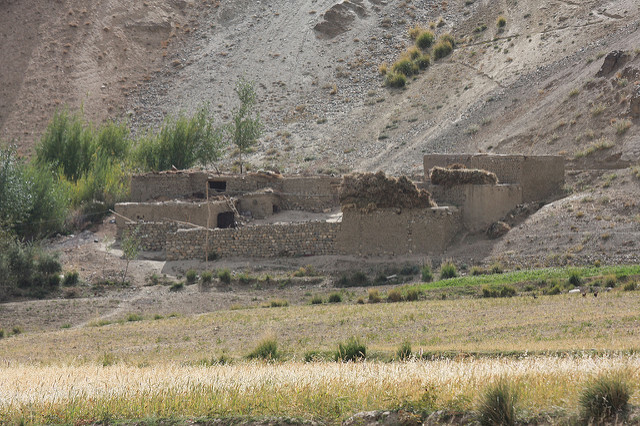 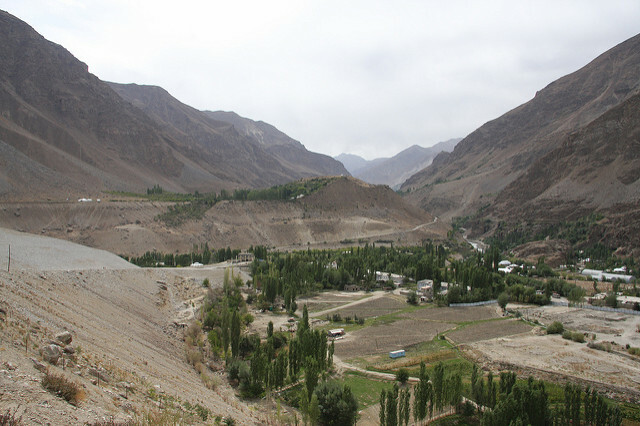 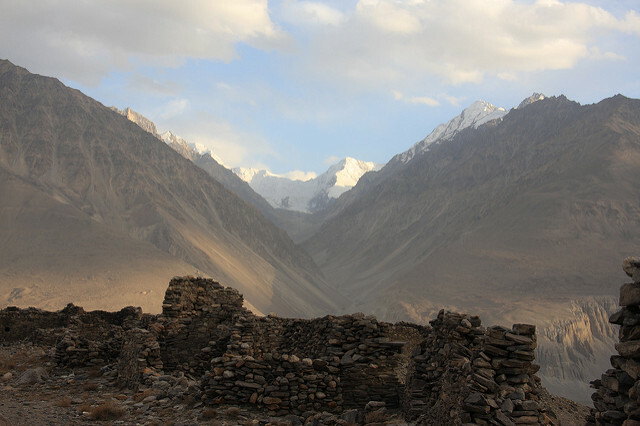 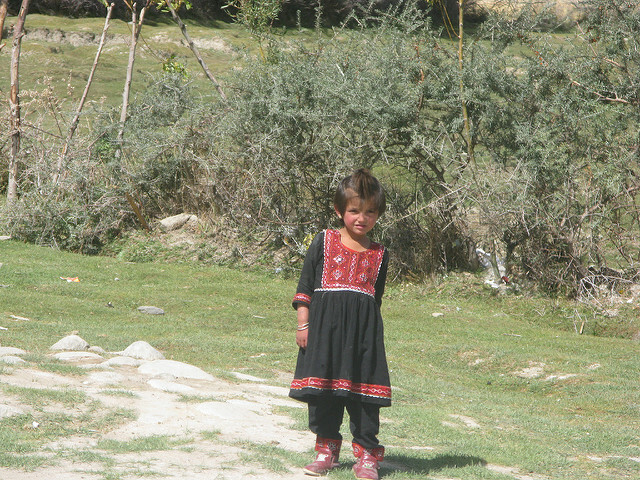 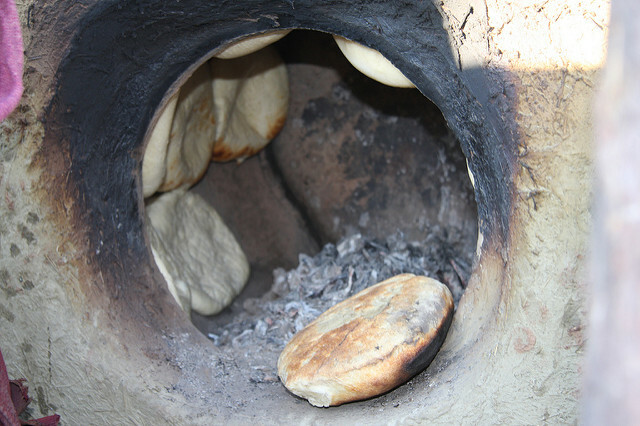 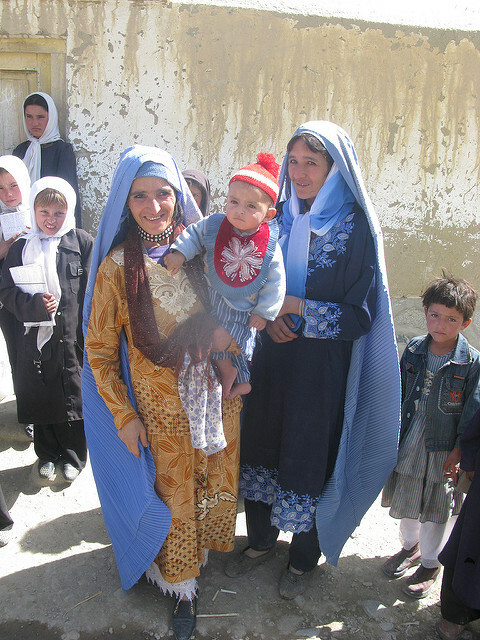 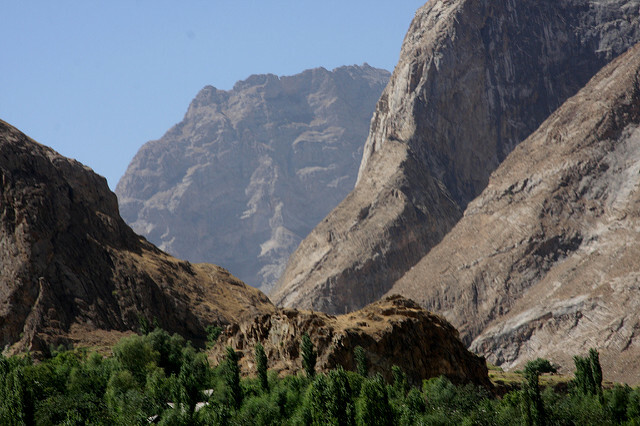 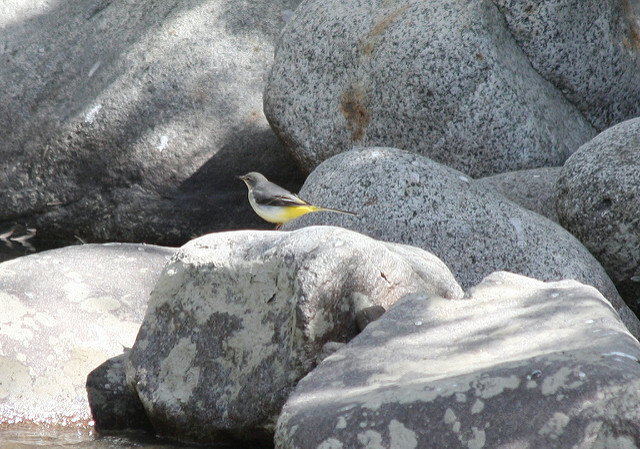 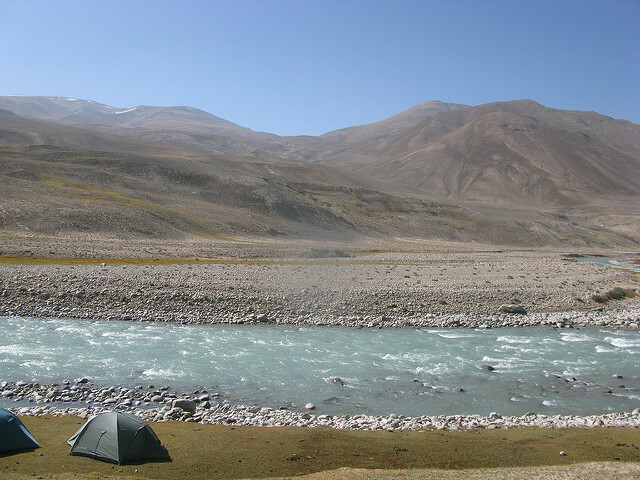 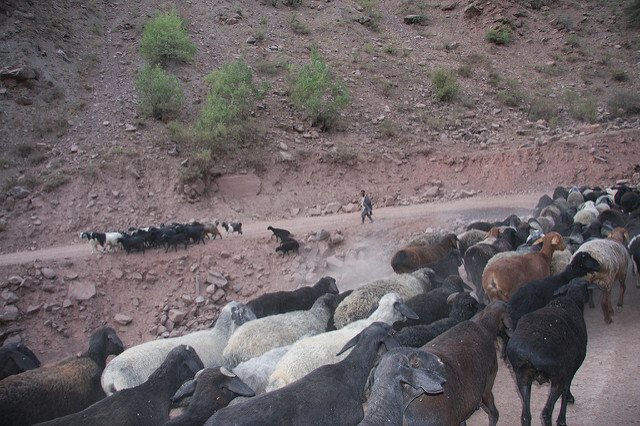 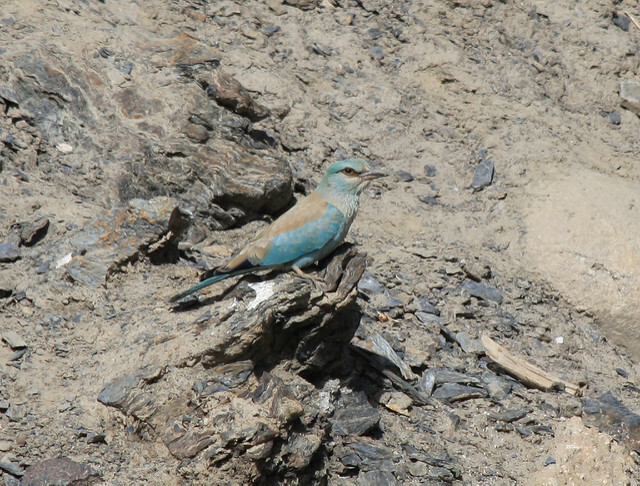 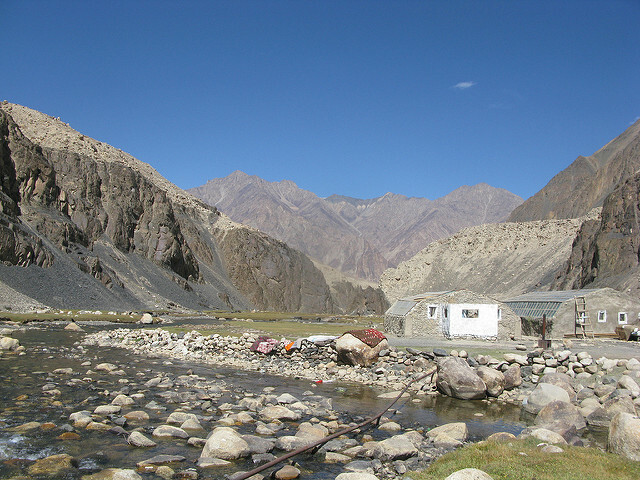 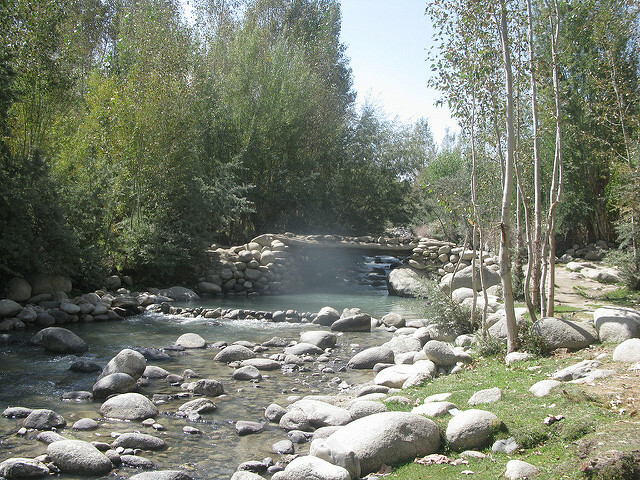 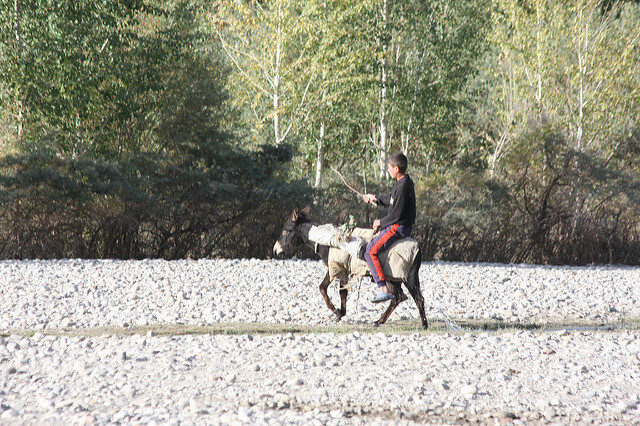 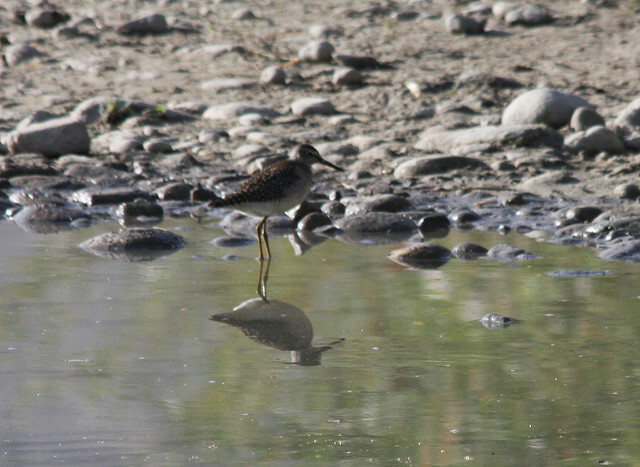 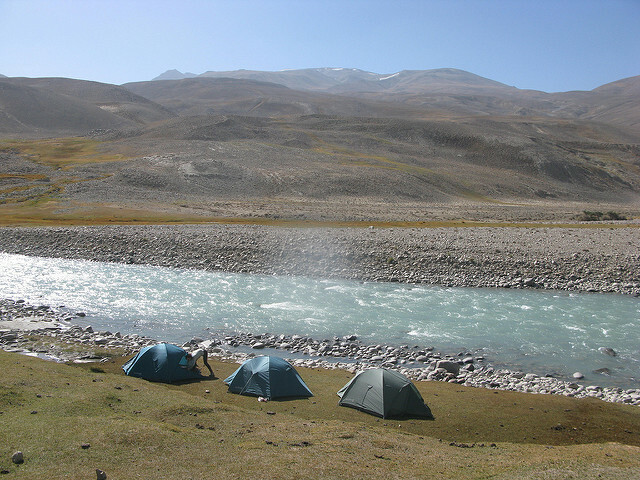 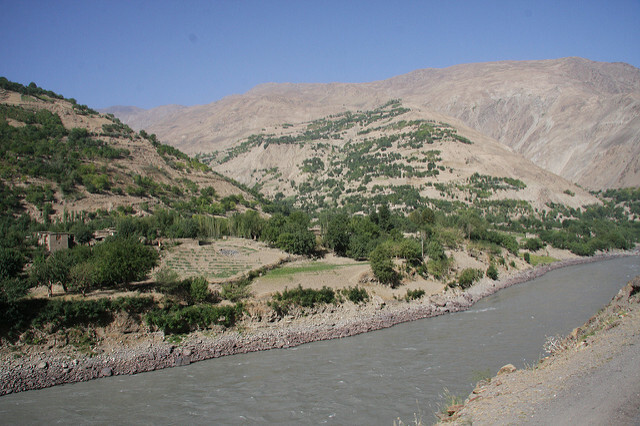 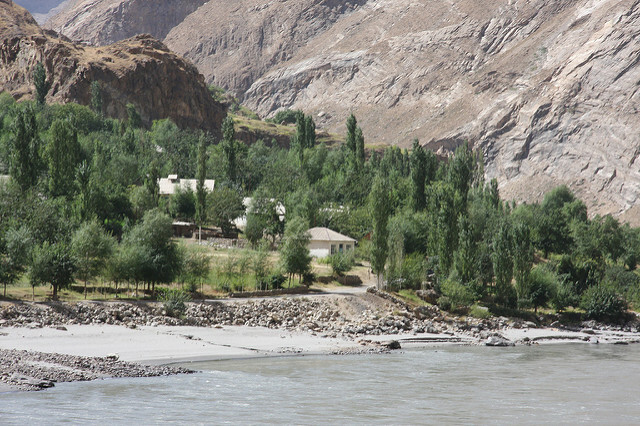 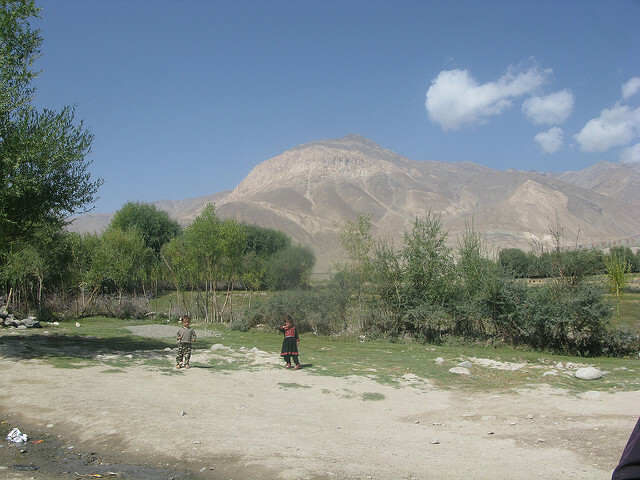 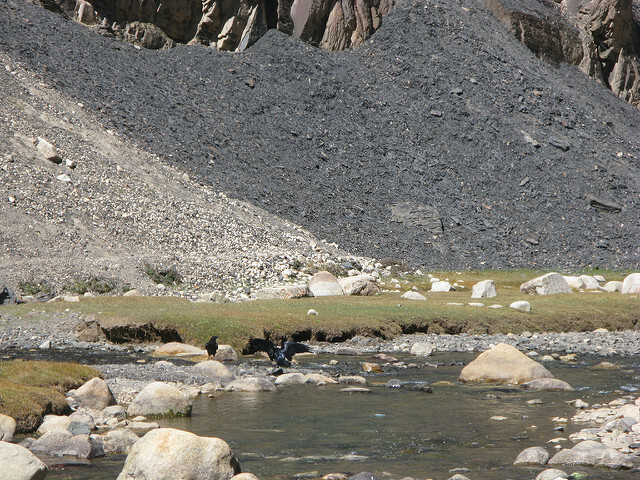 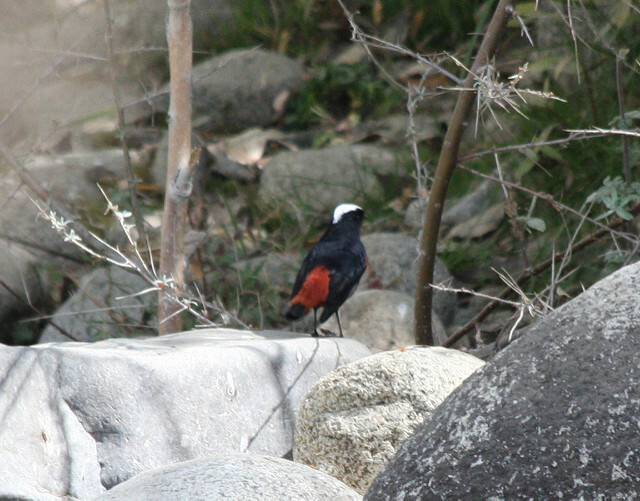 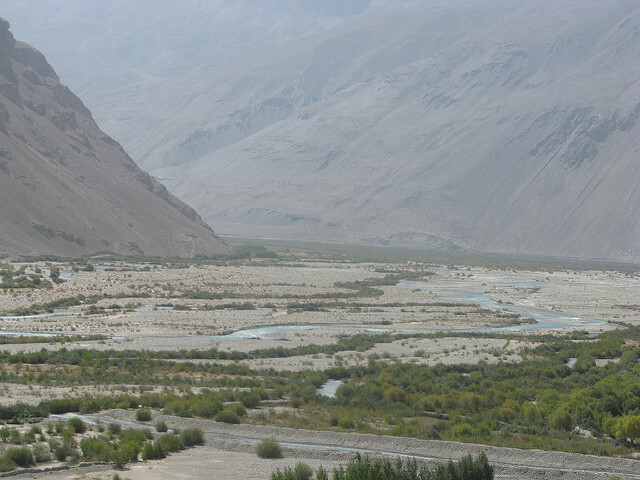 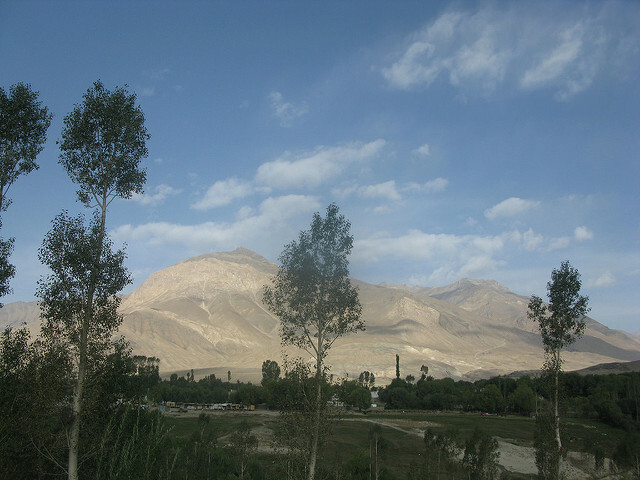 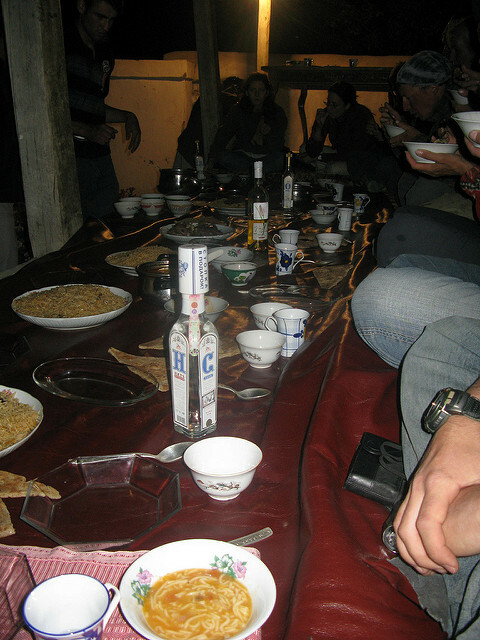 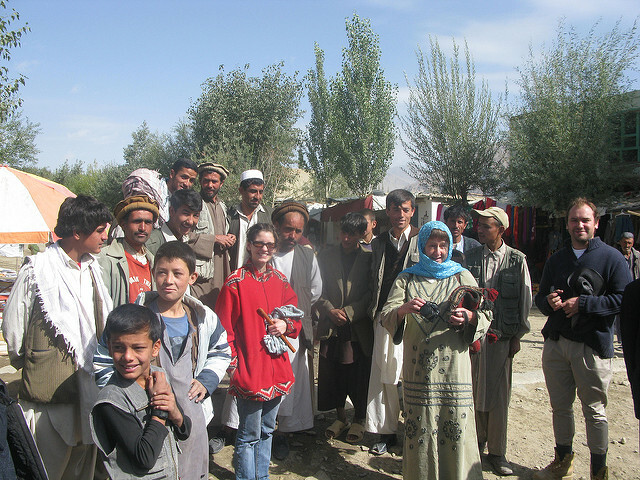 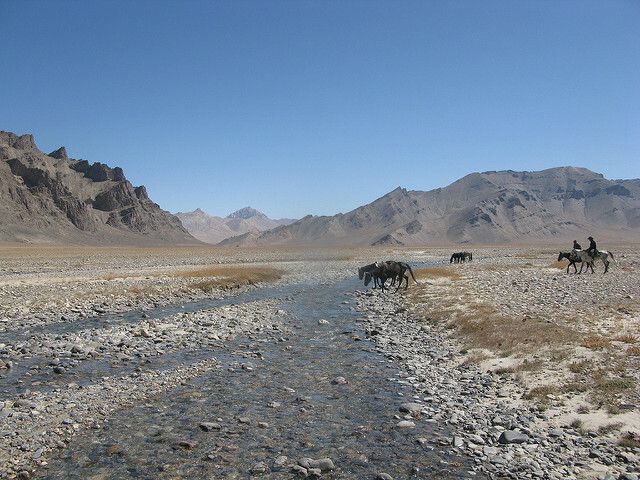 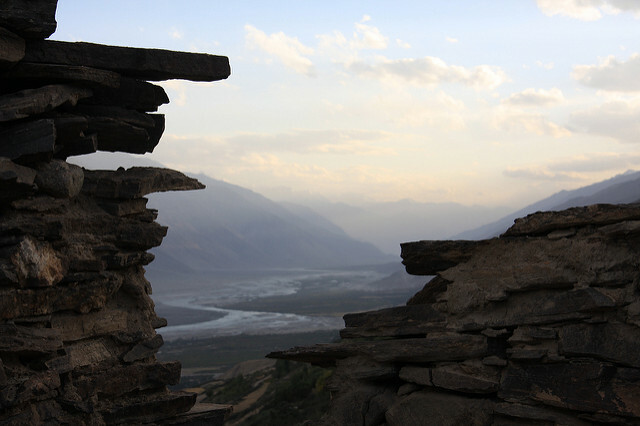 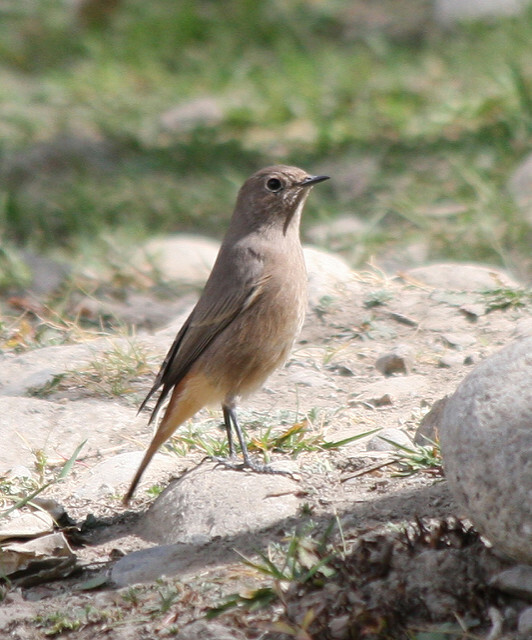 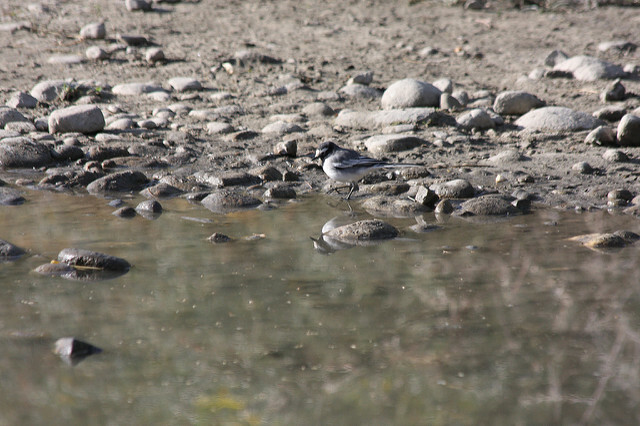 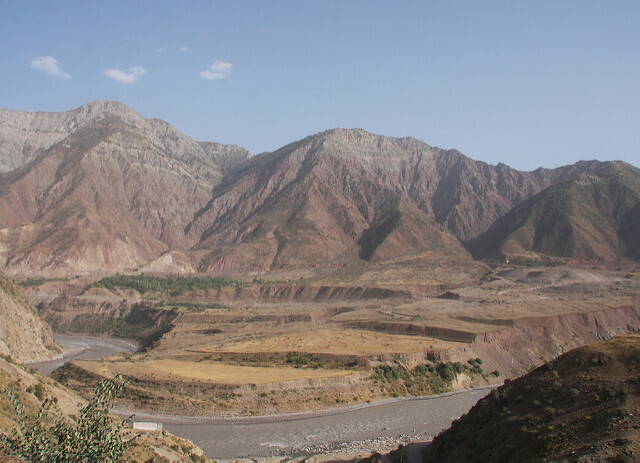 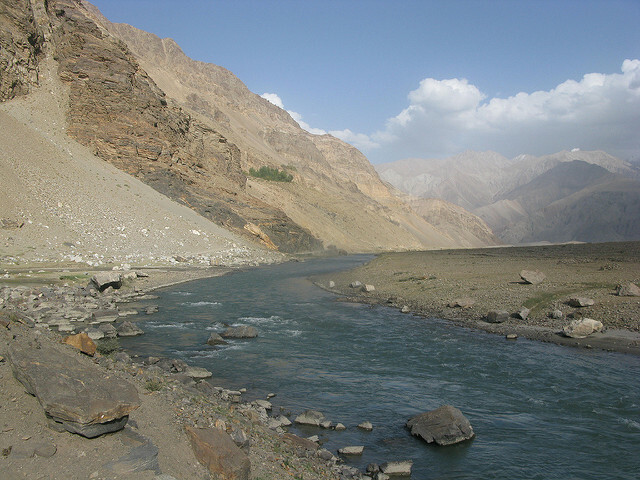 We camped beside the river overlooking a Kygyz village situated high up on the hillside in Afghanistan across the river. 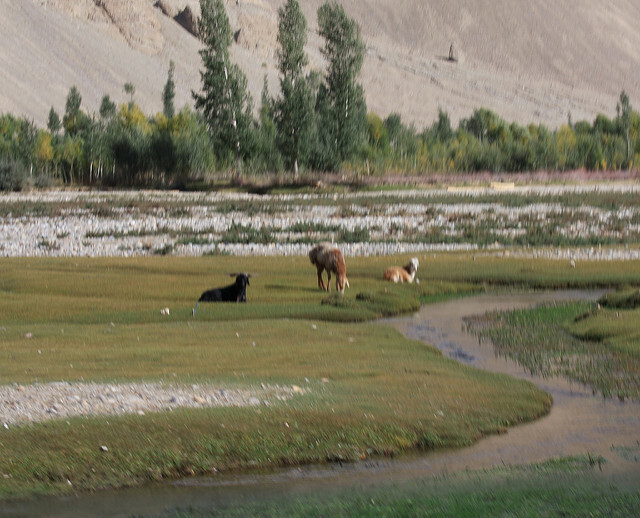 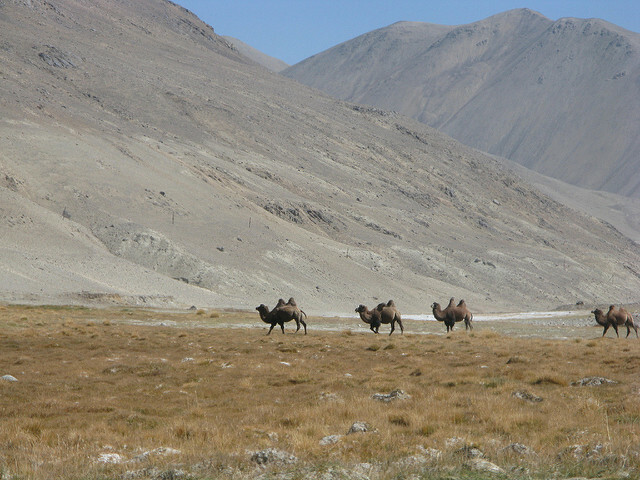 The day started with us continuing alongside the river where we encountered some Bactrian Camels. 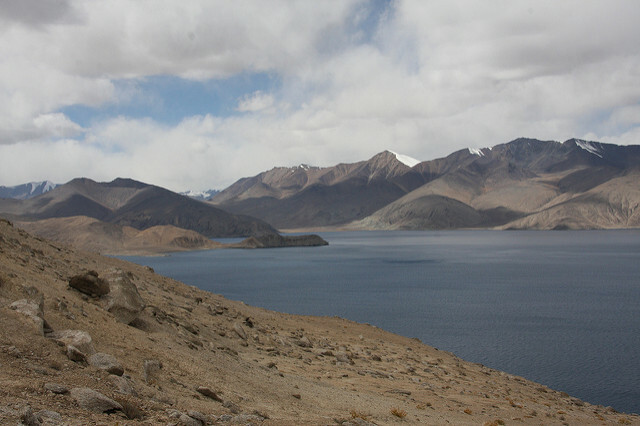 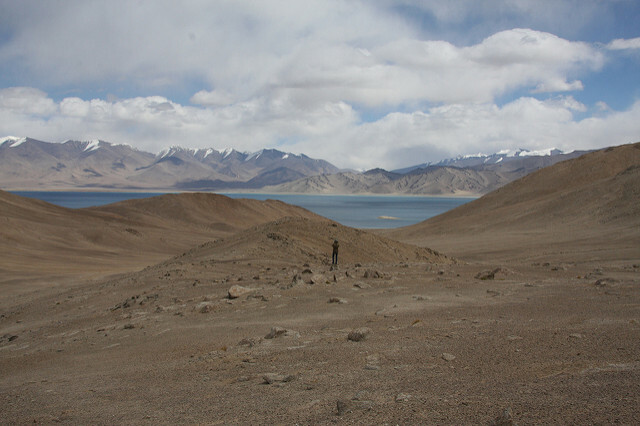 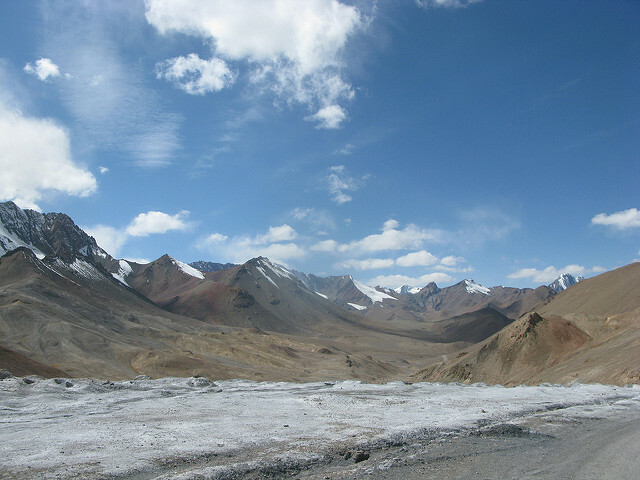 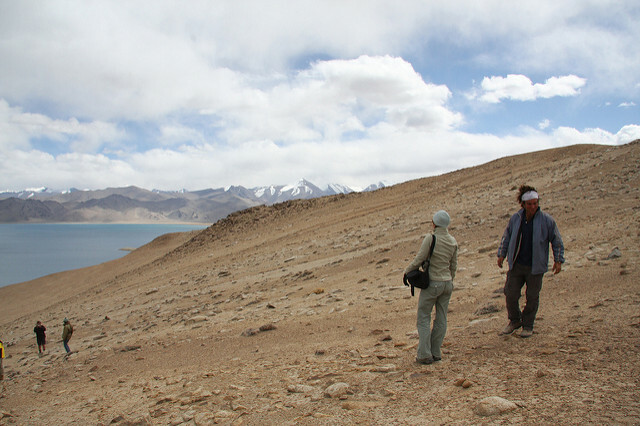 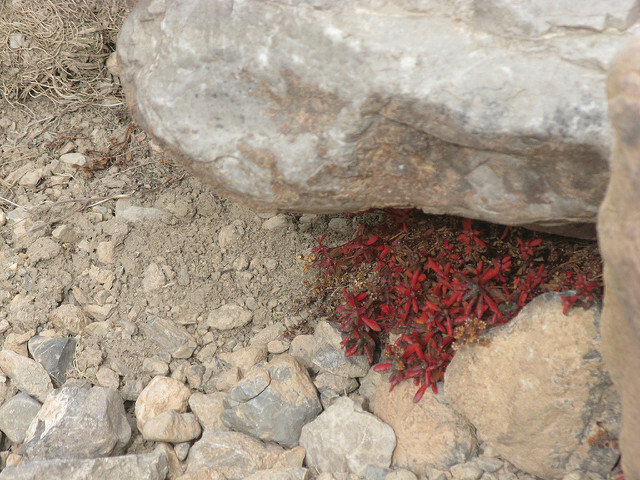 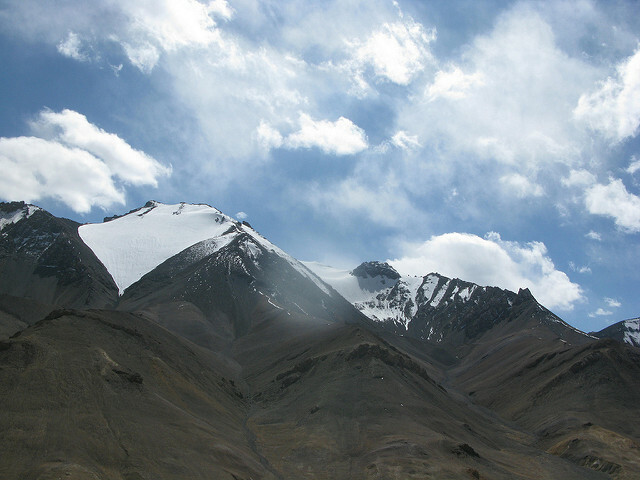 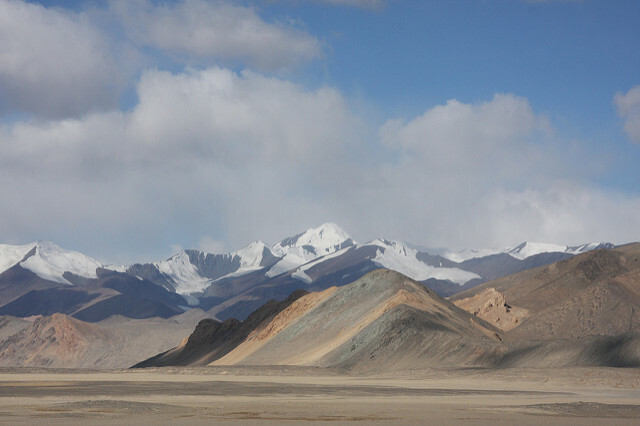 Later we climbed up to the Khargush check point (3800m) and lunched near the pass at 4344m. 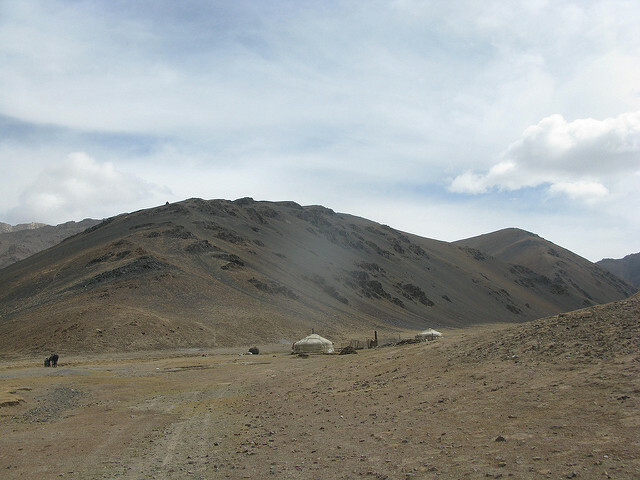 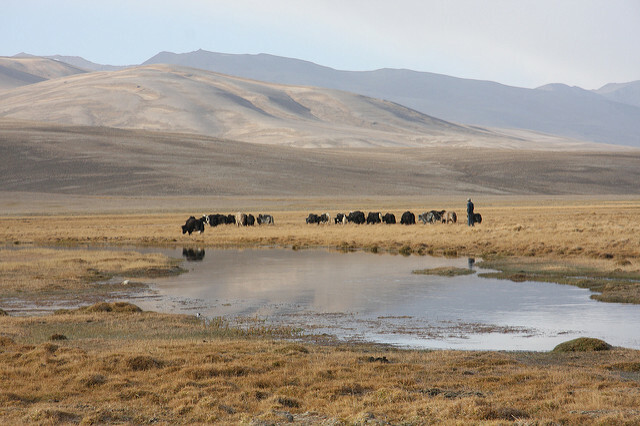 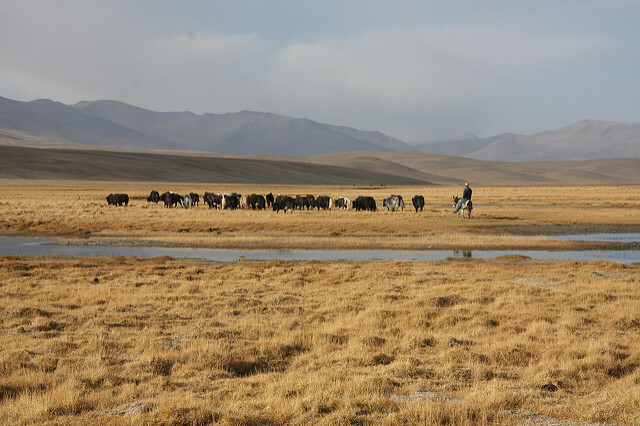 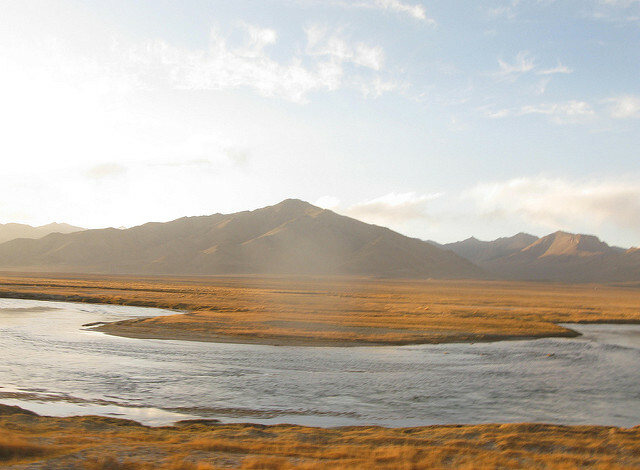 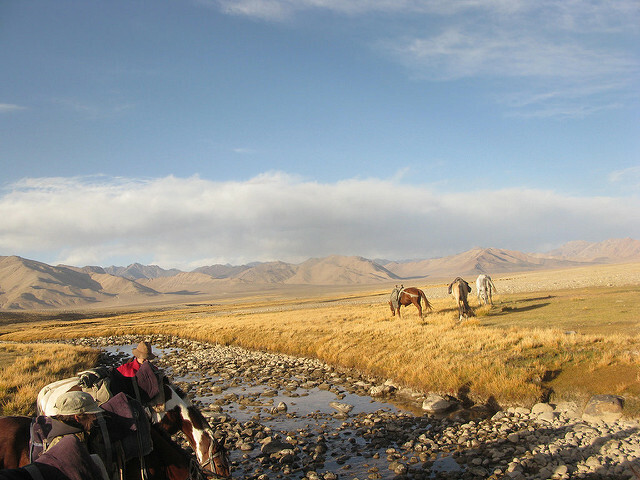 After a very cold night due to the altitude we left camp at 0915 and rode past several salt lakes and passing yurts and Yaks before finally crossing the river in the pitch dark to arrive at 1915. 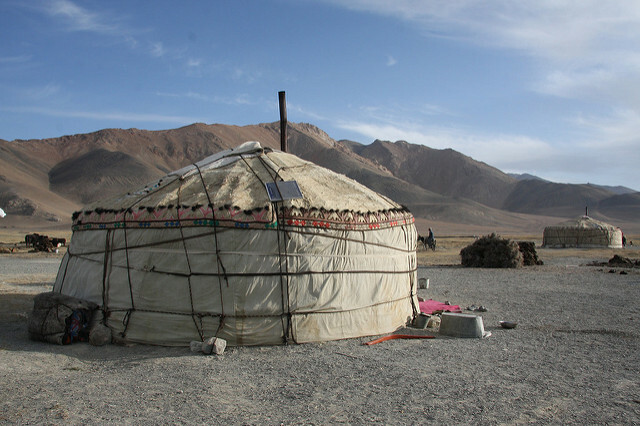 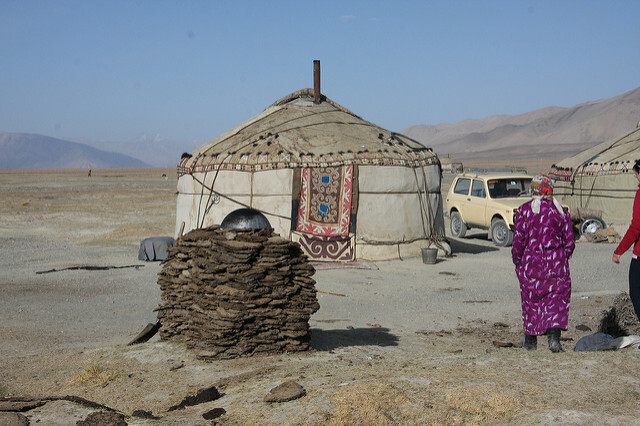 Some of the group slept in a Yurt and some in tents. 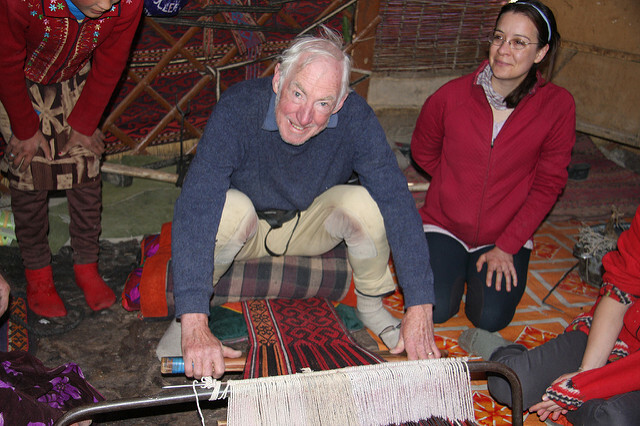 After breakfast we saw how our hosts wove wool rugs. 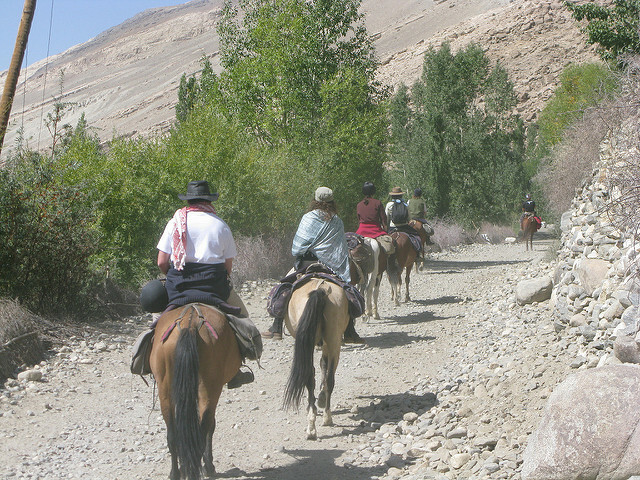 We rode for a good distance up the Alichur valley a lot of the time being on or just beside the road. 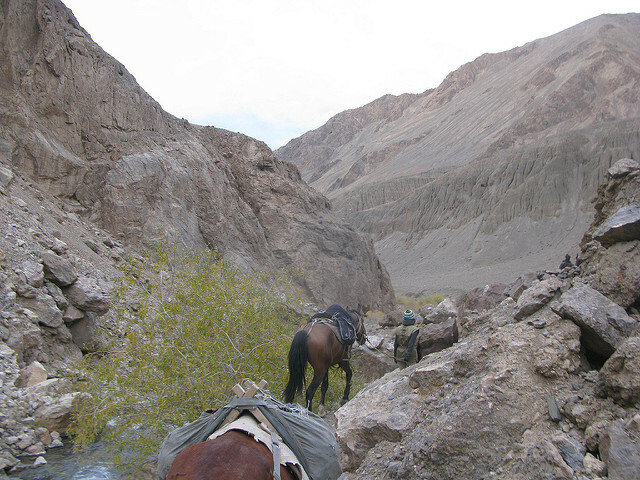 Then we turn off up a valley to camp. 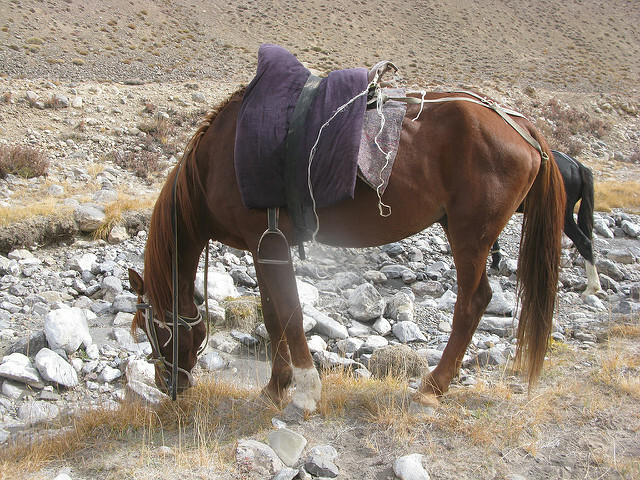 Another cold night (4050m)with a lot of ice on the stream in the morning. 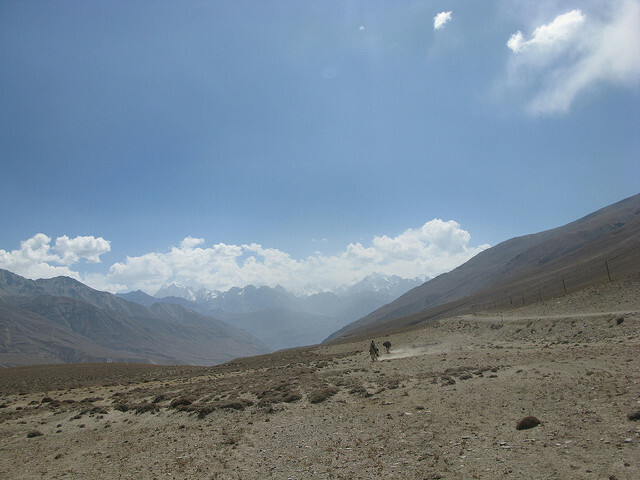 We set off up the valley with our first cloudy day. 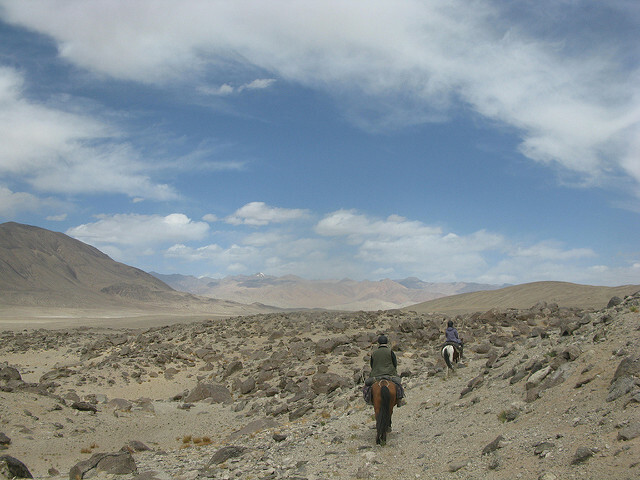 The ride was slow as we climbed up to the pass where it was cold and windy. 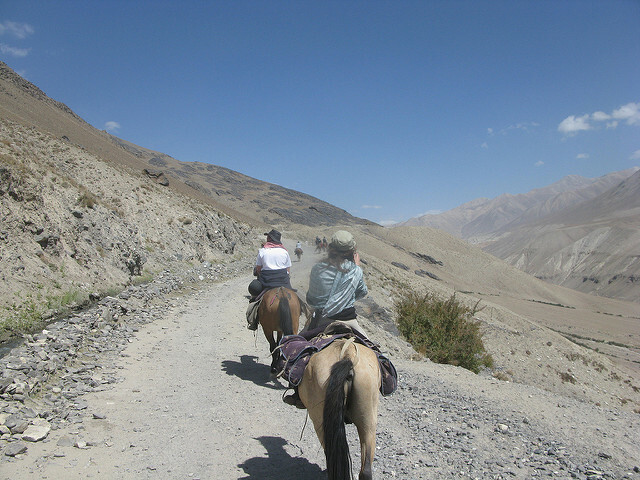 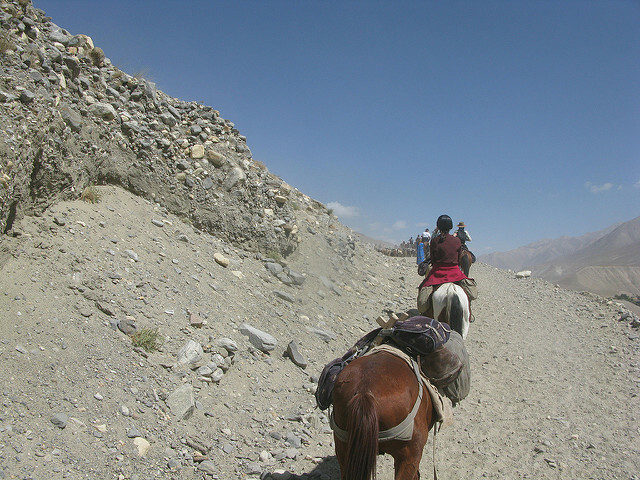 From the top the north side of the pass was scree and we needed to go slowly but the horses were great as always. 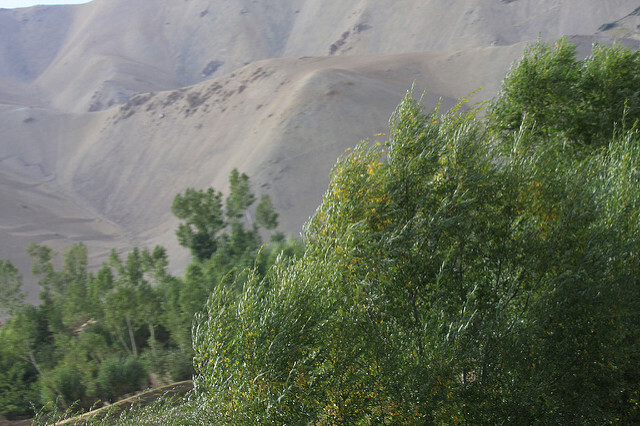 The valley was very picturesque as the leaves of the willow bushes further down were turning yellow. 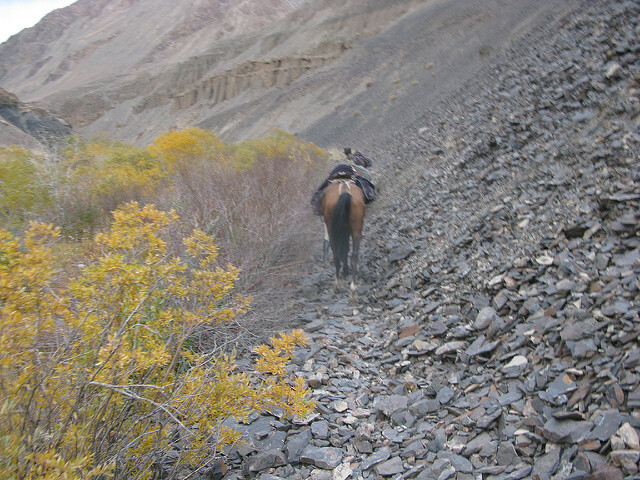 Our way at one point passed through a narrow canyon. 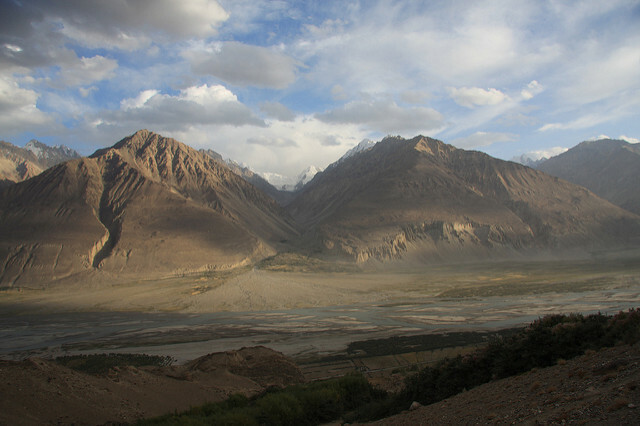 Down in the valley we had to cross the Aksu River before we could reach the camp. 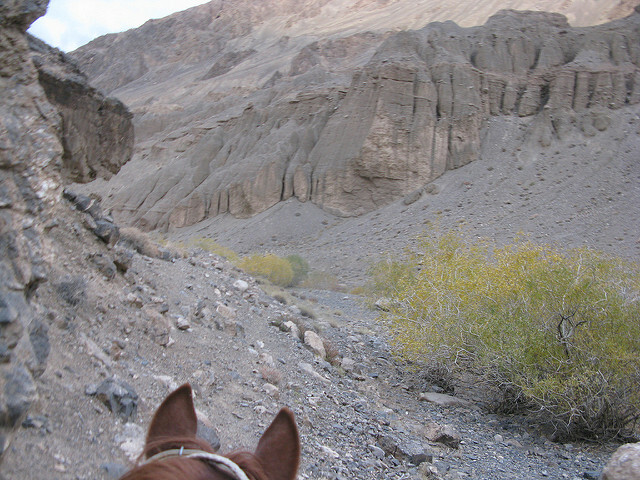 A really great day of riding! 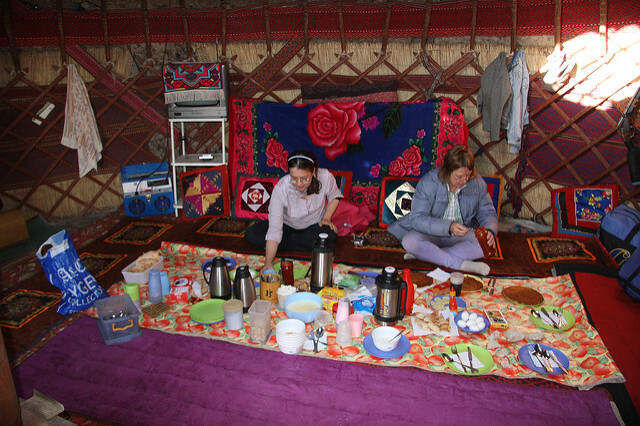 To-day we had a late breakfast before driving up the valley to the Eli Su hot springs for a welcome bath and picnic. 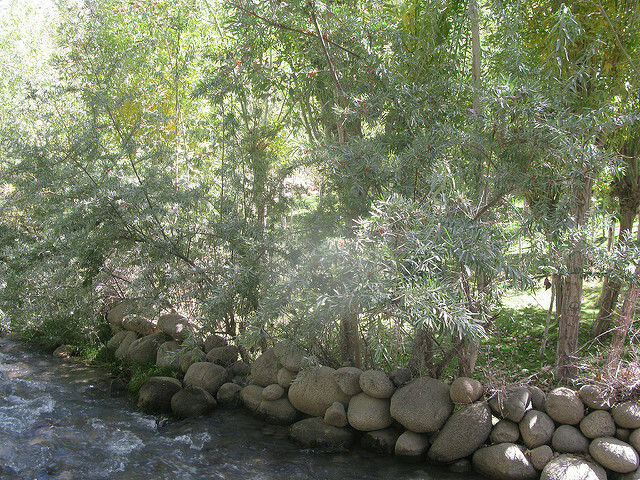 A lazy afternoon spent reading and writing. 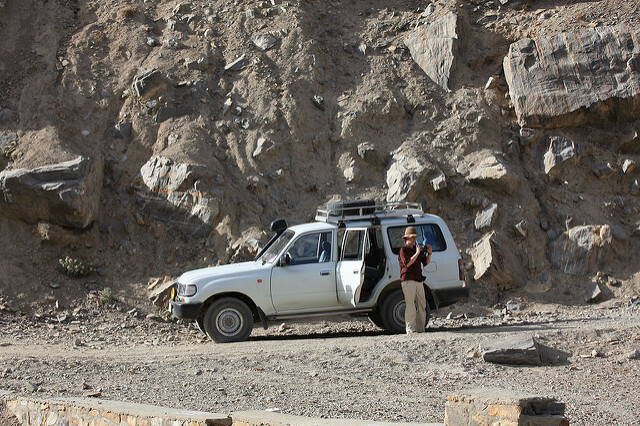 The ride to-day was mostly on the road including a dash through Murgab so that we didn't get stopped by the police for a passport check. 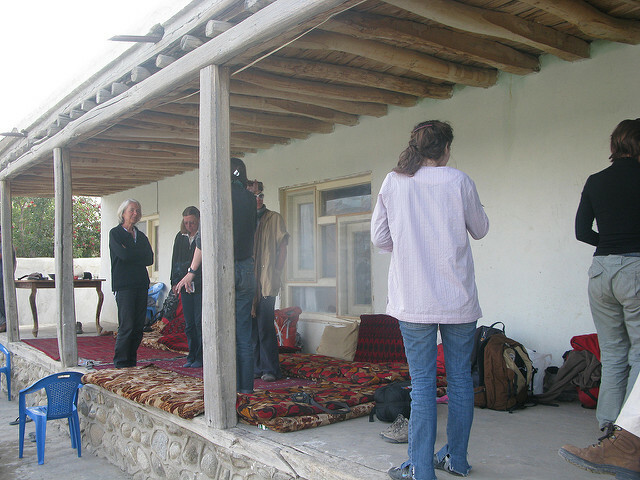 We camped outside the village of Čečety once one of four sites used by the Russian Atomic bomb research. 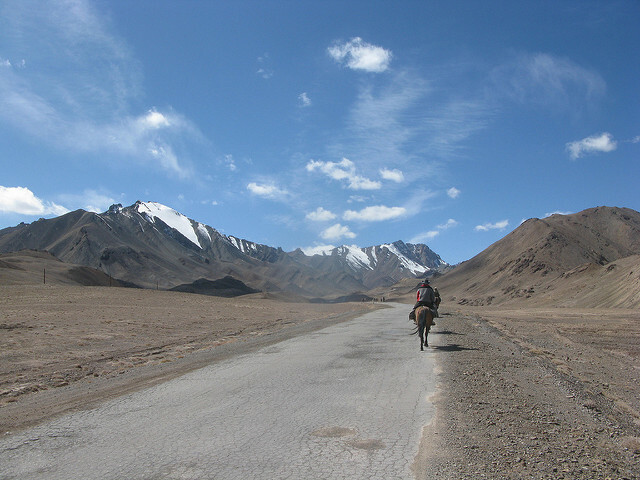 Seventh day of riding north beside the Chinese border. 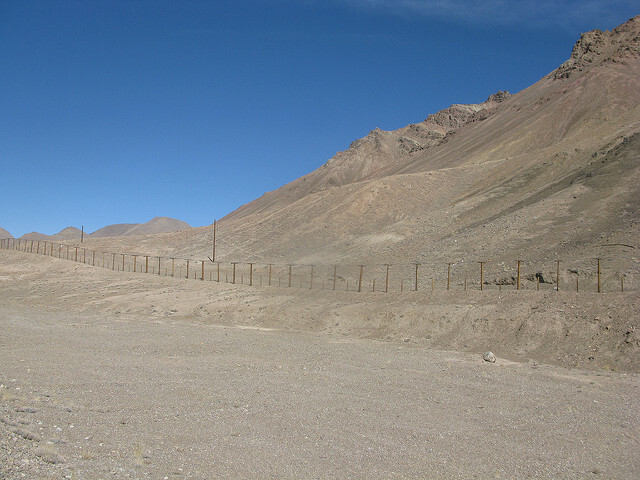 Another day of riding beside the road with the border fence on our right. 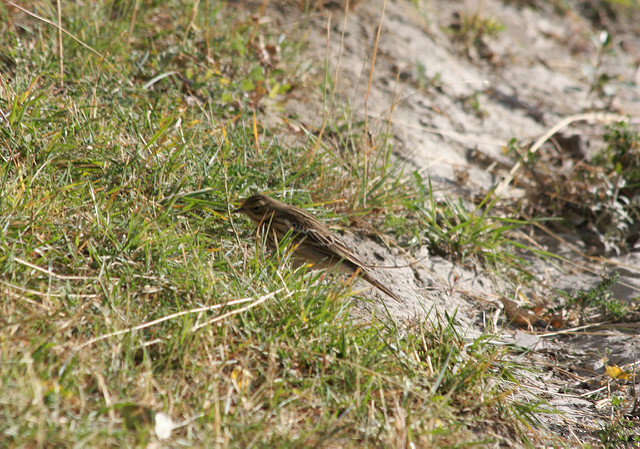 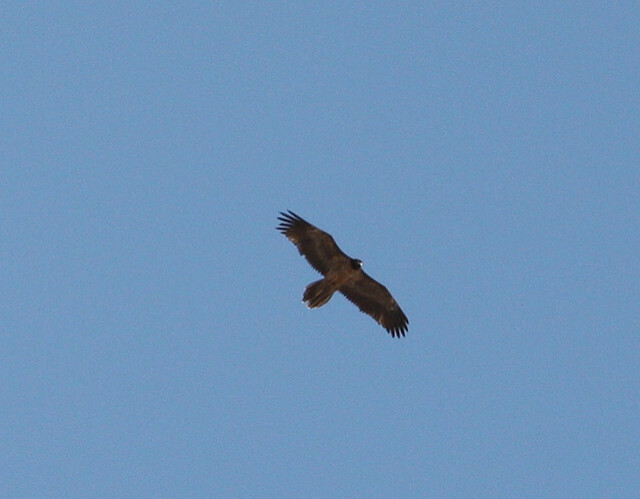 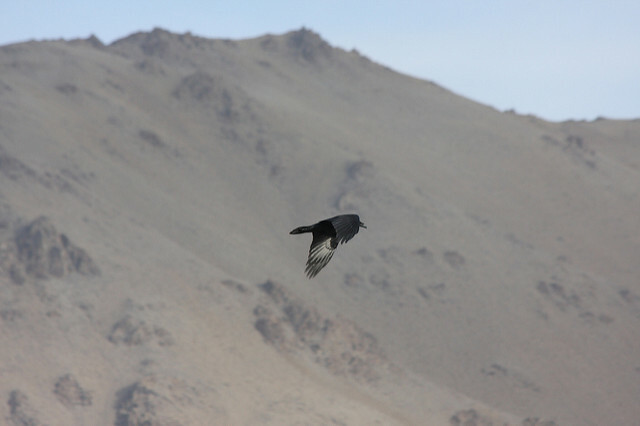 On our ride we disturbed a hare which was then chased by a Chough and later a Raven but it found a hiding place. 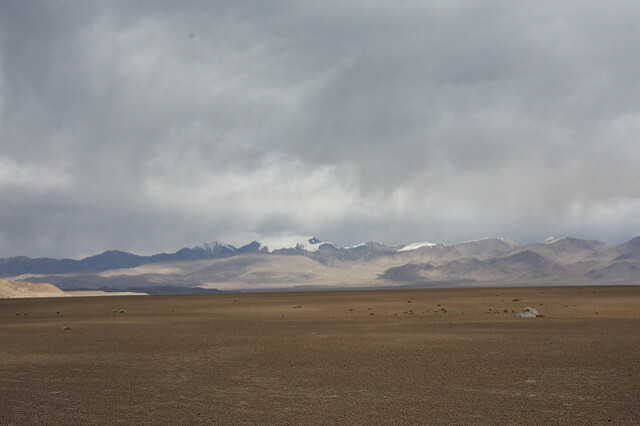 We camped at 4050m for another very cold night about 50m from the Chinese border fence. 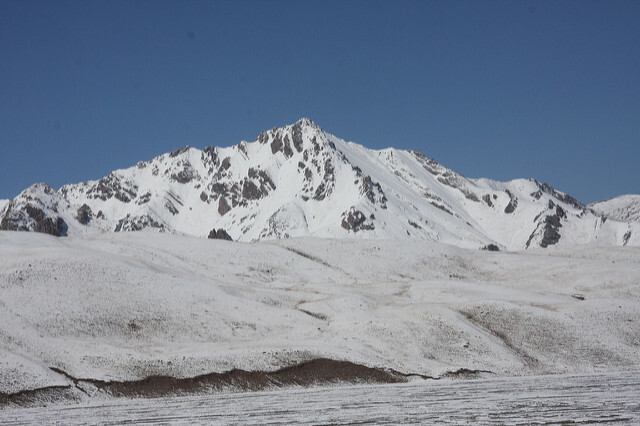 The grooms said it was -8°C during the night. 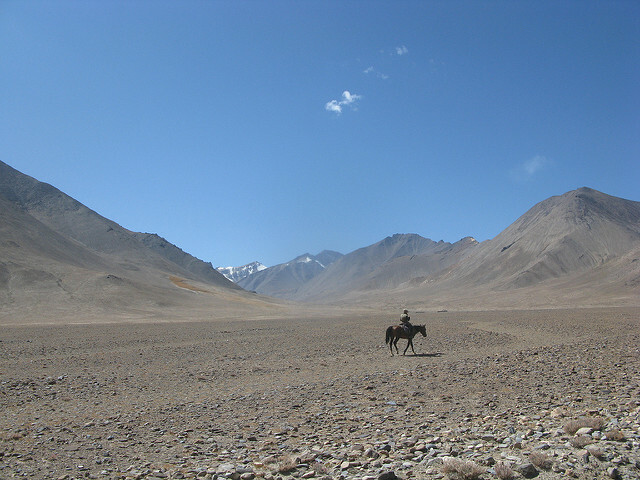 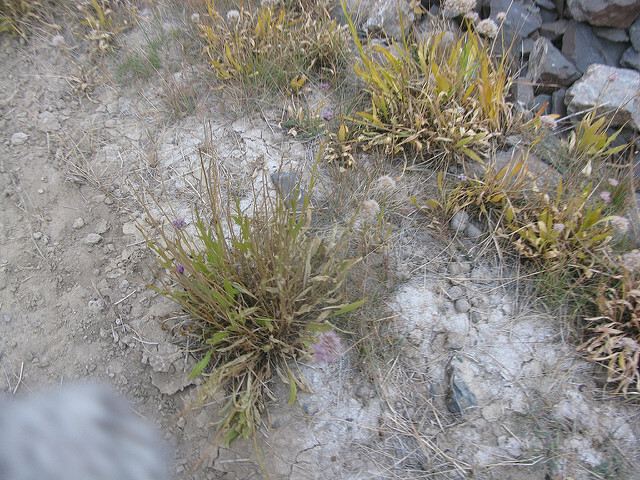 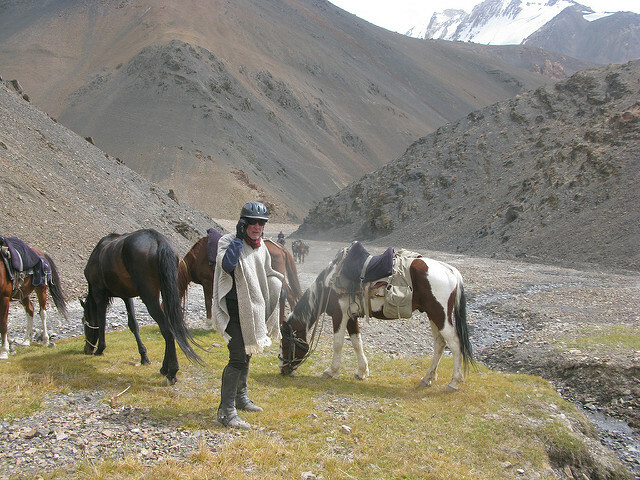 Eighth day of riding over the Ak-Baital Pass. 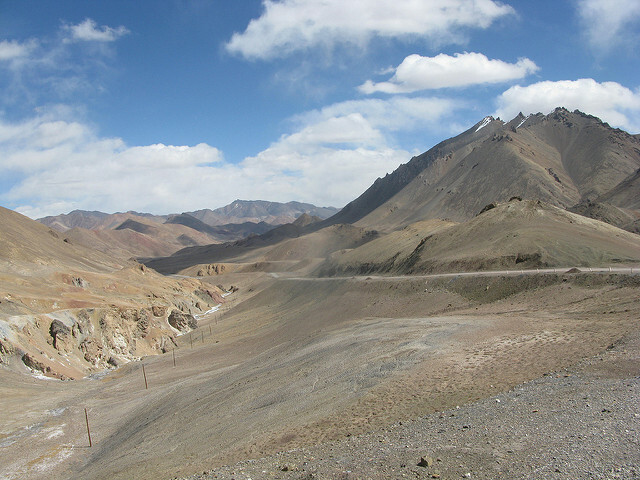 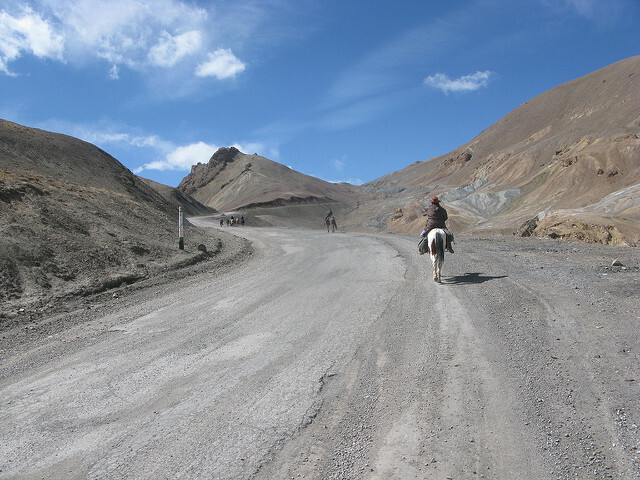 To-days ride was on the road as we climbed up to the Ak-Baital or White Horse Pass at 4655m. 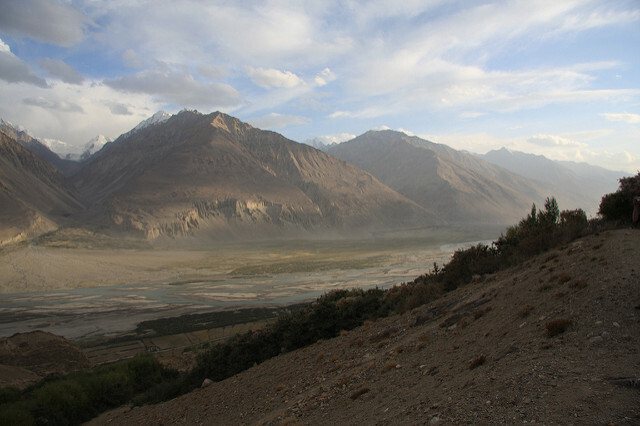 The views were beautiful. 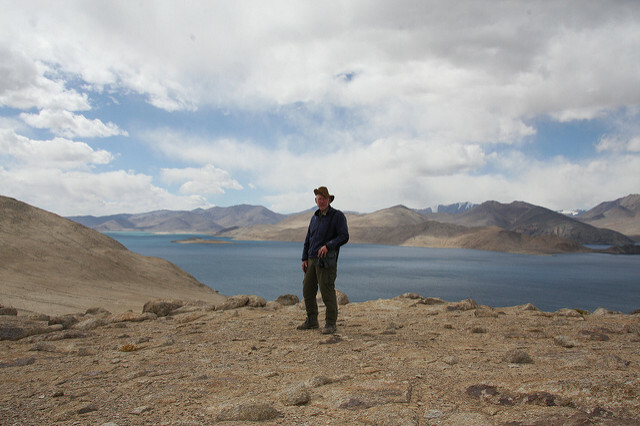 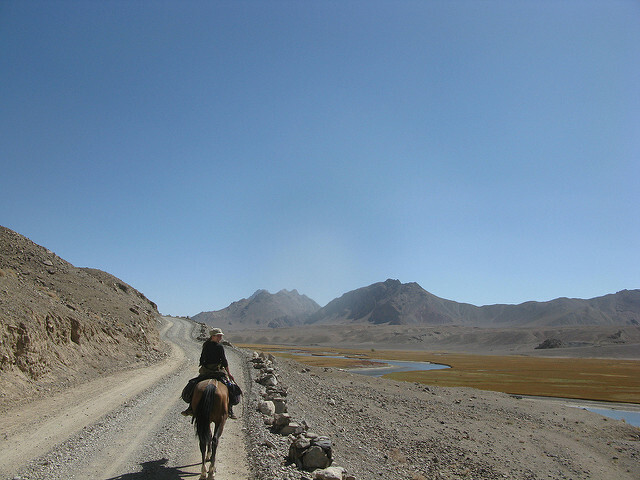 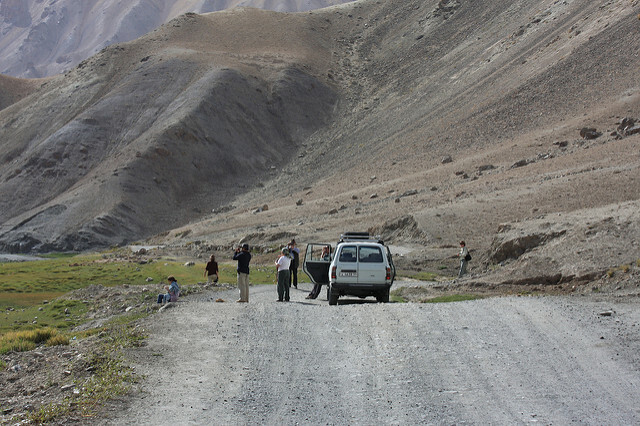 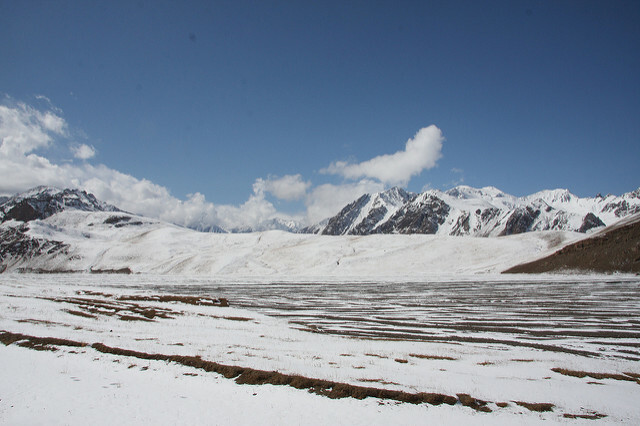 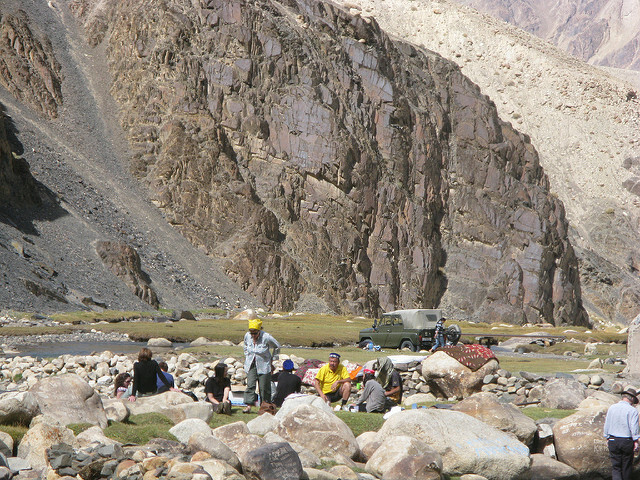 Once over the pass we soon transferred to the jeeps at 1430 so that we could stay at Karakul (Black Lake). 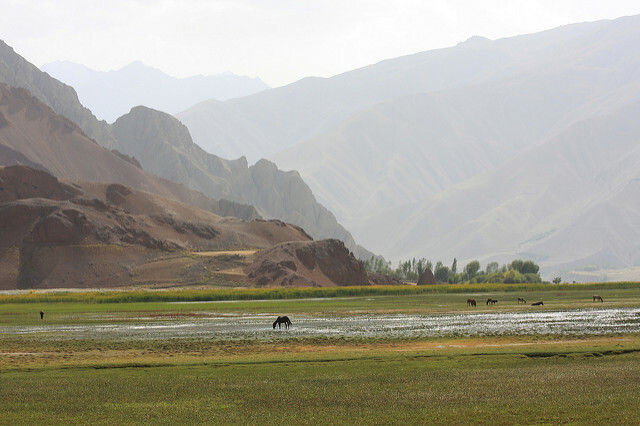 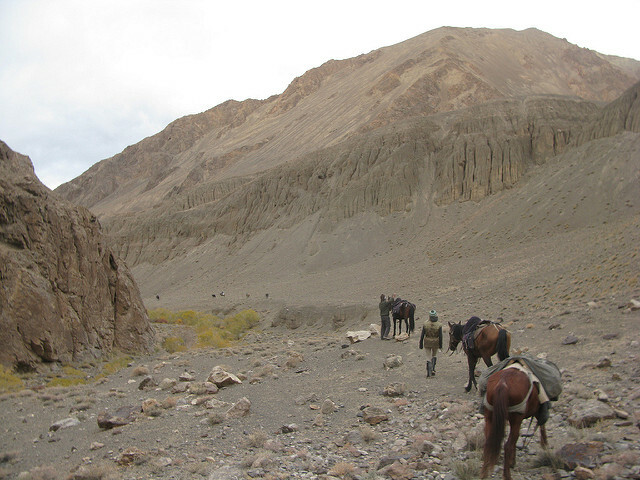 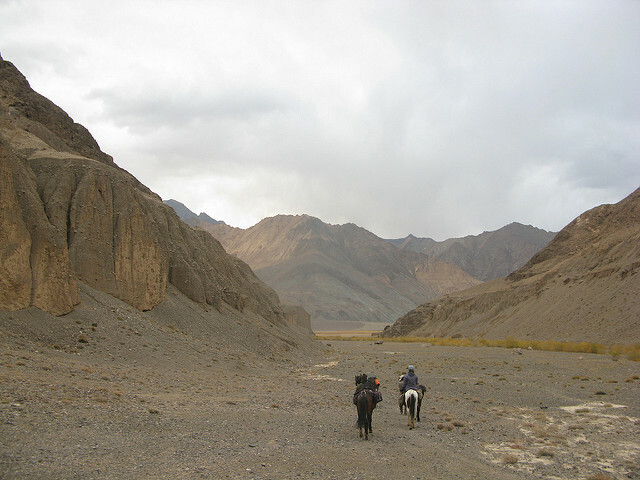 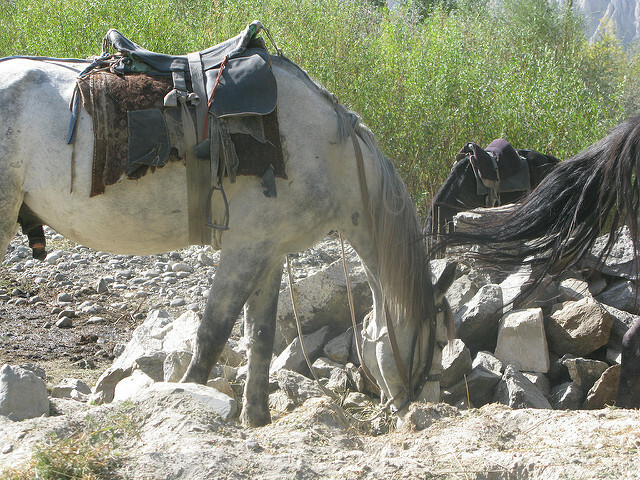 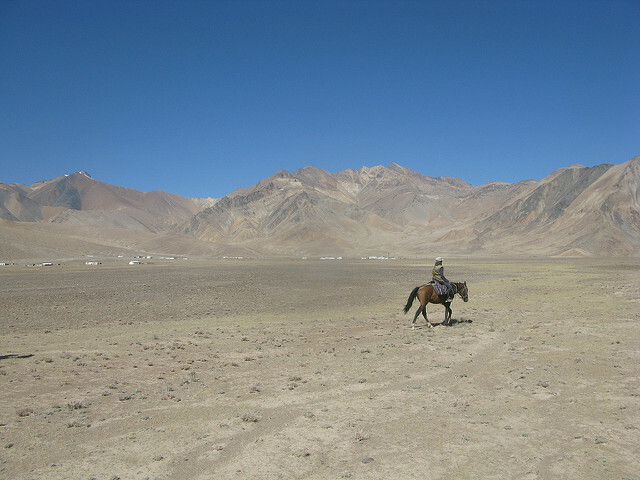 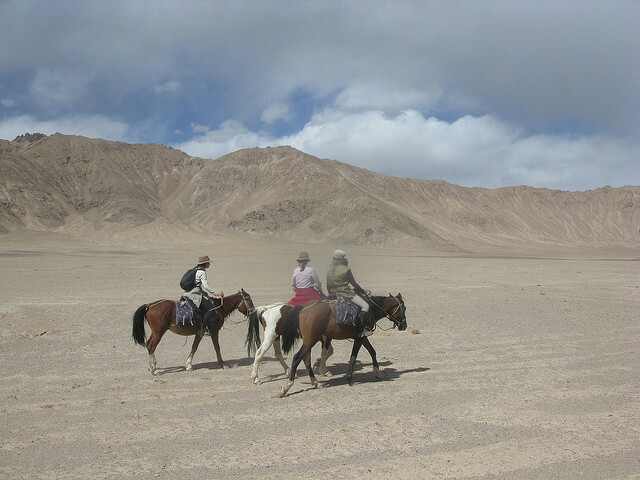 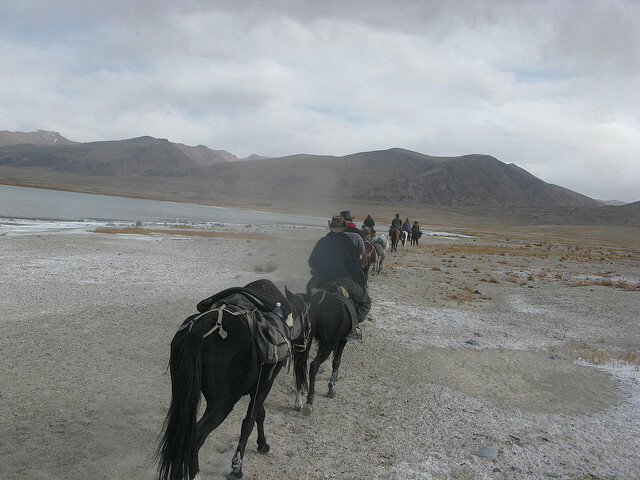 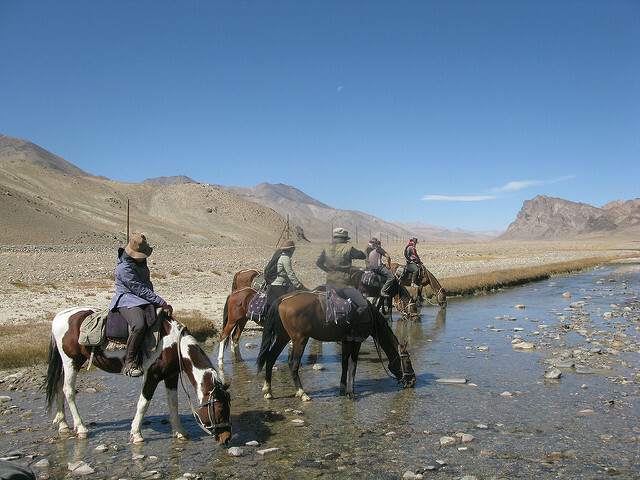 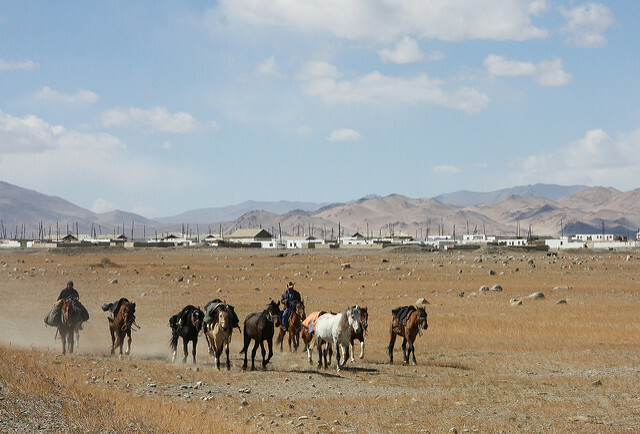 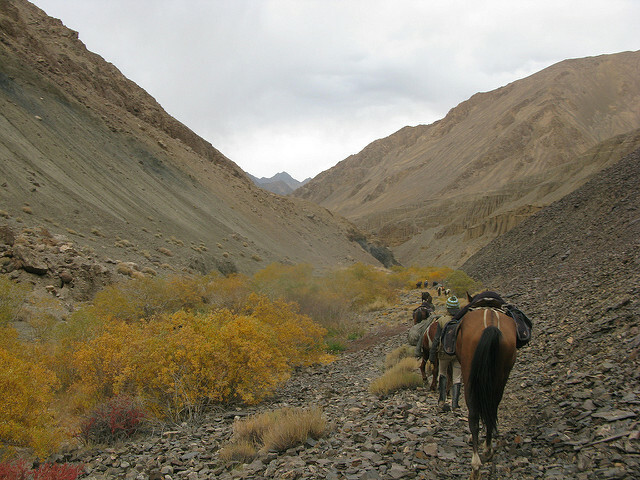 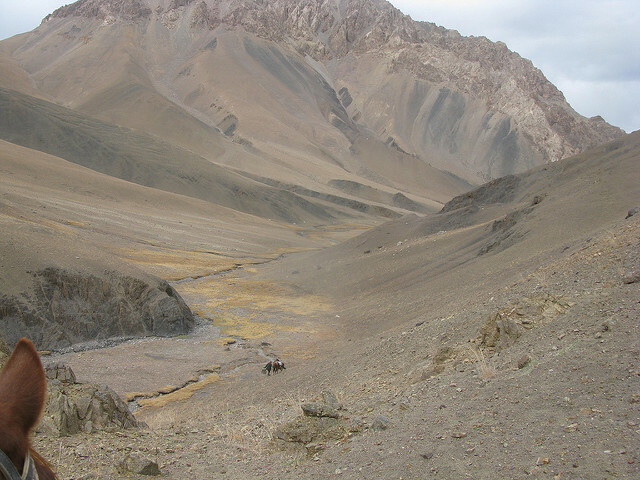 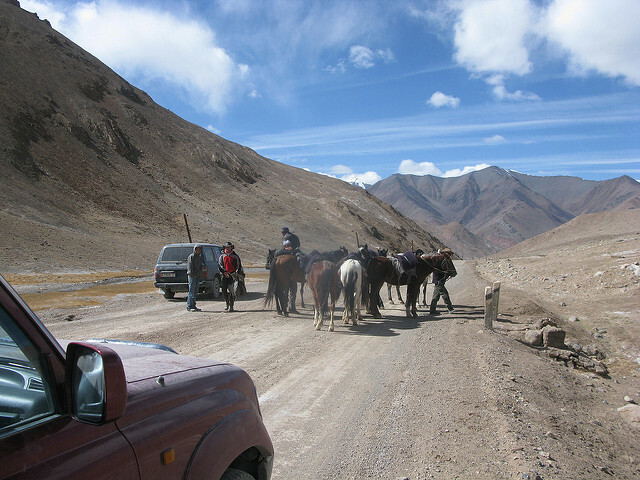 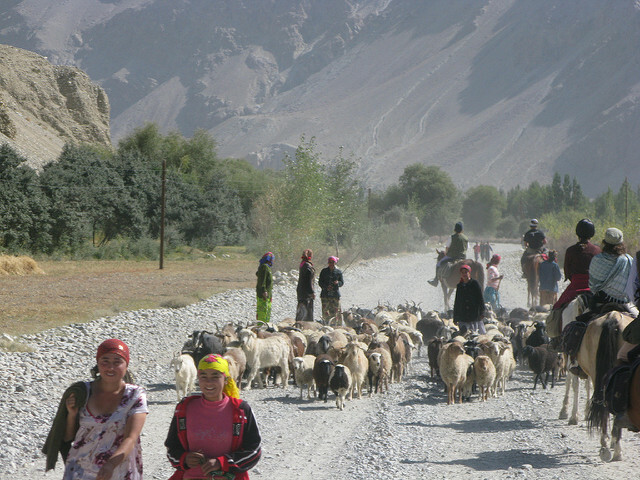 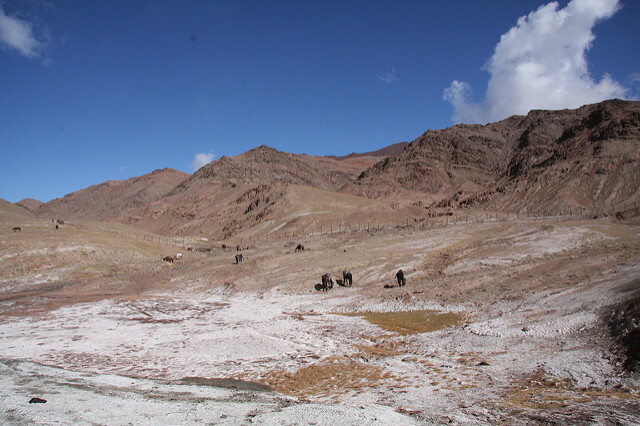 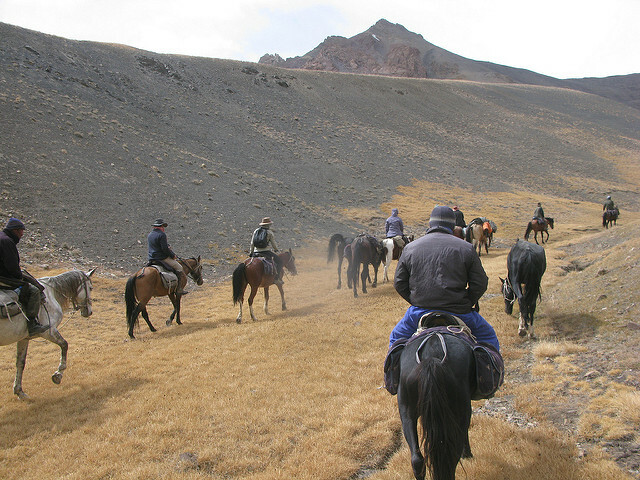 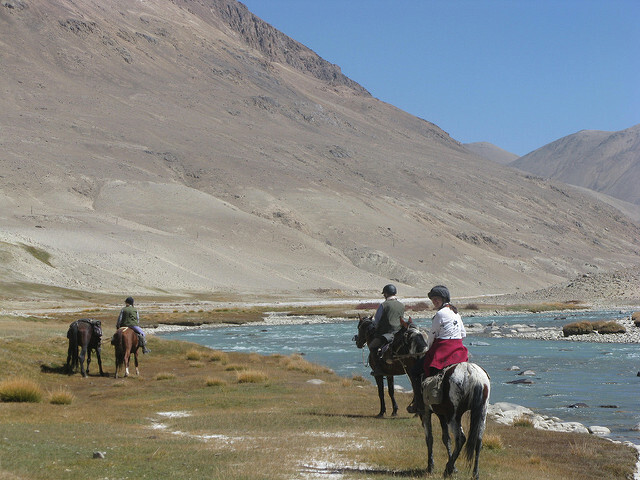 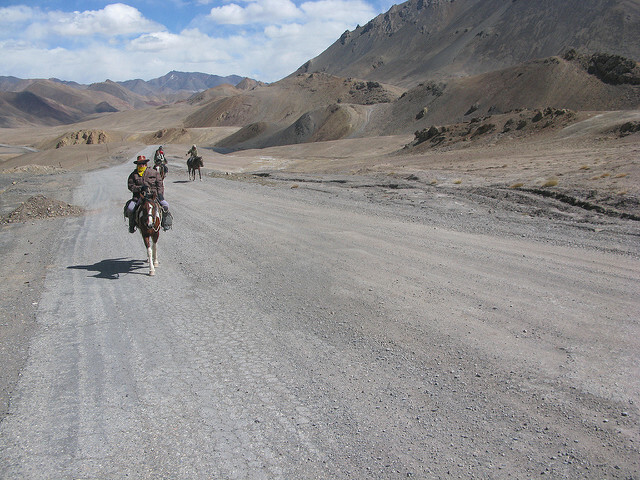 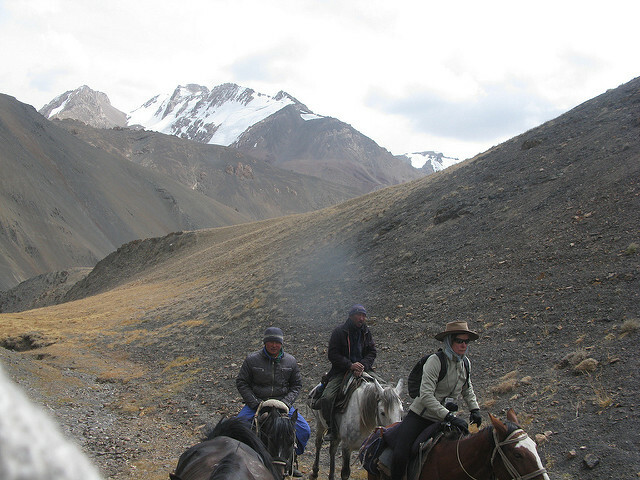 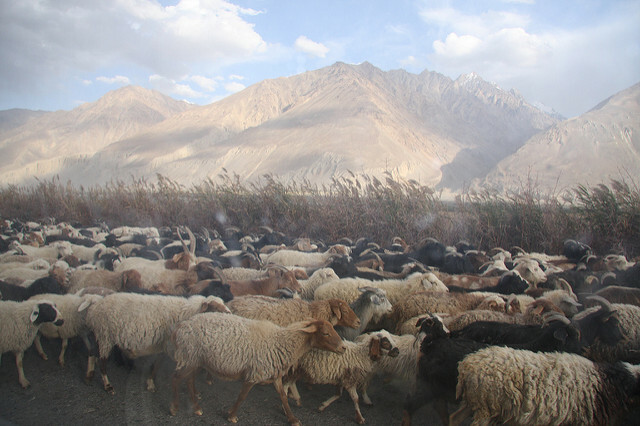 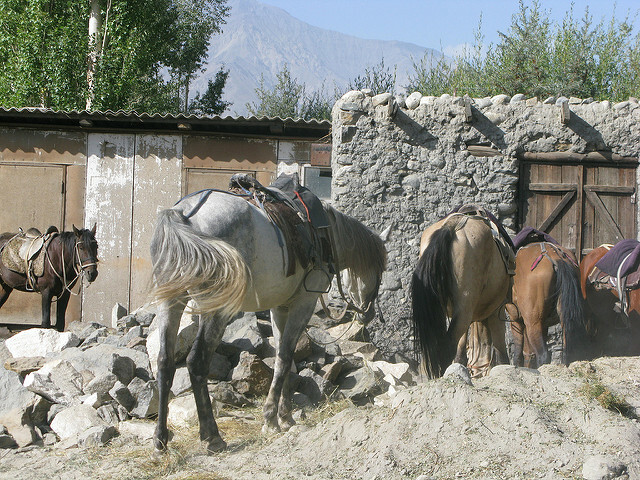 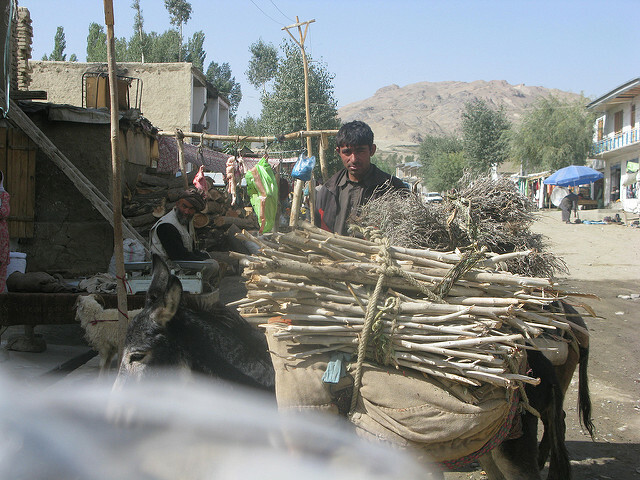 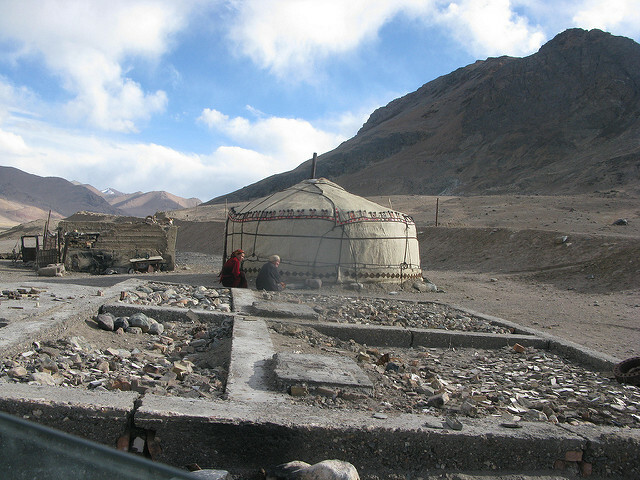 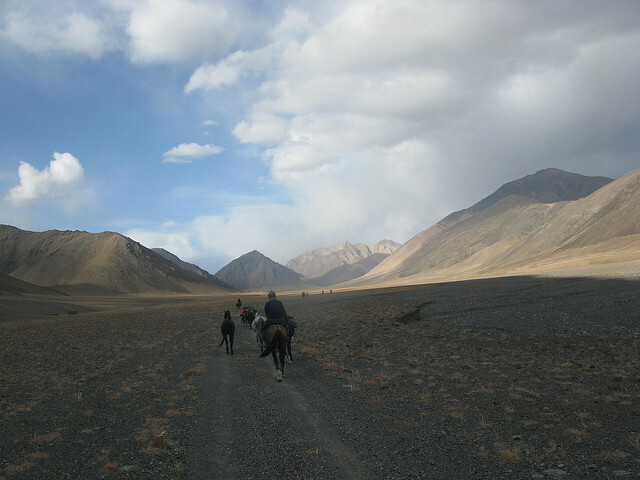 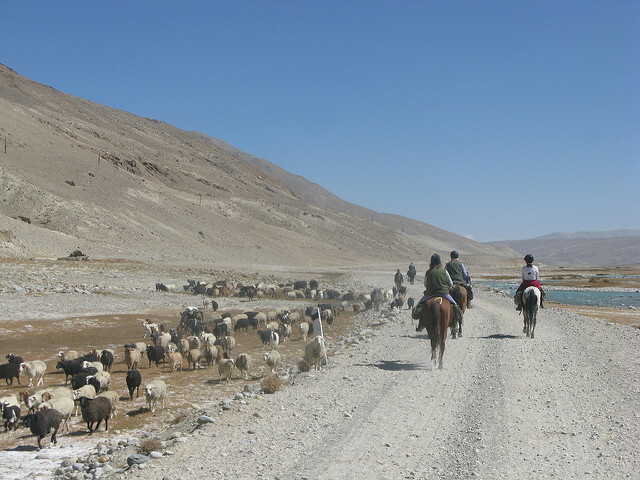 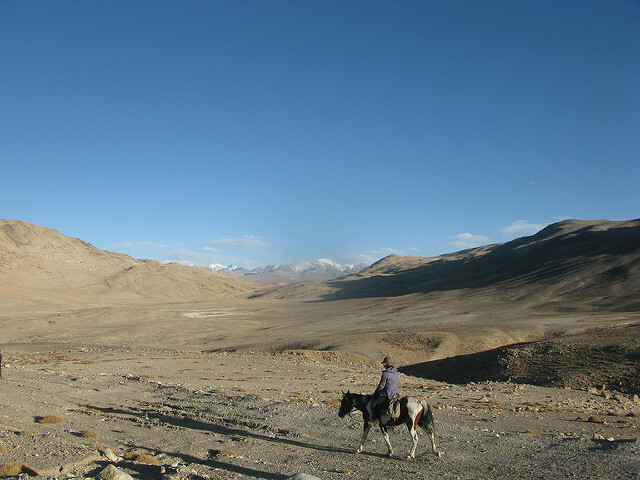 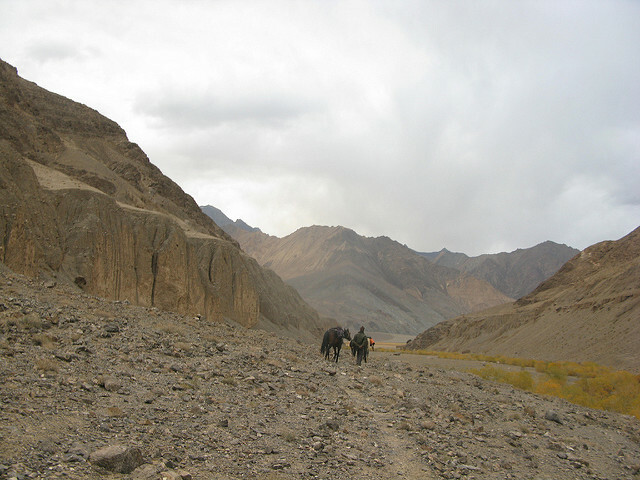 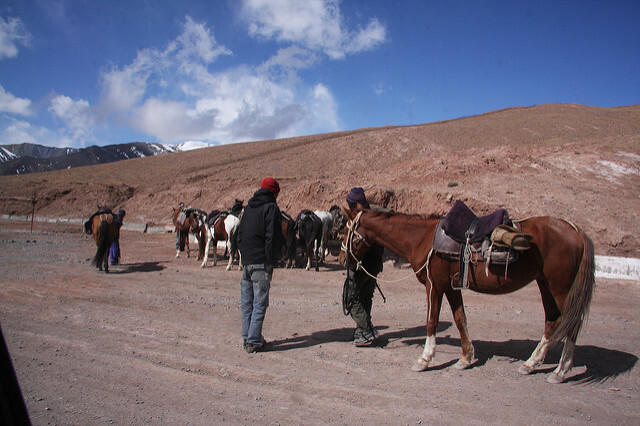 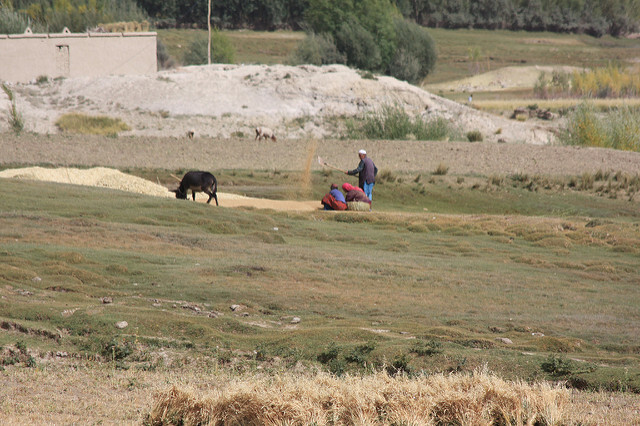 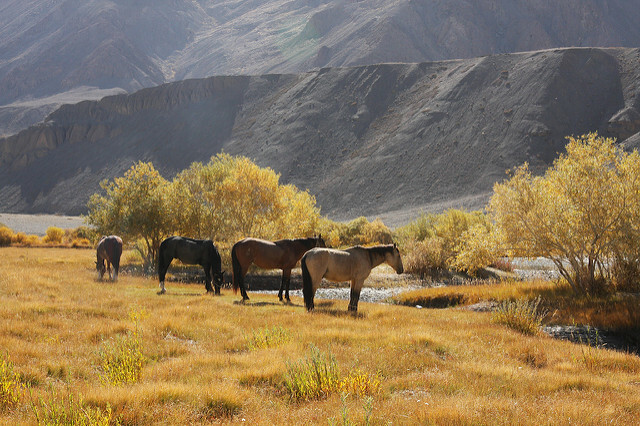 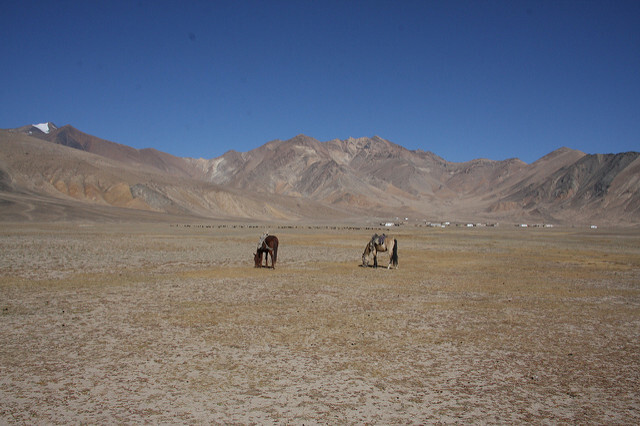 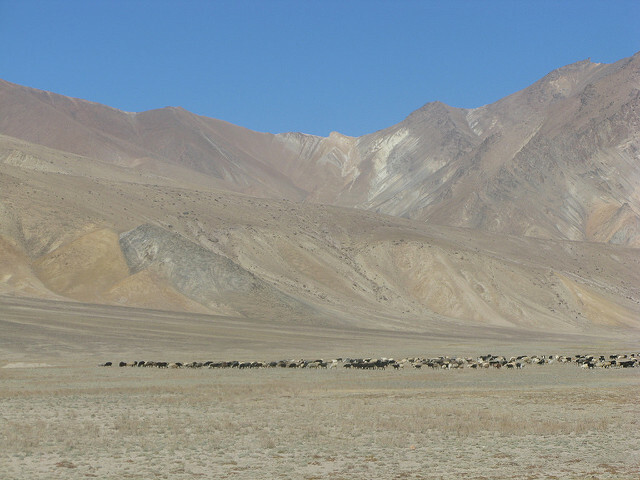 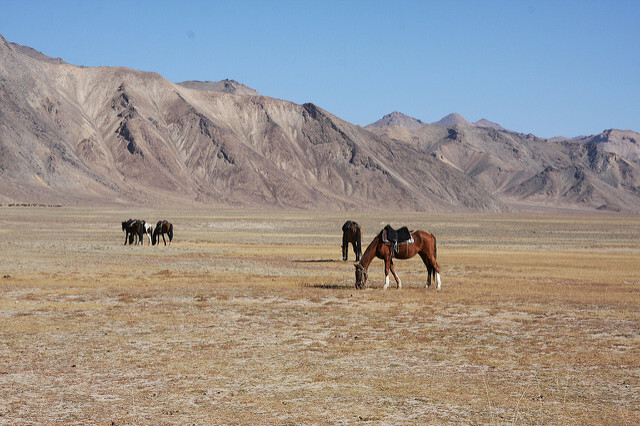 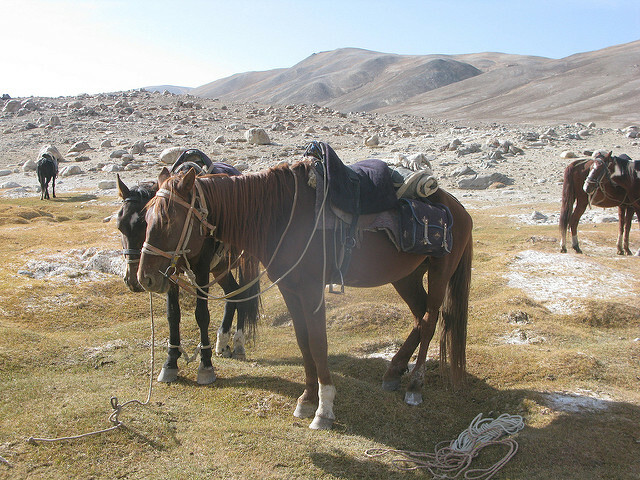 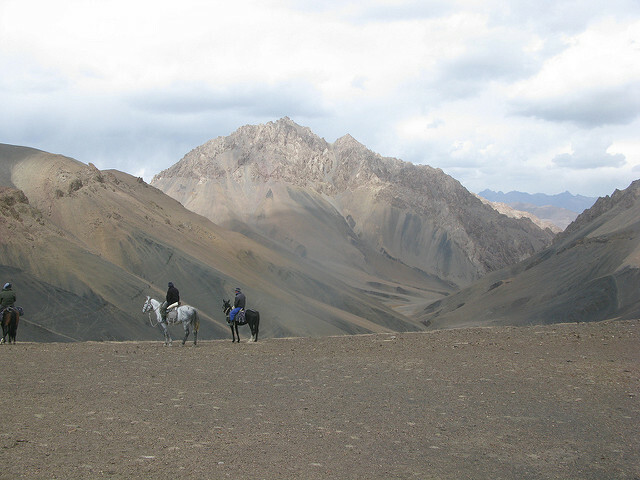 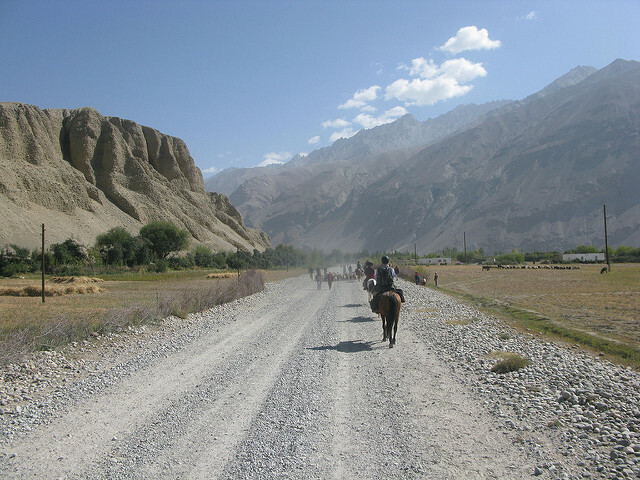 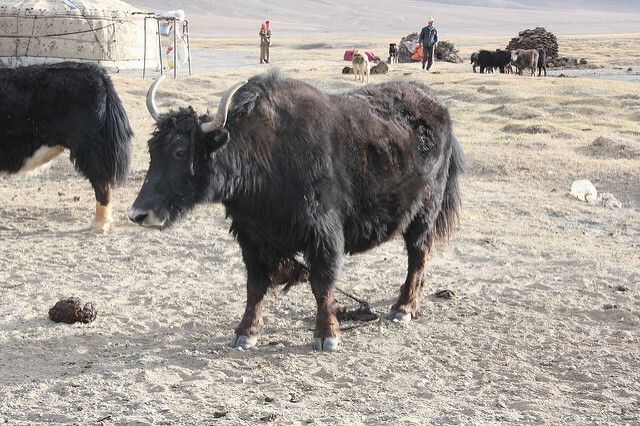 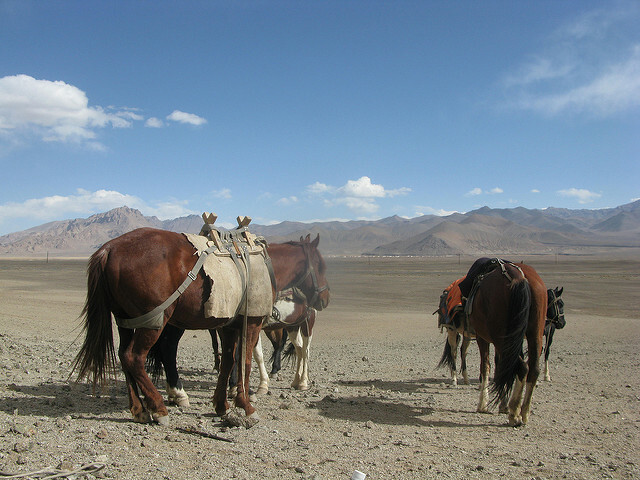 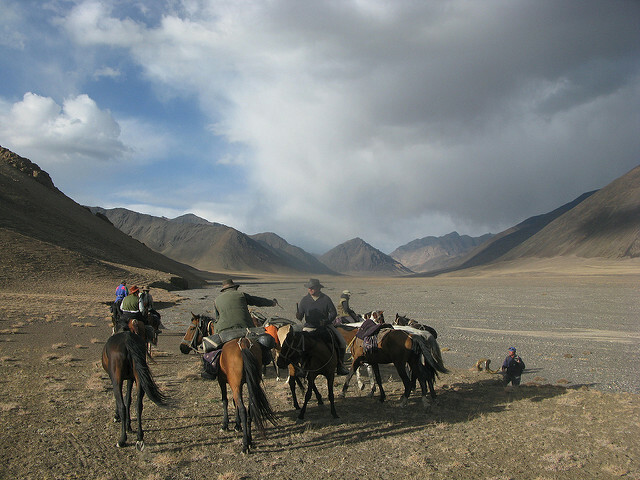 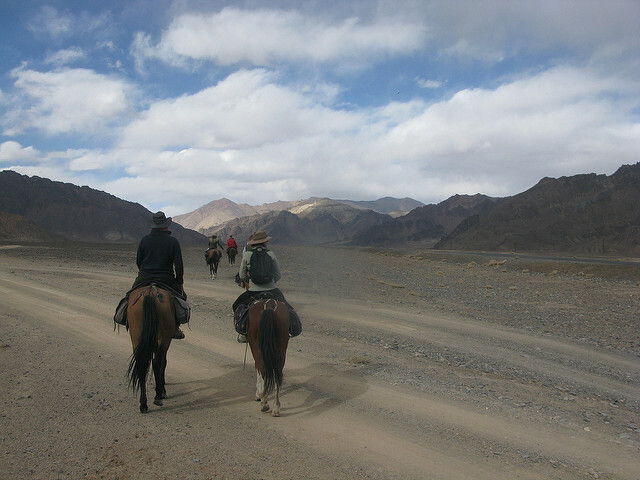 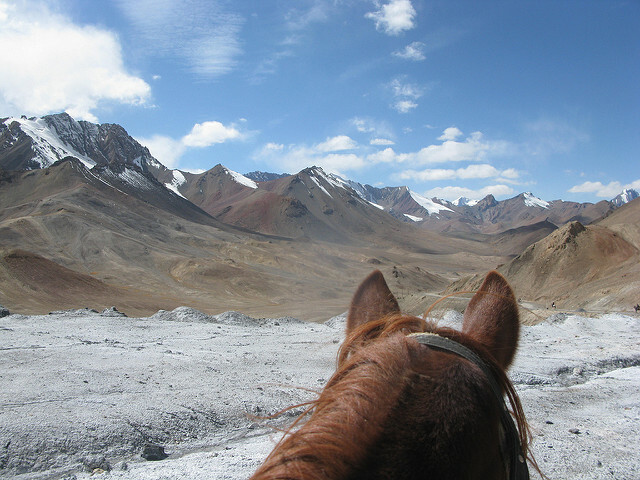 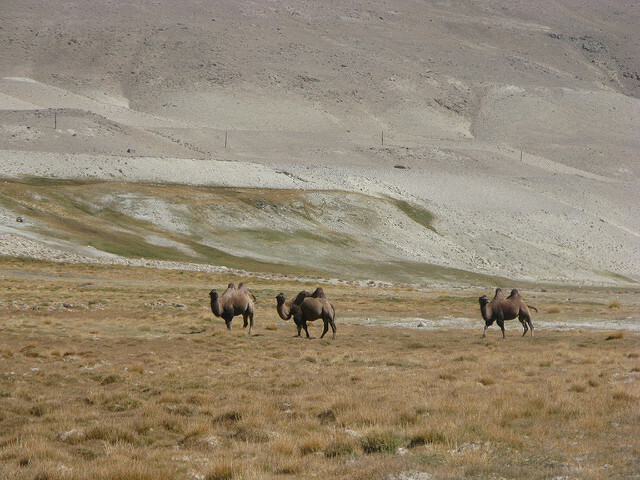 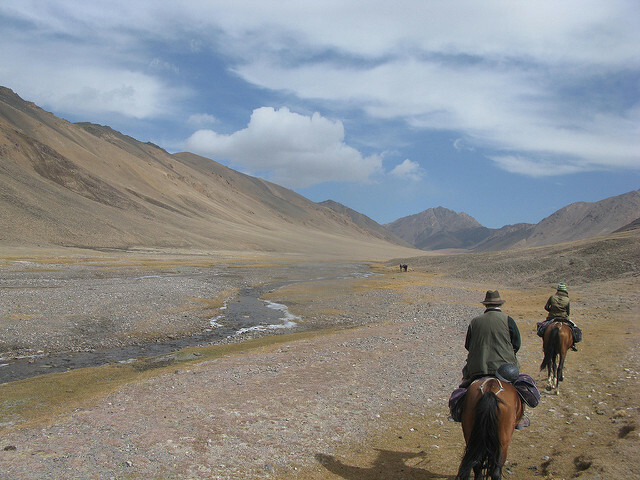 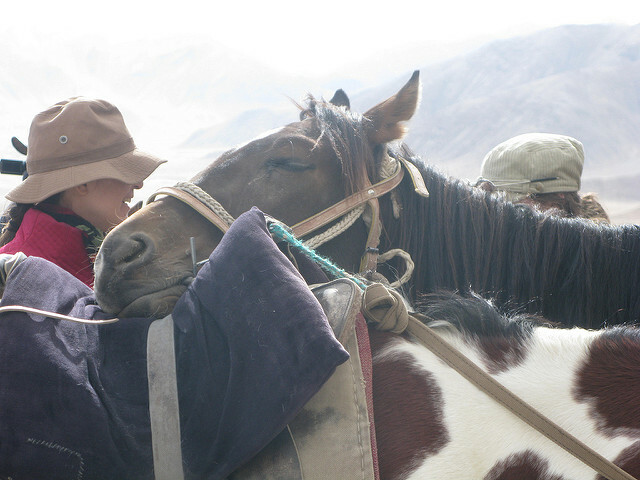 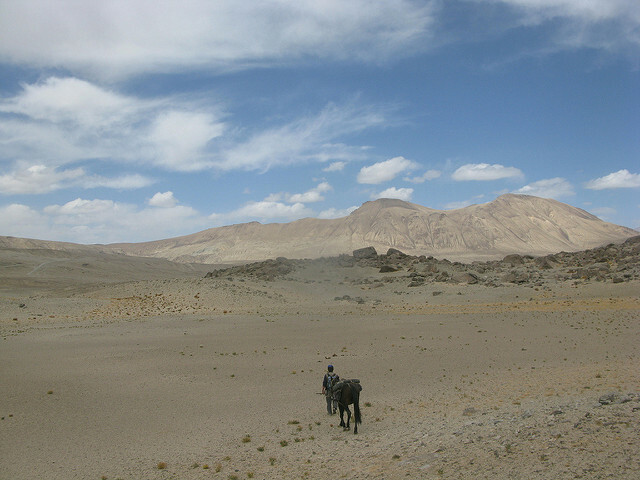 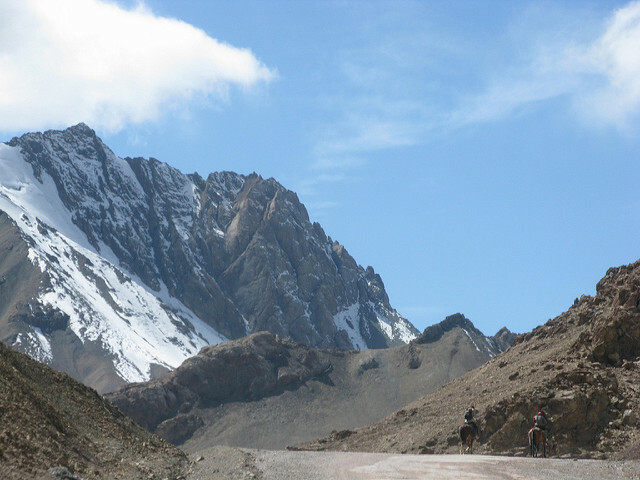 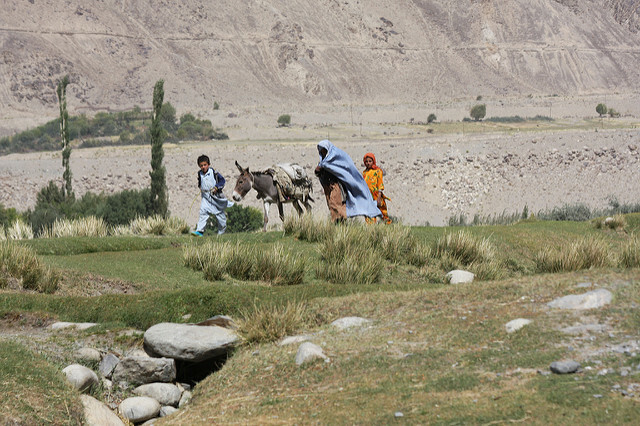 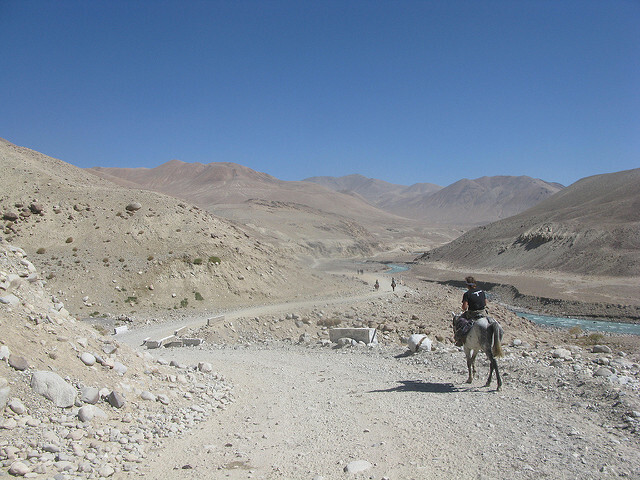 The grooms brought the horses arriving at Karakul after spending two more nights beside the road. 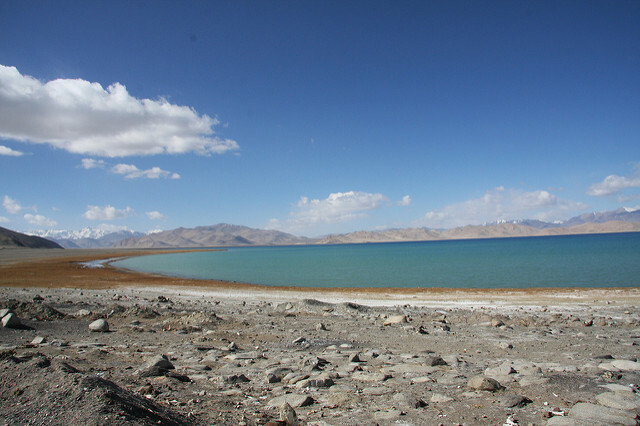 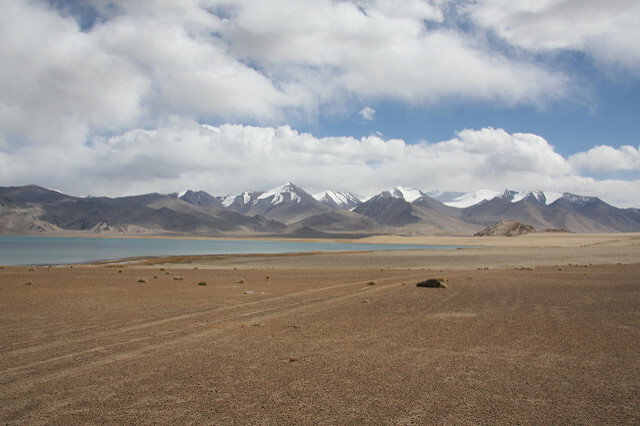 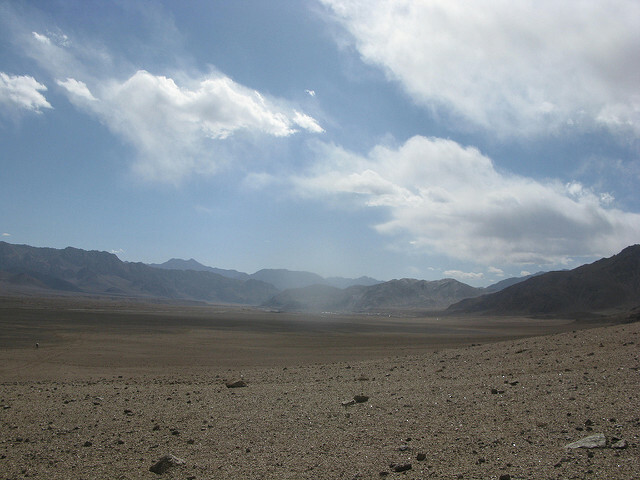 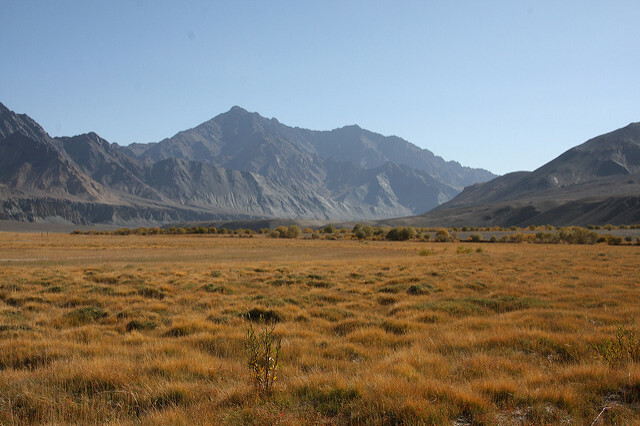 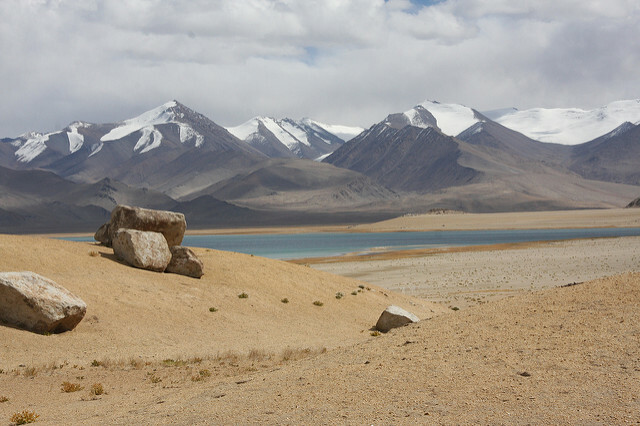 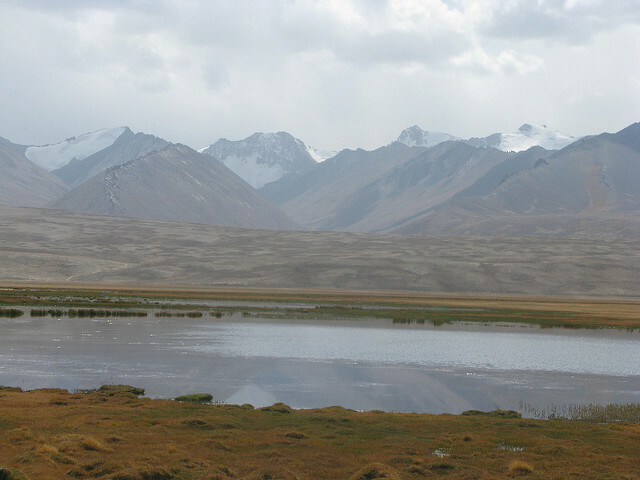 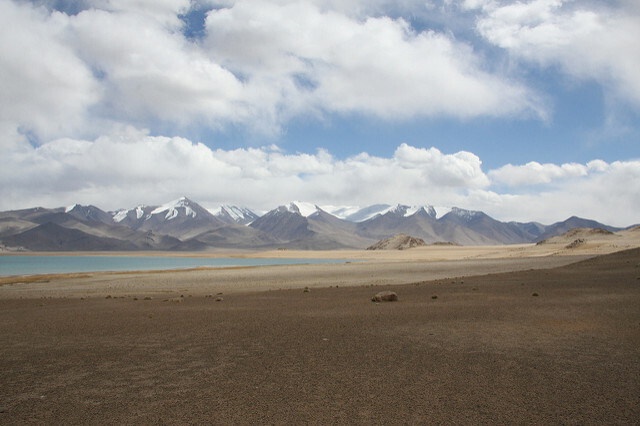 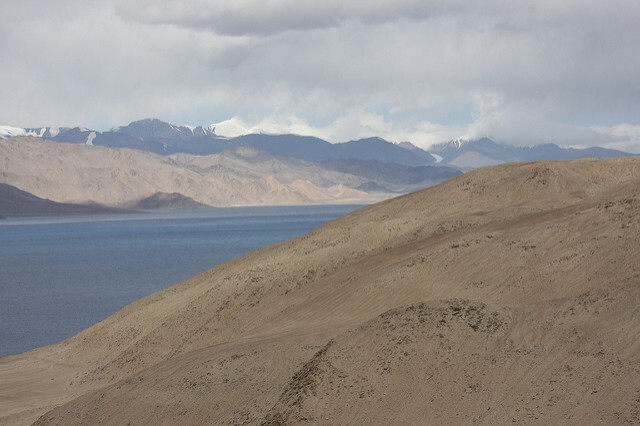 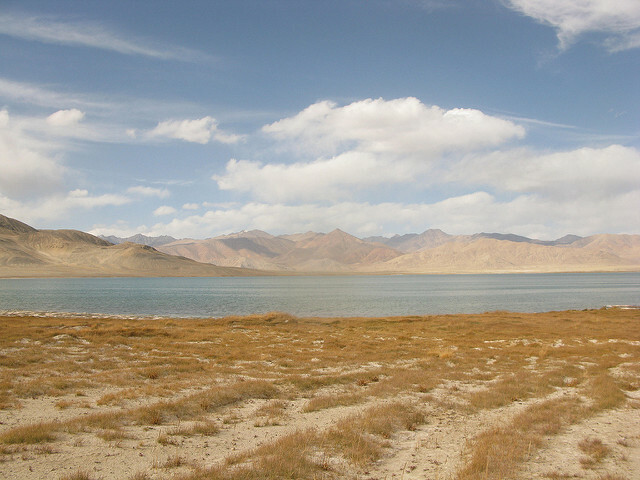 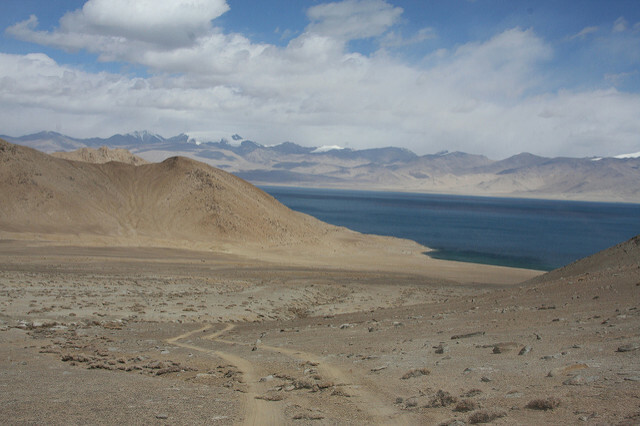 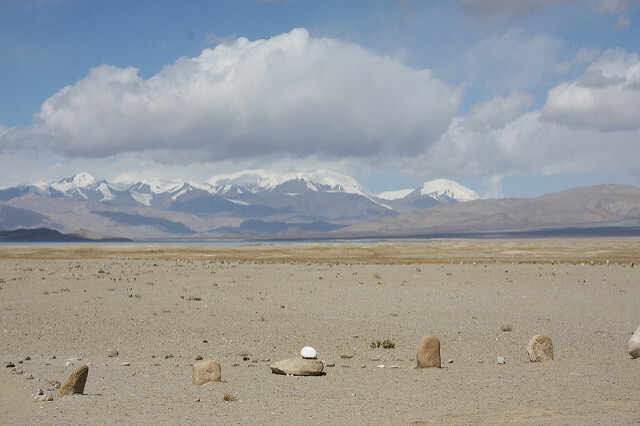 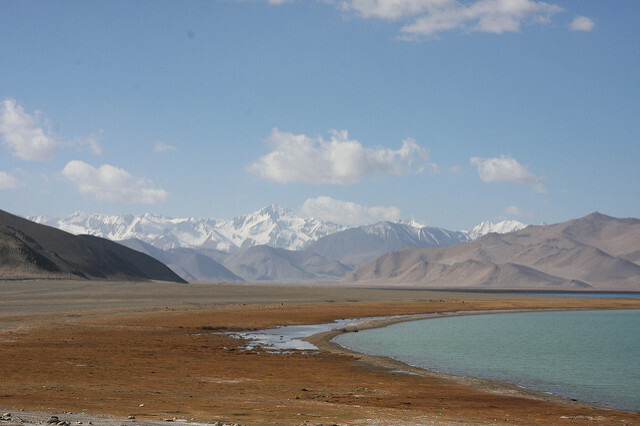 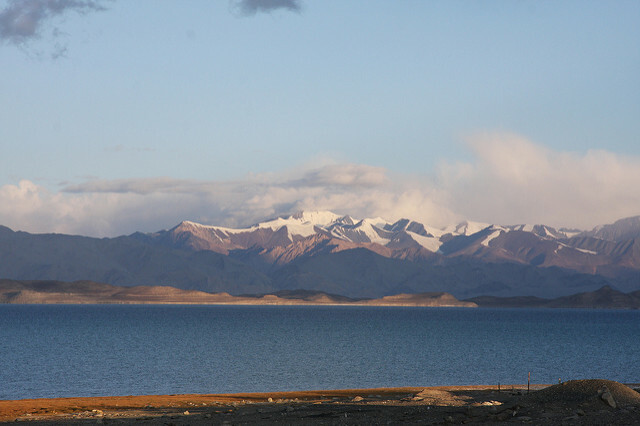 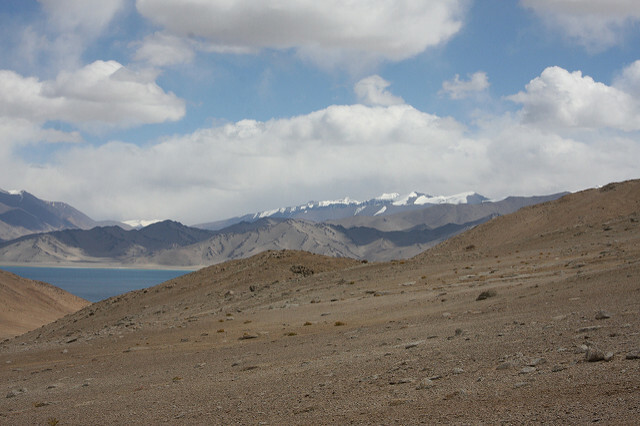 Karakul Lake was created by a meteor about ten million years ago. 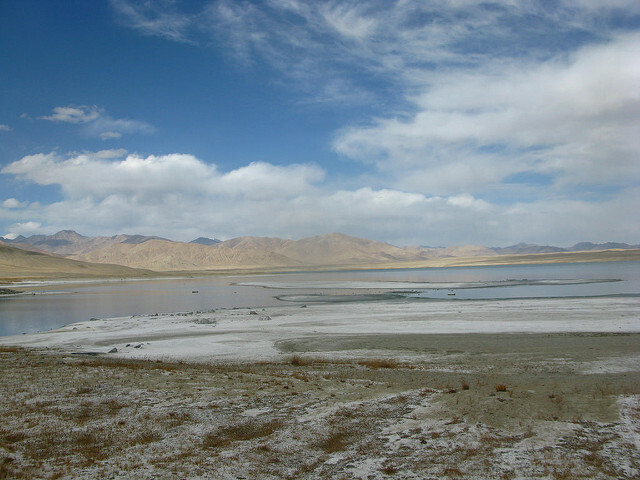 The lake is lifeless and salty with ice and snow covering it until late May. 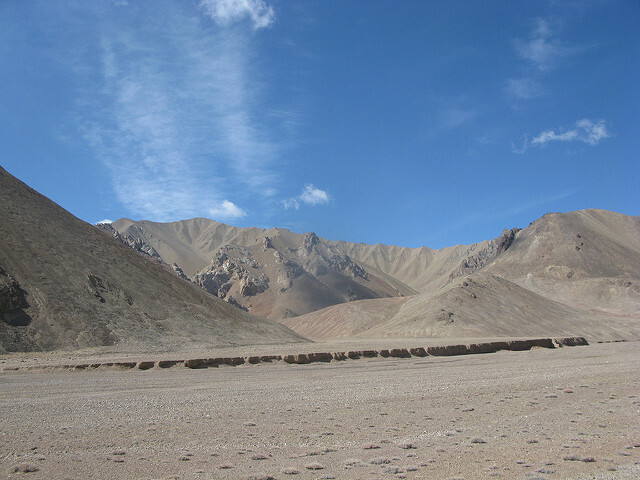 After a late breakfast we drove to walk around a Solar Calendar. 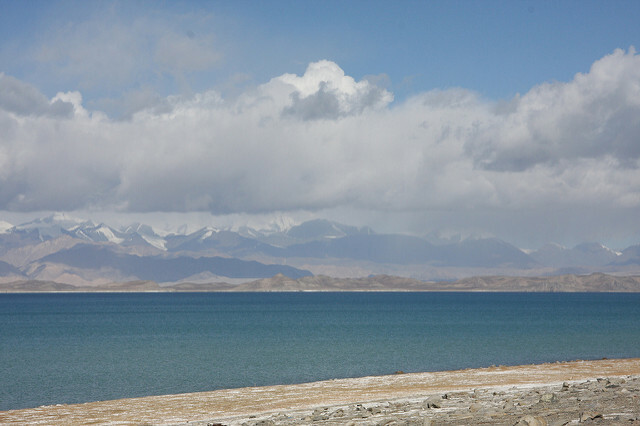 Then we drove around the lake and up to a view point overlooking the lake. 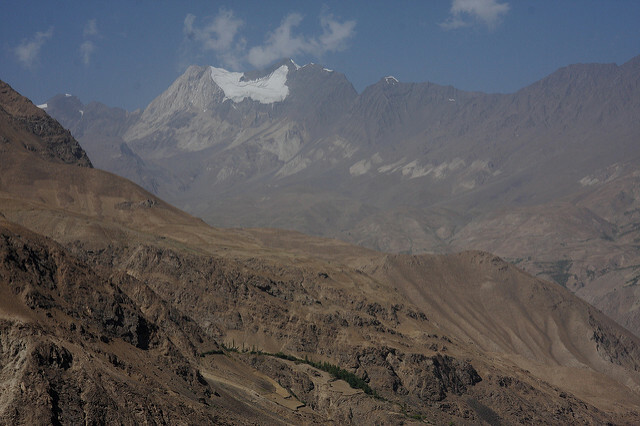 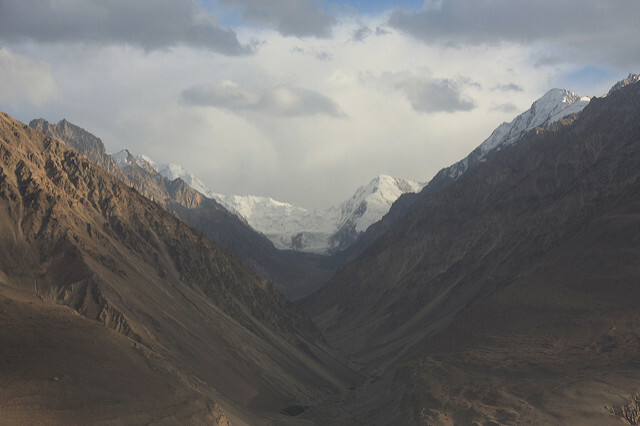 From Karakul we had good views of Zartash Peak and North Muzkol Peak. 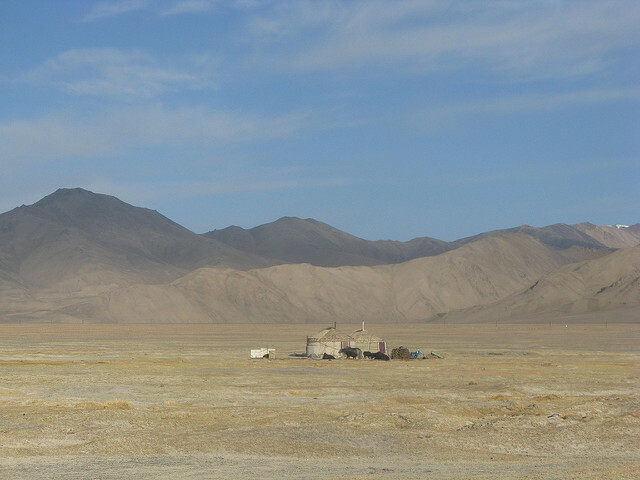 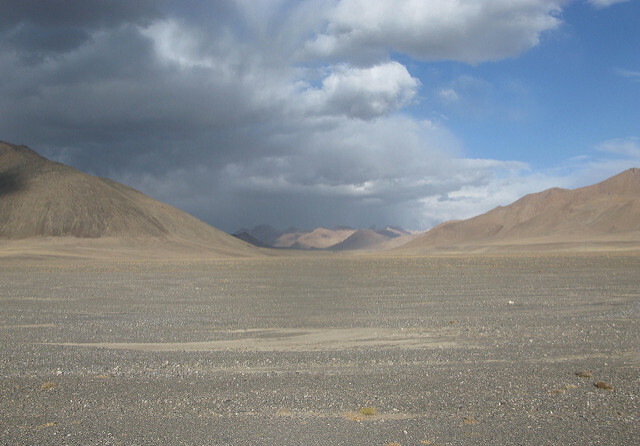 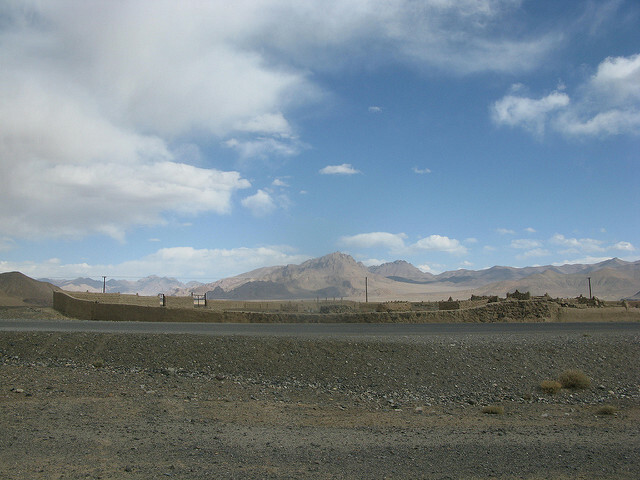 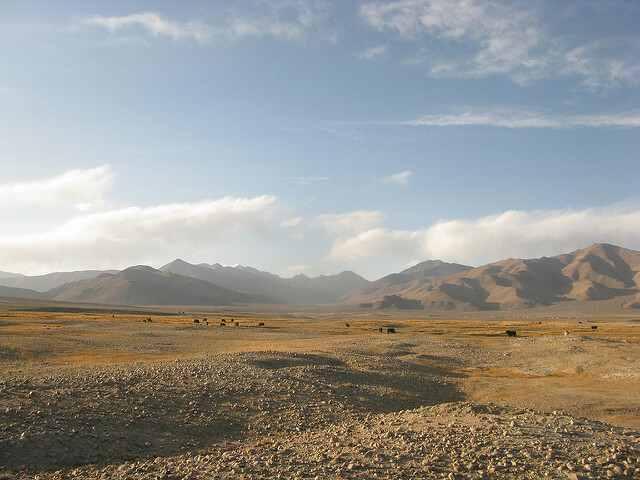 We left Karakul at 0930 to drive to the Tajikistan border. 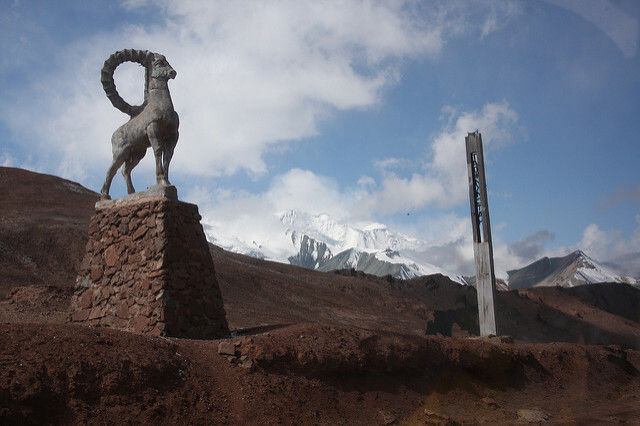 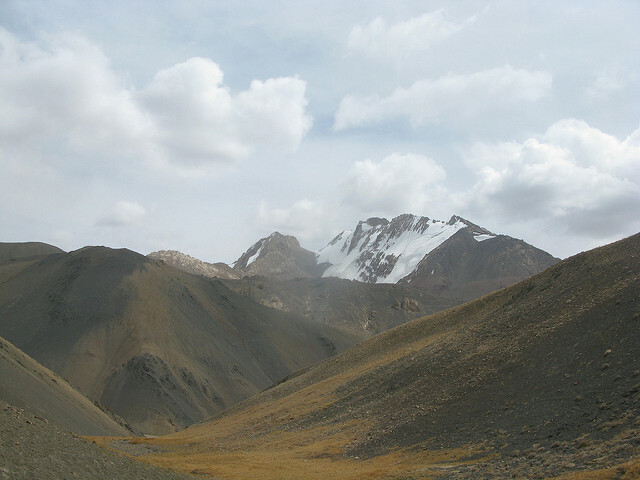 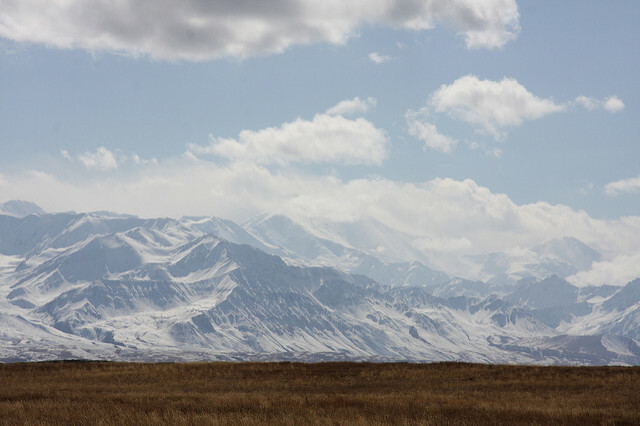 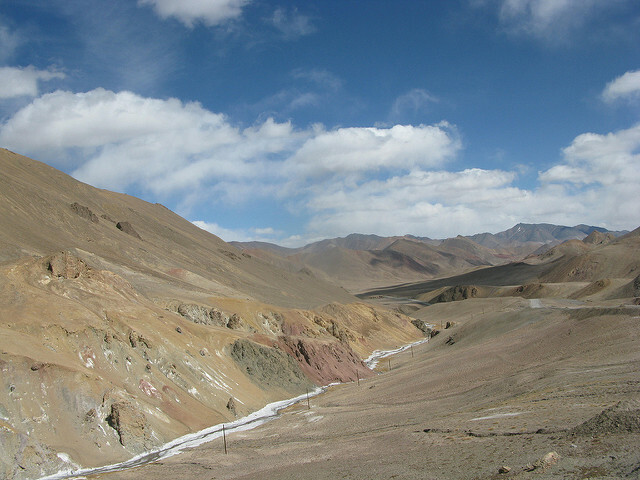 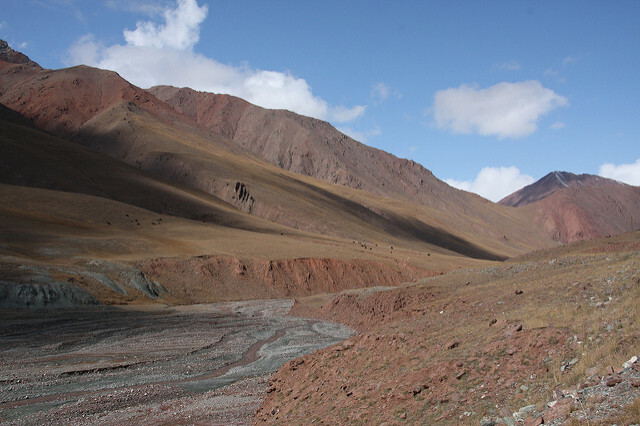 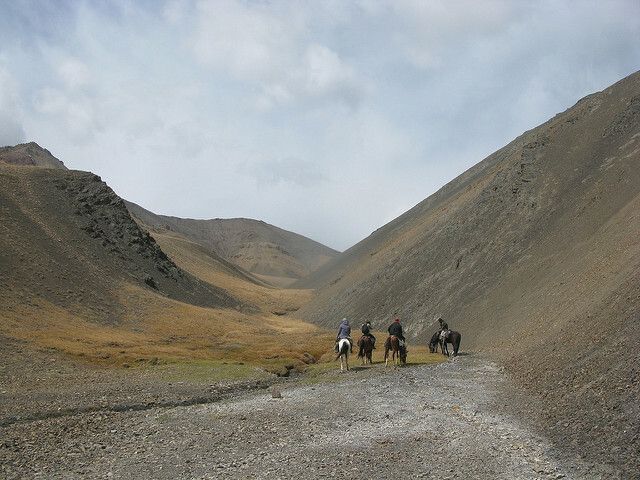 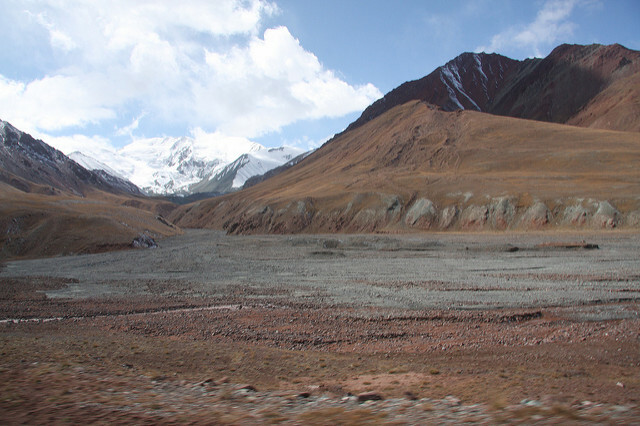 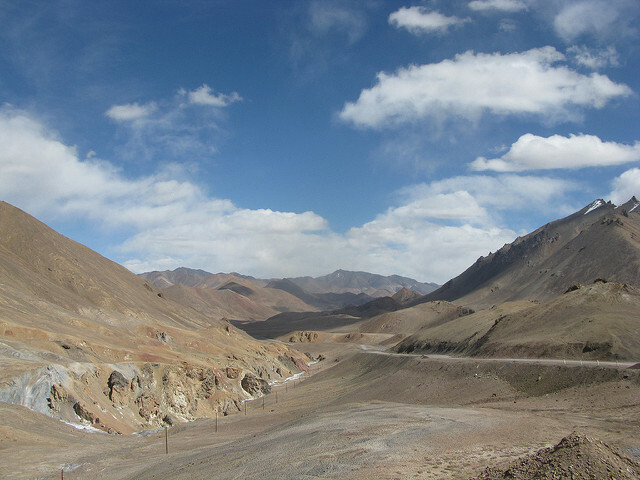 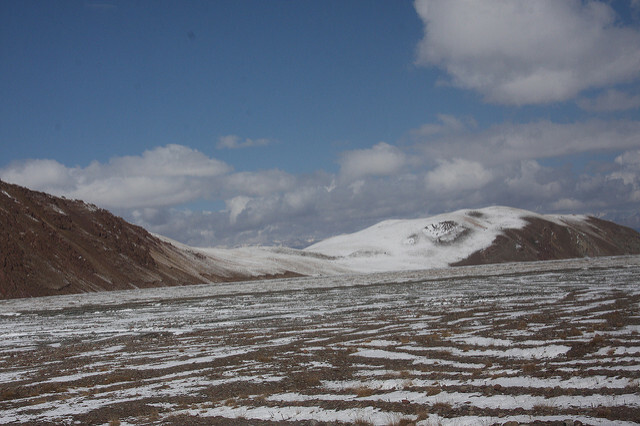 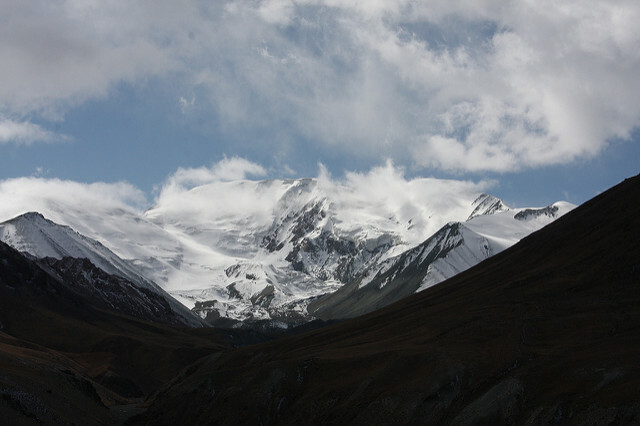 After waiting for the horses to arrive we crossed the border and drove over the Kyzyl-Art Pass (4282m). 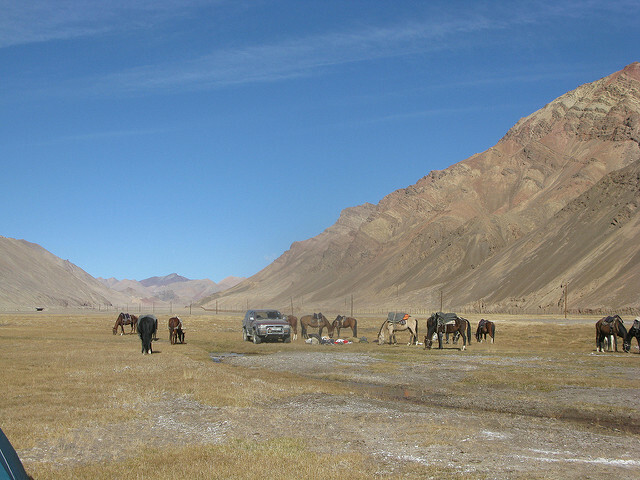 At the Kyrgyzstan border, 20 kms further along the road, we again had to wait for the horses before driving down into the valley at Sary Tash where we had a late lunch. 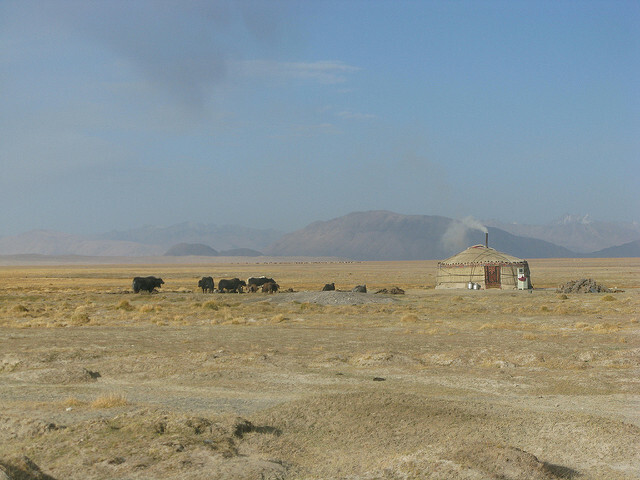 In Sary Tash we eventually managed to get fuel (there was no electricity for the pumps) and continue on our way to Osh where we arrived at 2200 hours. 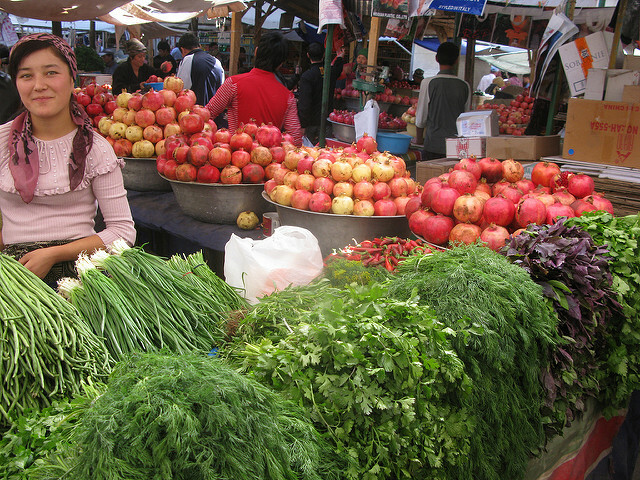 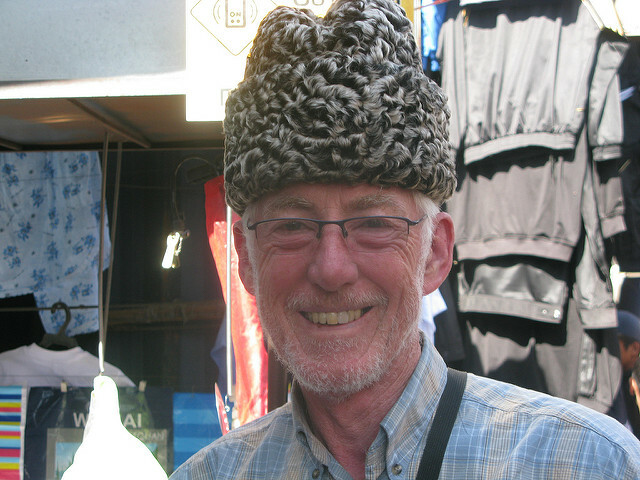 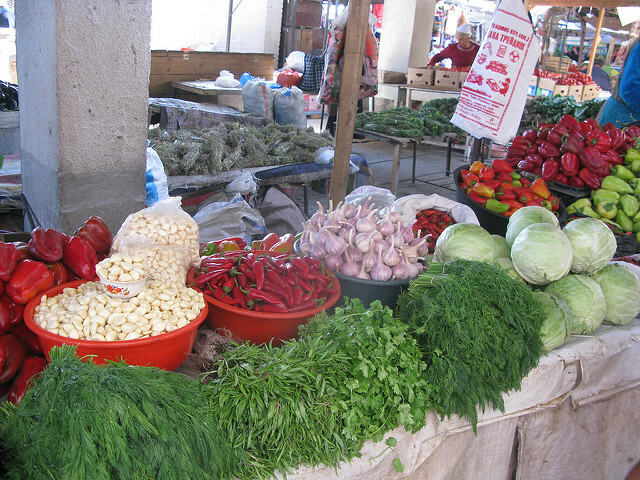 In the morning we walked around the Osh Bazaar before having lunch. 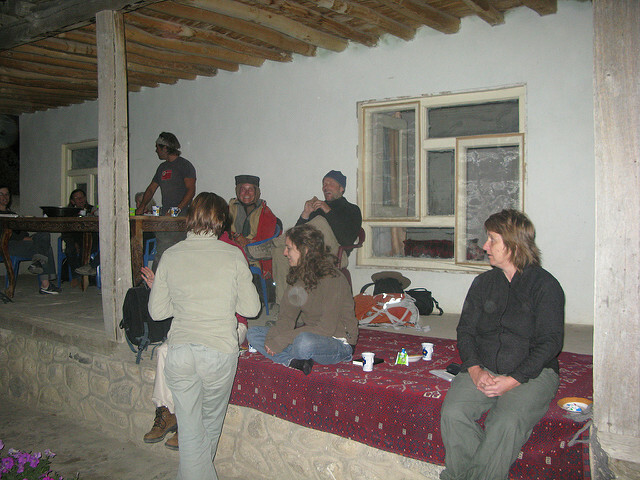 At 1600 hours we left for the airport and our flight to Bishkek. 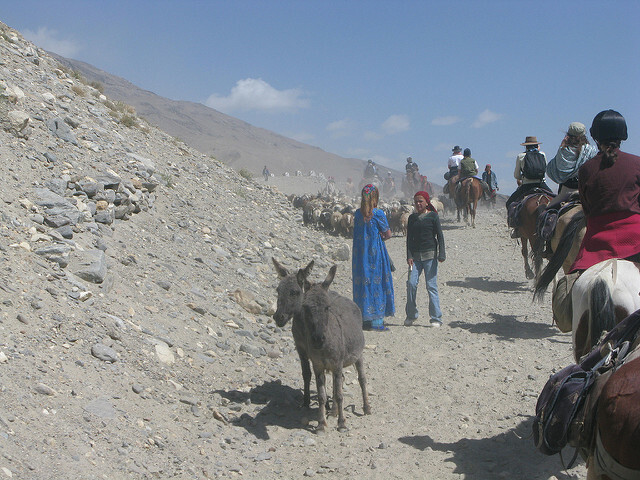 A day of shopping and sightseeing with Nageisa, Domenico's wife. 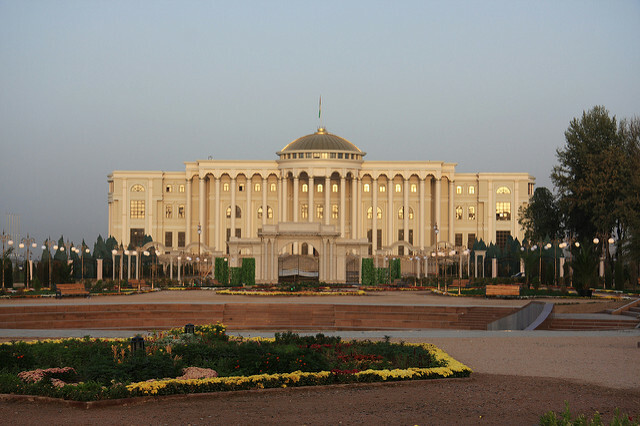 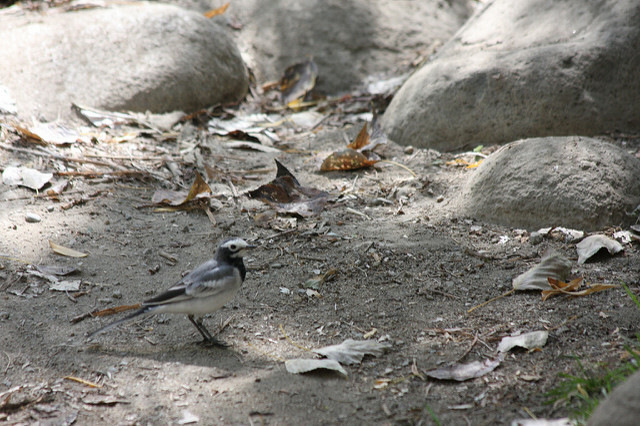 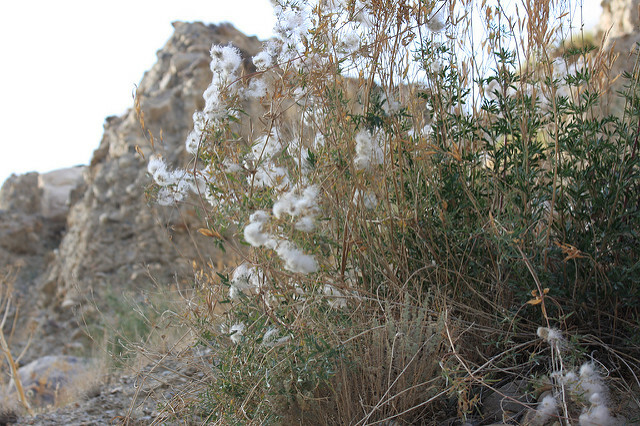 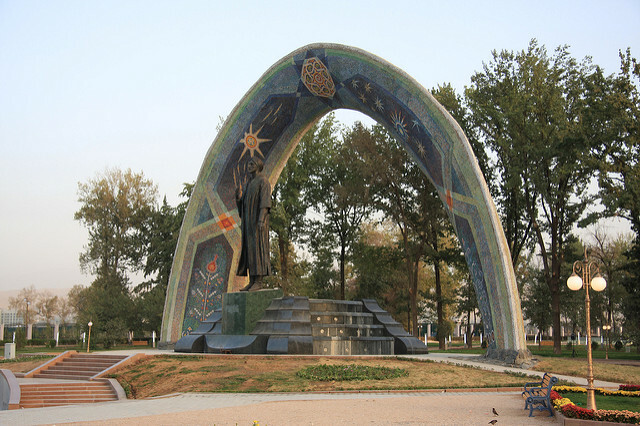 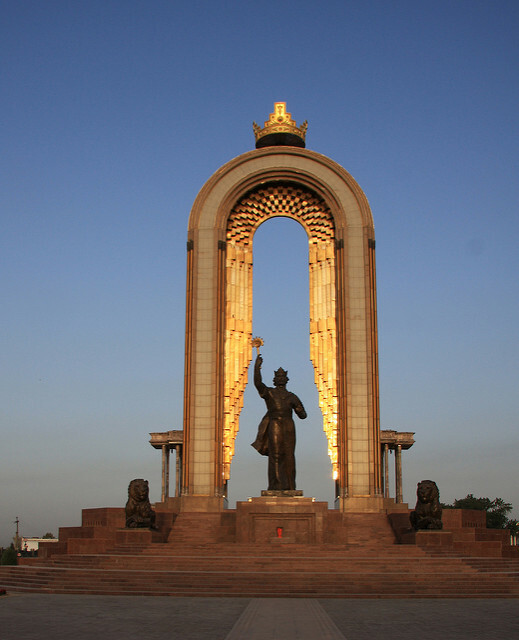 Photos of Bishkek may be found on Central Asia when I visited Bishkek previously. 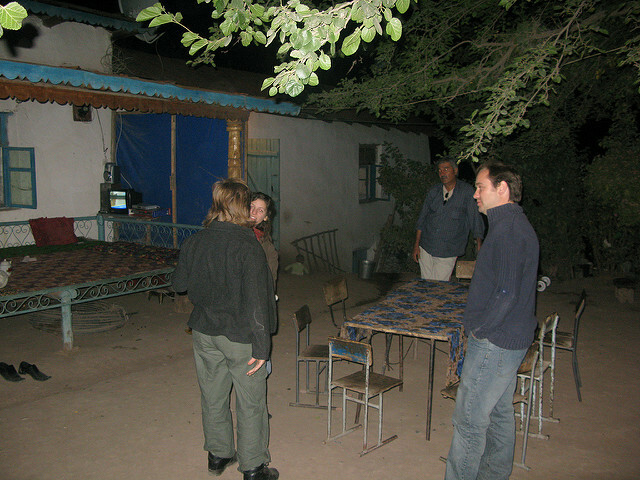 After a power cut during our farewell meal the night before we were up at 0300 hours for our taxis to the airport and flights to London via Istanbul.